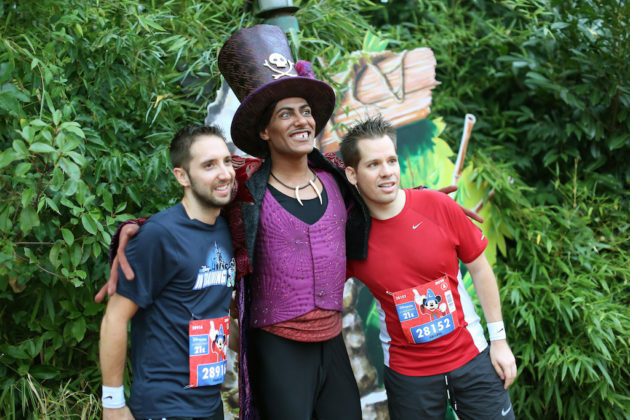 My first experience with runDisney was way back in 2012 for the Tower of Terror Inaugural 10 Miler at Hollywood Studios. 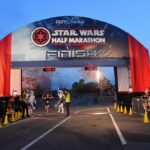 It was just enough race to be a significant challenge that didn’t seem impossible, plus it was a night race so that was awesome. 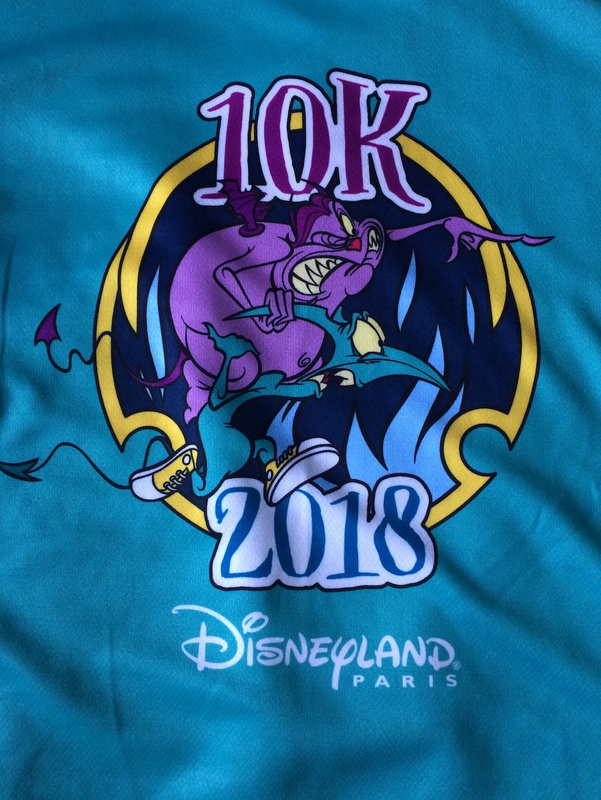 The 10 Miler was a great introduction to long(er) distance racing for me and I haven’t looked back. 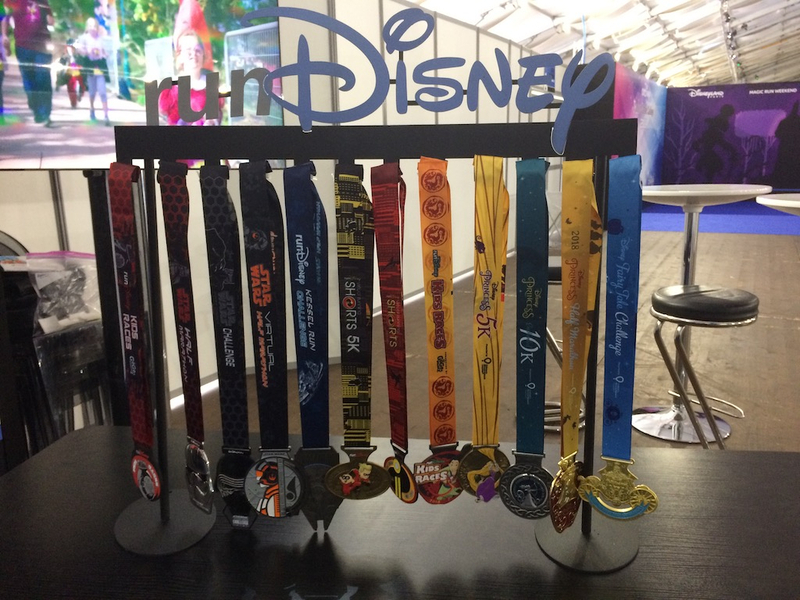 I’ve done one runDisney event each year for the past six years and I have no plans of stopping anytime soon. 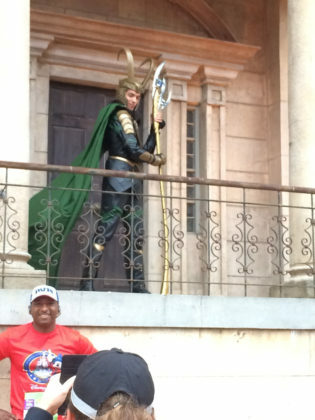 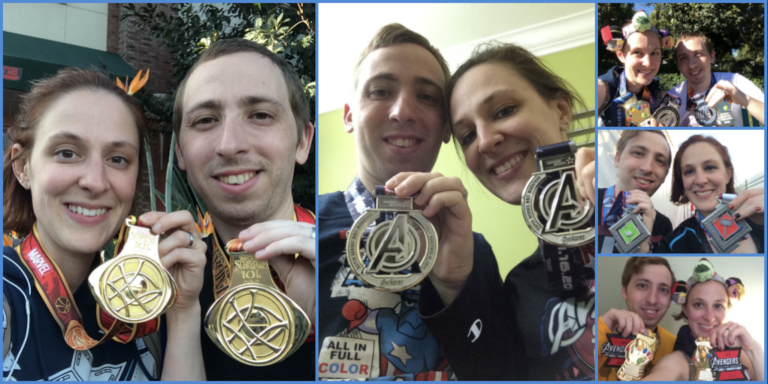 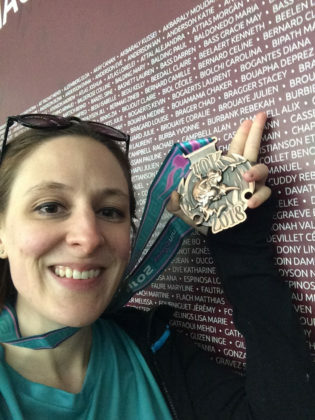 My first half marathon was the Wine and Dine in 2013 and my first two-race challenge was the Infinity Gauntlet Challenge in 2015. 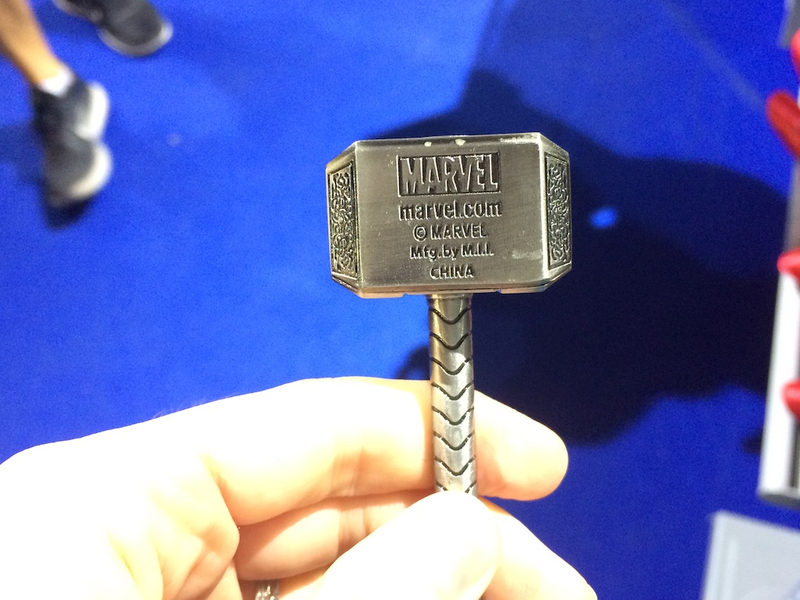 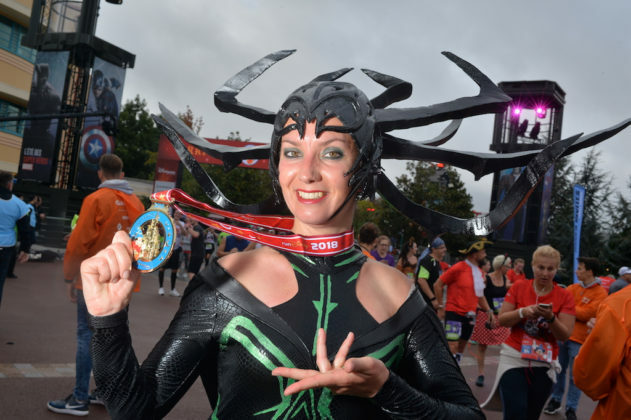 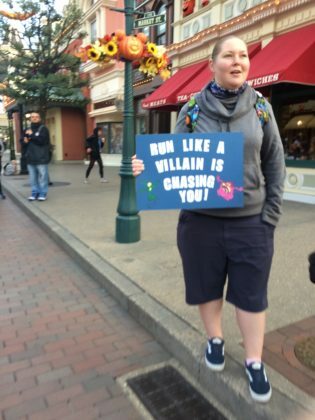 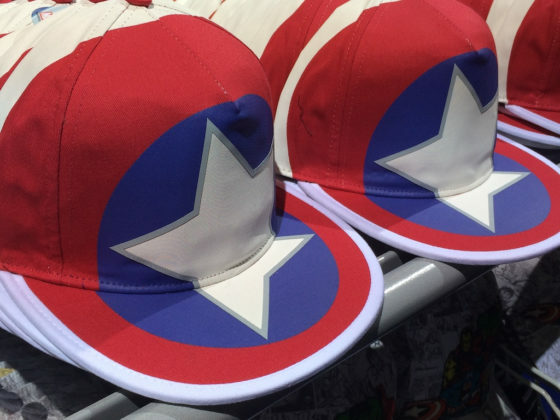 Last year, Disneyland announced they were taking away my Superheroes Race weekend (I’m still bitter, ask me about it sometime) and I thought for sure I wasn’t going to race in 2018. Then the stars aligned. 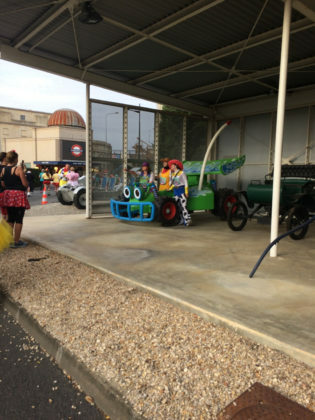 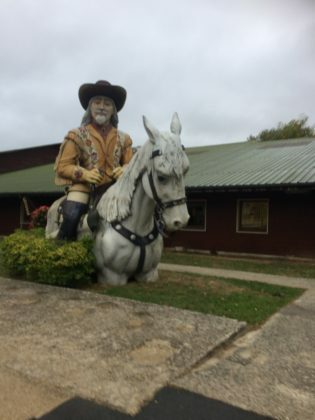 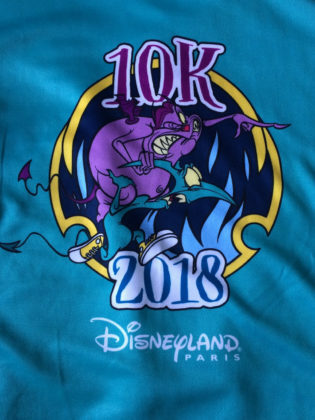 Laughing Place scheduled me to cover a separate event in Paris and out of curiosity I checked to see if bibs were still available for their race. They were! 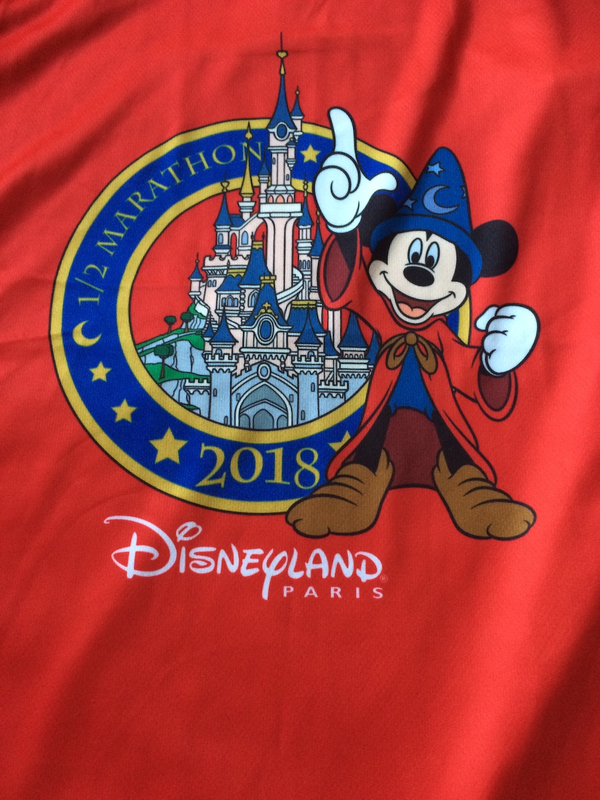 This meant going a week early, and I jumped at the chance. 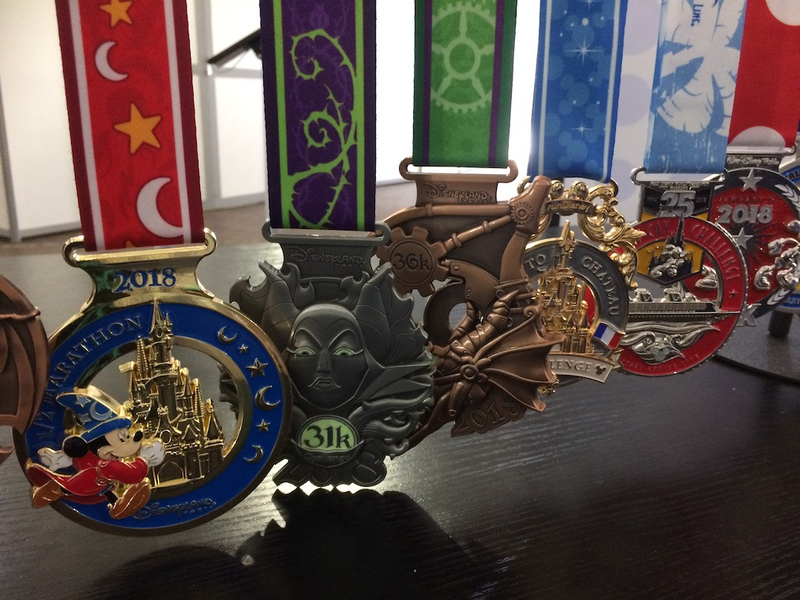 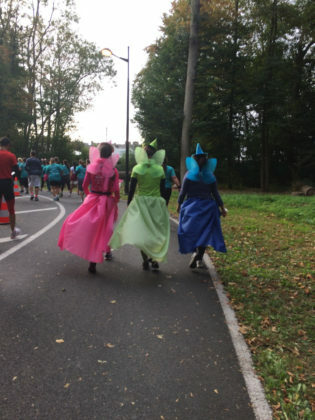 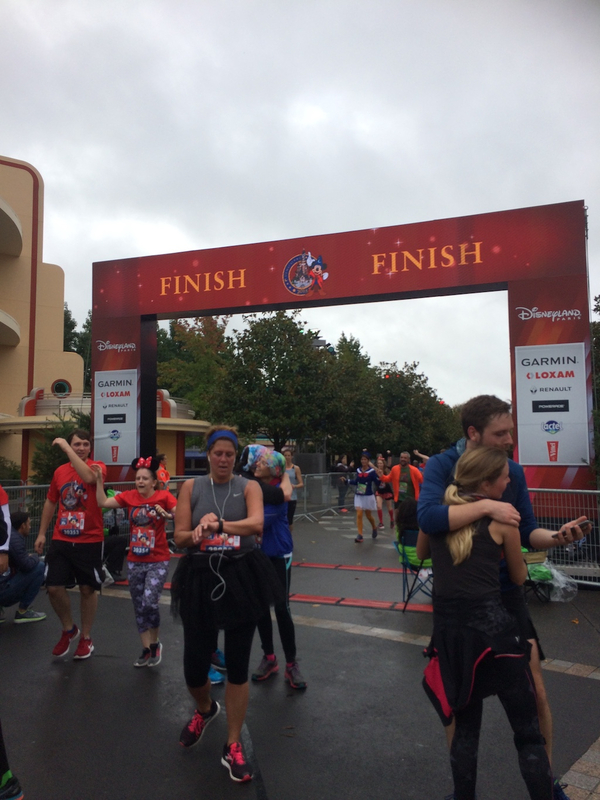 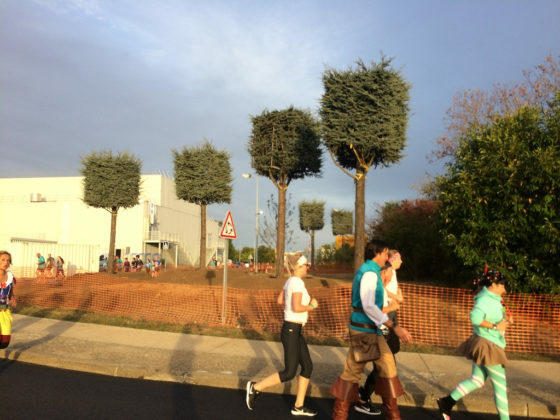 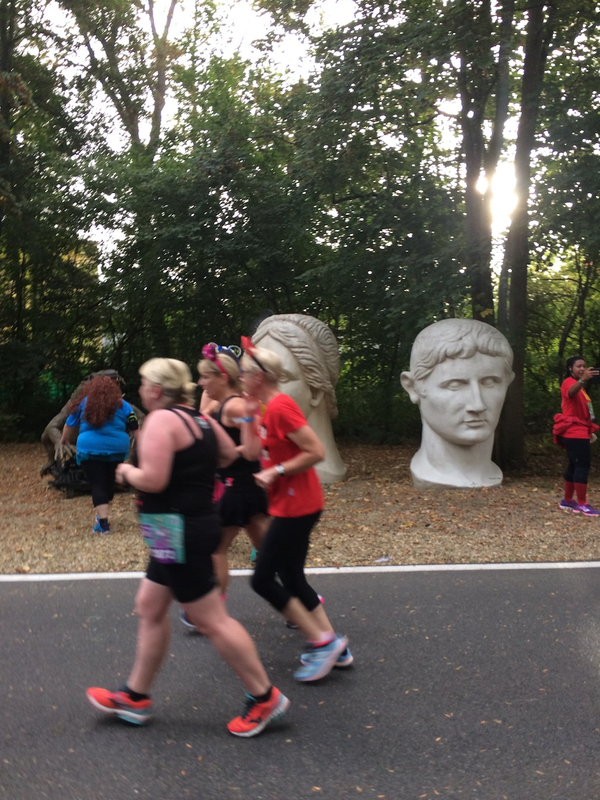 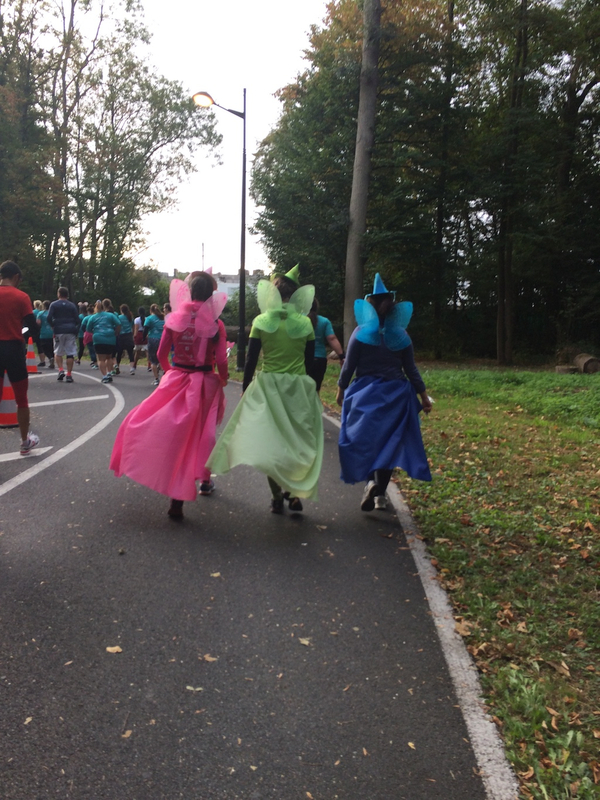 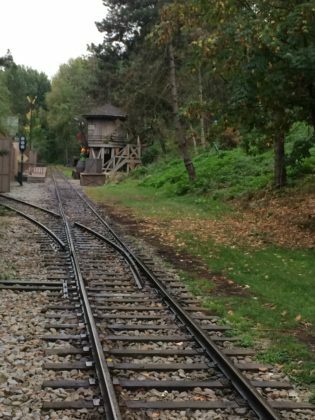 Last weekend, I ran the 31k Challenge (19.3 miles), which consisted of the Disneyland Paris 10k and the Disneyland Paris Half Marathon. 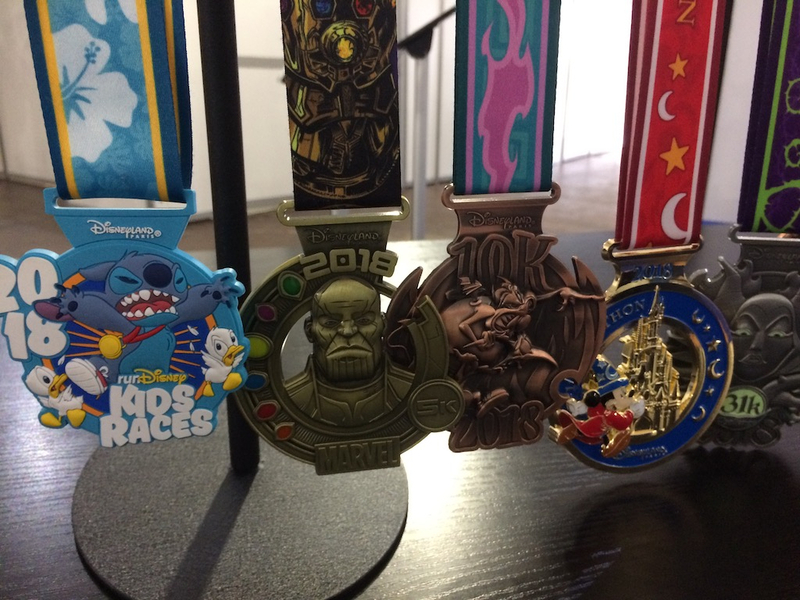 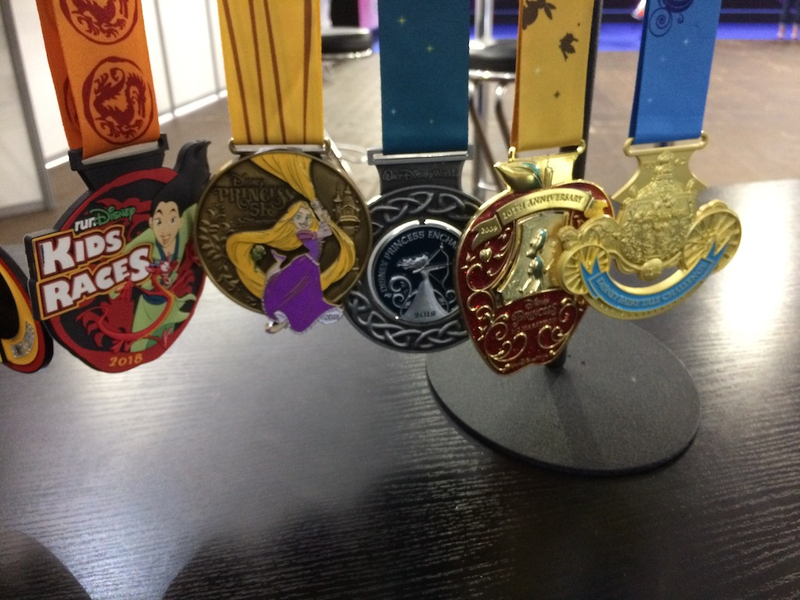 I’ve now participated in runDisney races in Florida, California, and France and each has their own perks. So stick around as I recap and compare this race weekend to the others. 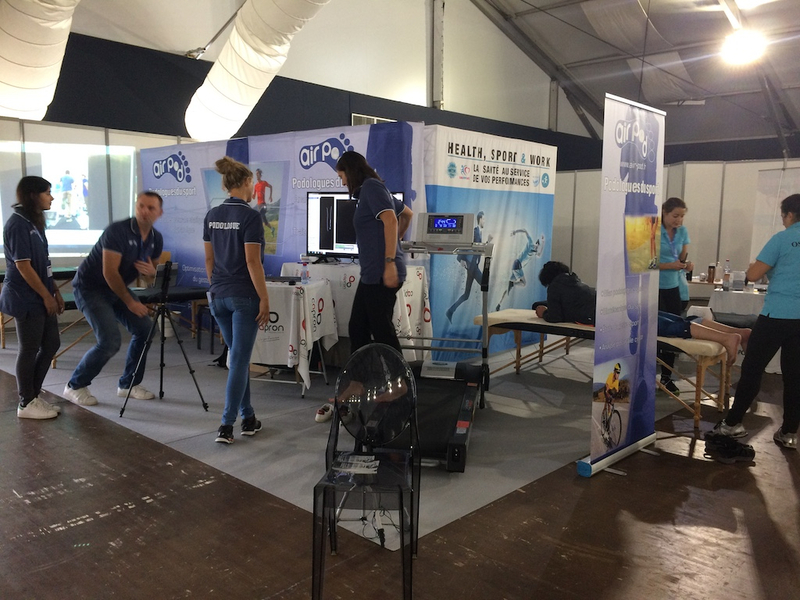 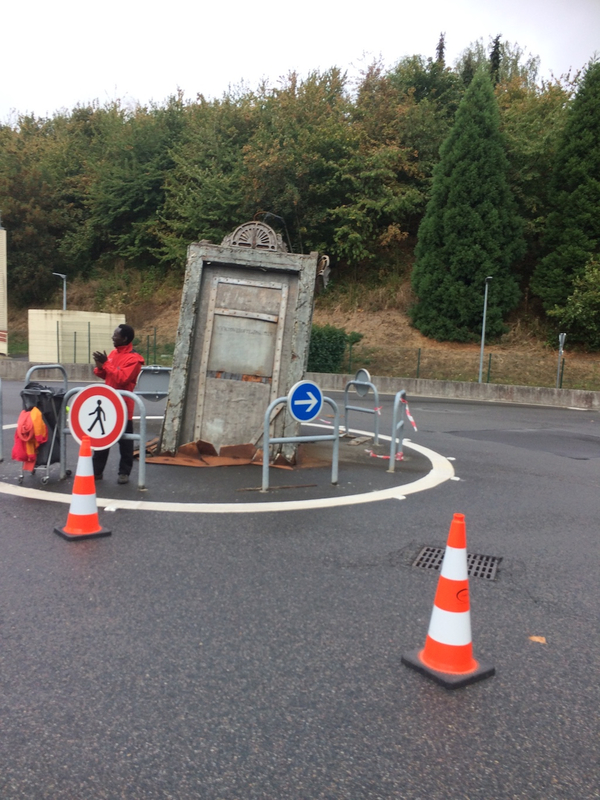 Unlike the United States races, France requires medical approval for runners participating in long distance races. 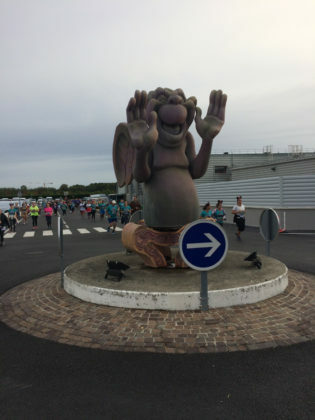 All half marathon runners must have a doctor sign an approval form that’s either in French or shows English and French translation. 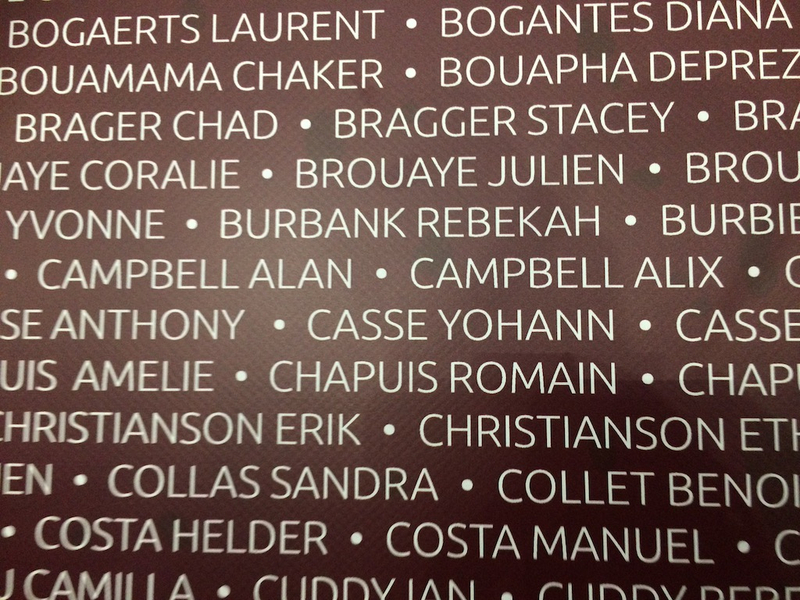 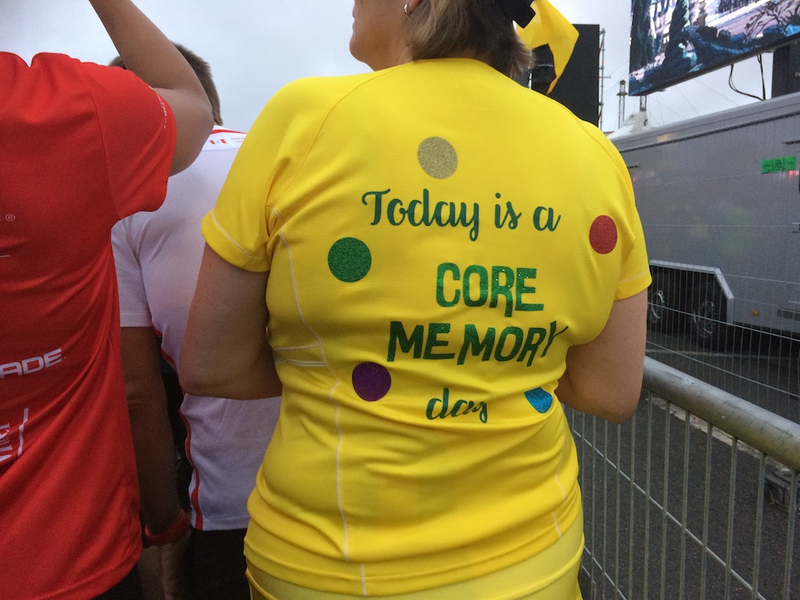 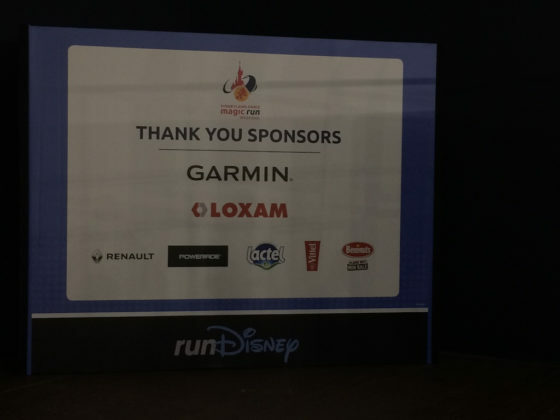 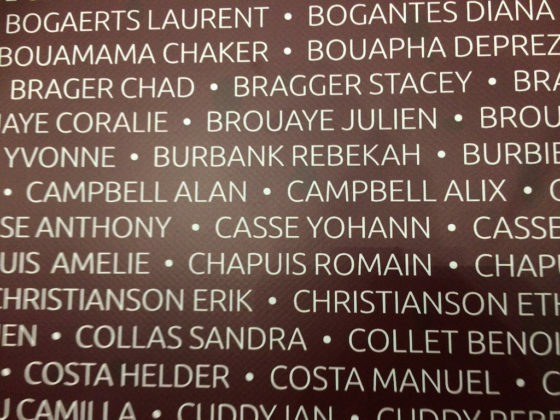 Fortunately, runDisney’s website provided an English/French template for runners to download, print and take to their doctors. 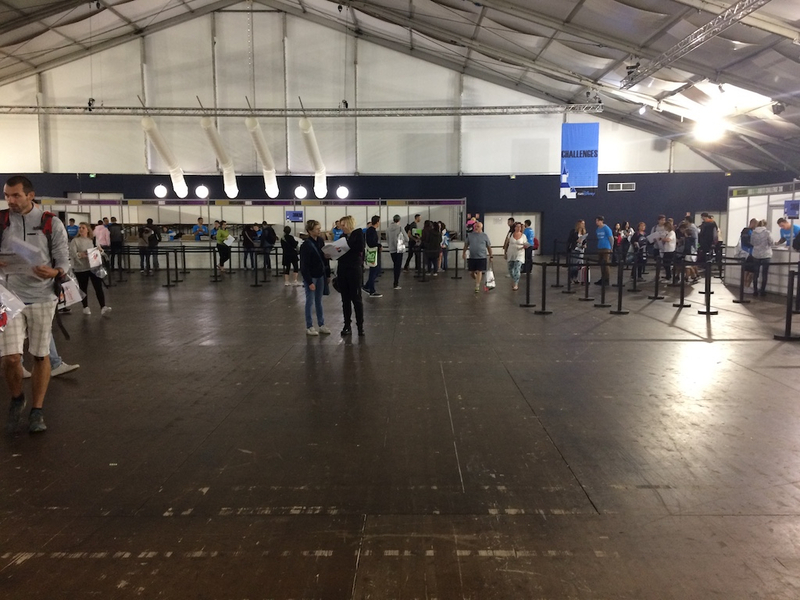 The form needed to be submitted by a certain date to have your registration completed when you arrived for the weekend. 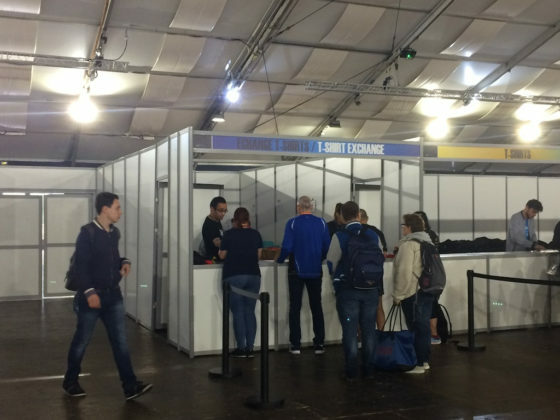 However, if necessary, runners could bring the signed forms to Expo and finalize their registration there. 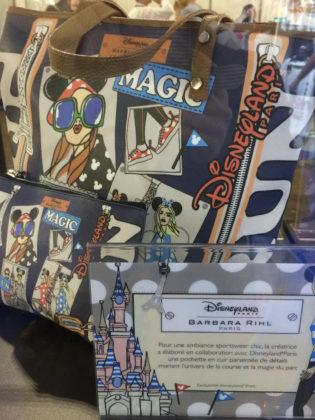 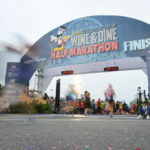 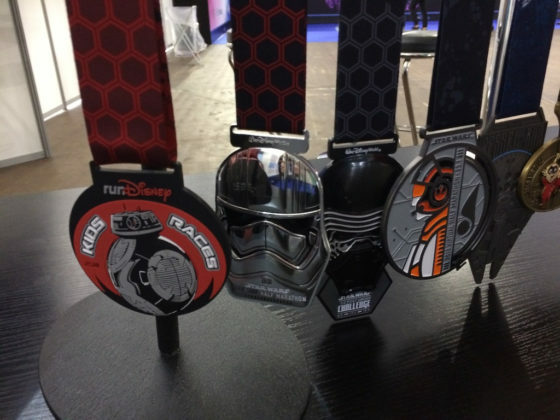 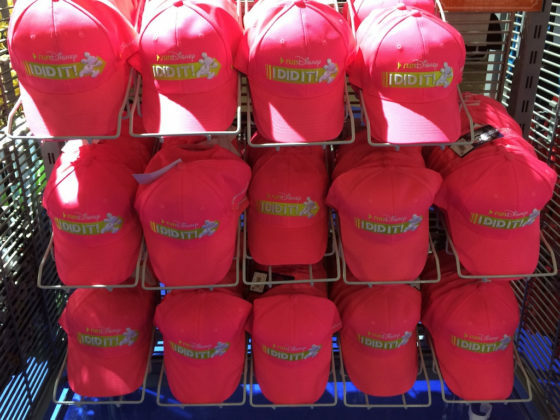 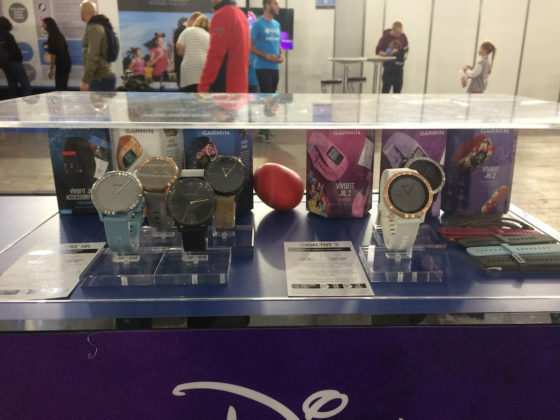 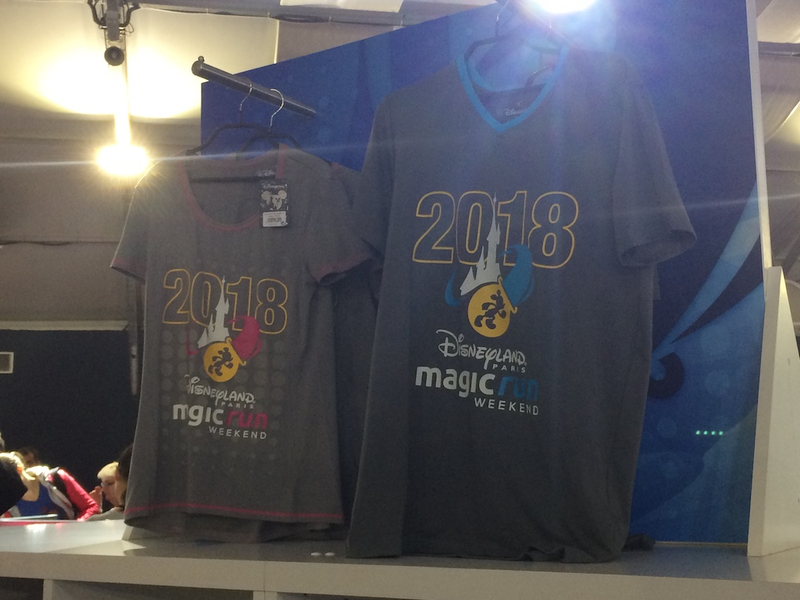 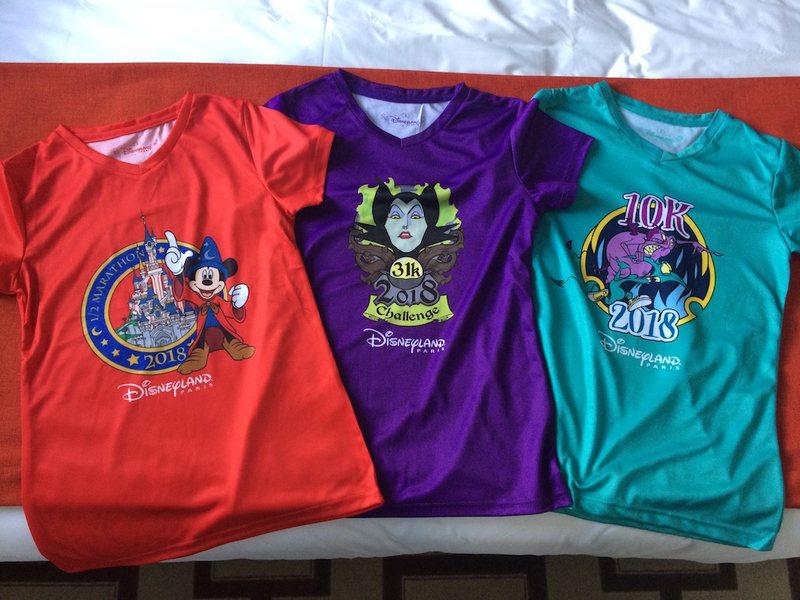 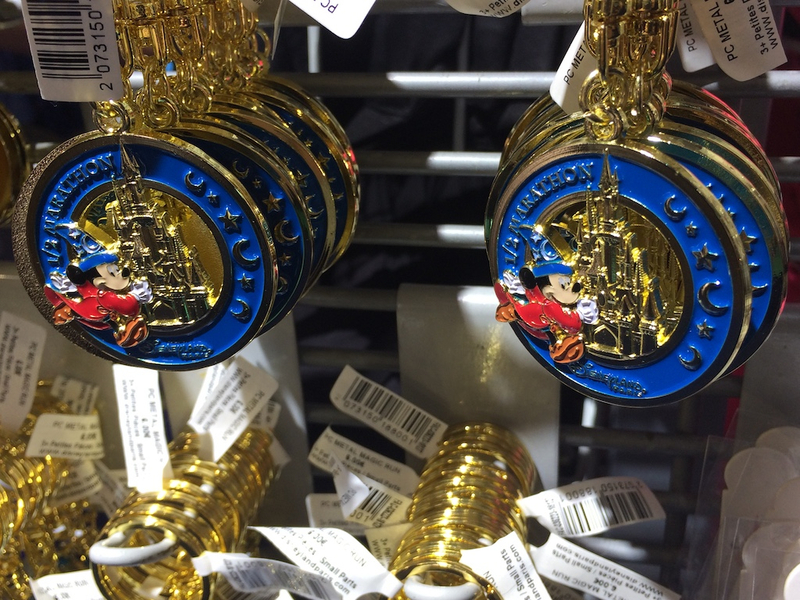 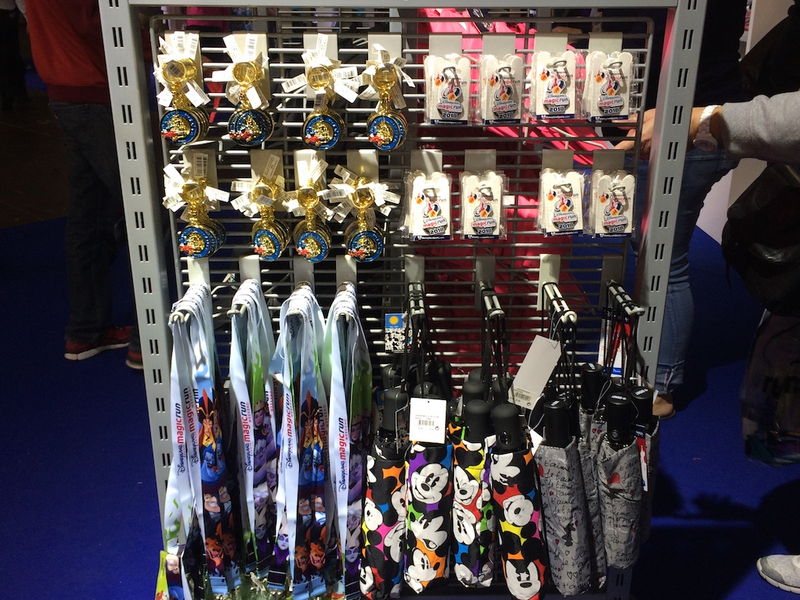 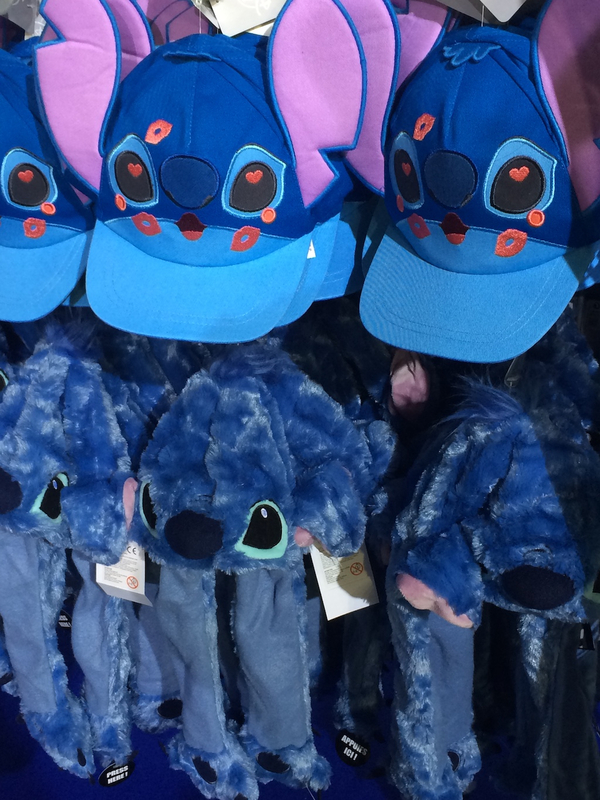 At the start of each race weekend, runDisney hosts an Expo where guests will pick up their race bibs, race shirts, and any pre-ordered merchandise. 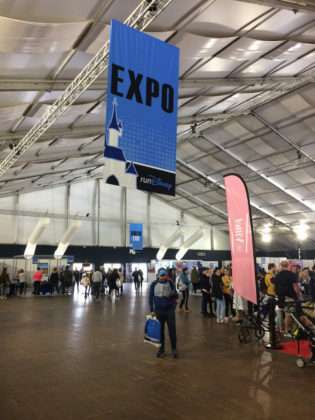 Along with the race essentials, the Expo also features vendor booths, sponsor booths, fun photo opportunities and a pop-up shop selling race merchandise. 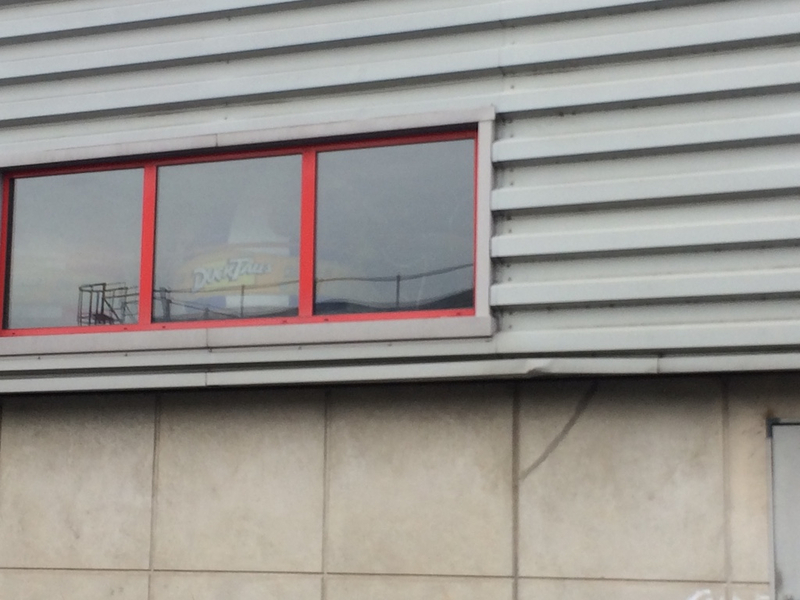 Walt Disney World has the advantage of hosting their Expos at the ESPN Wide World of Sports Complex. There is plenty of space for everything and nothing feels too crowded. 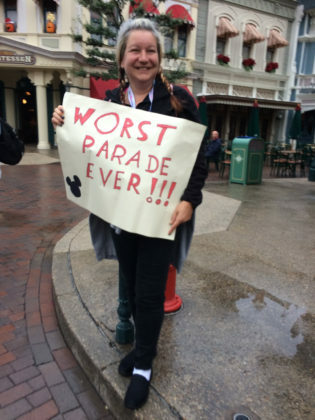 The downside? 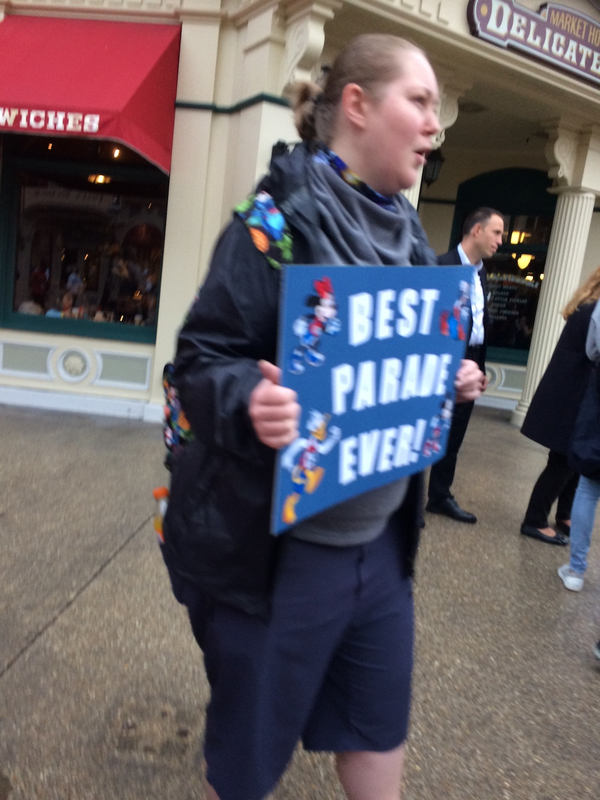 It’s so far removed from all of the hotels and parks making the whole experience take longer. Disneyland’s Expo had the most unique setup as it was held at the Disneyland hotel. 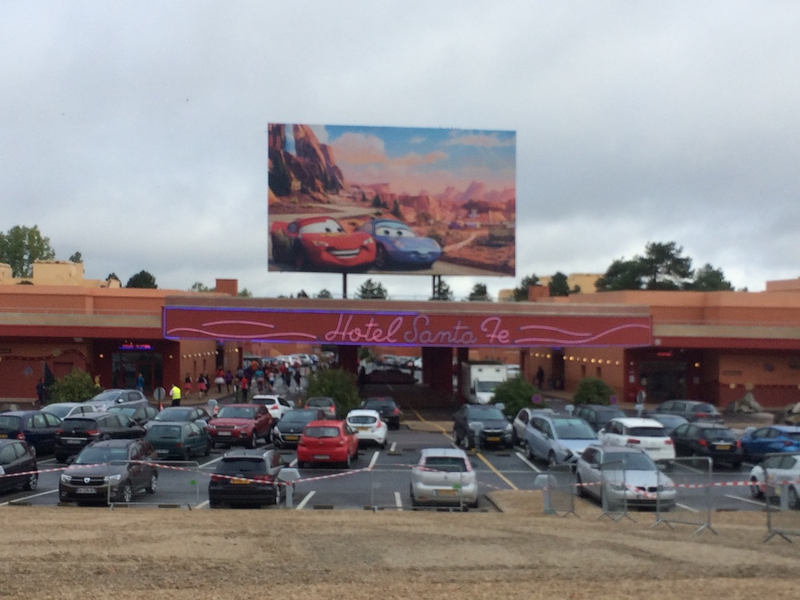 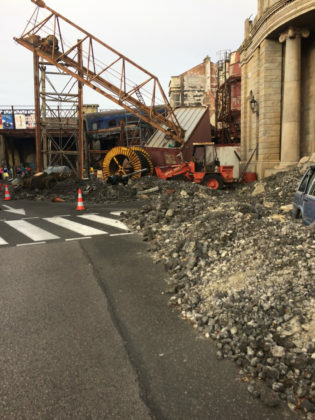 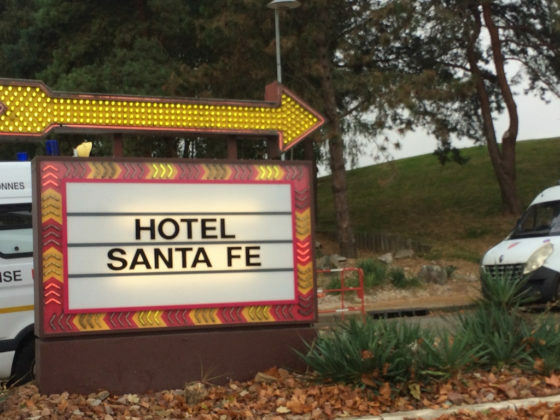 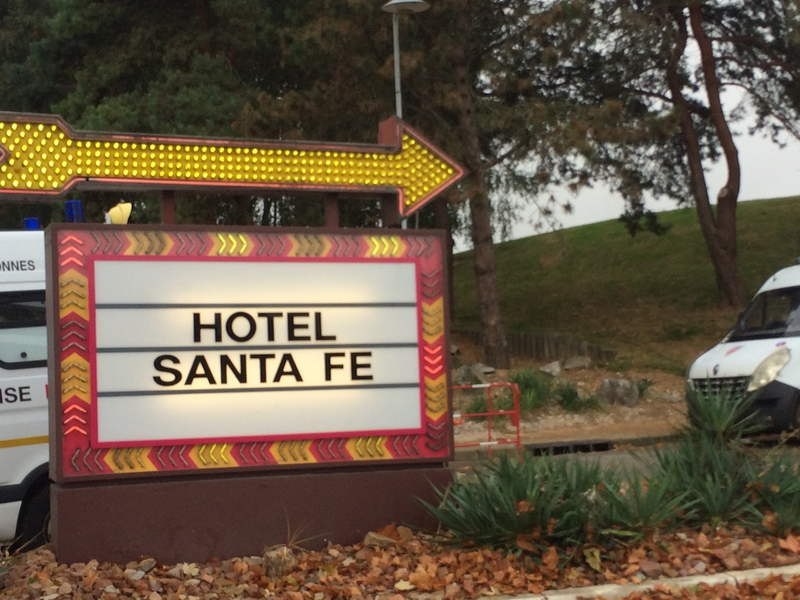 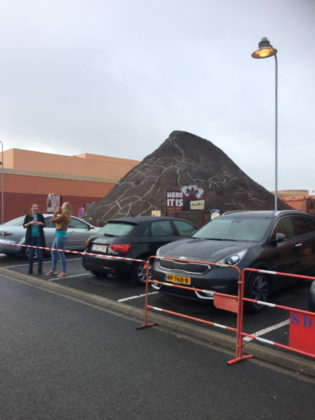 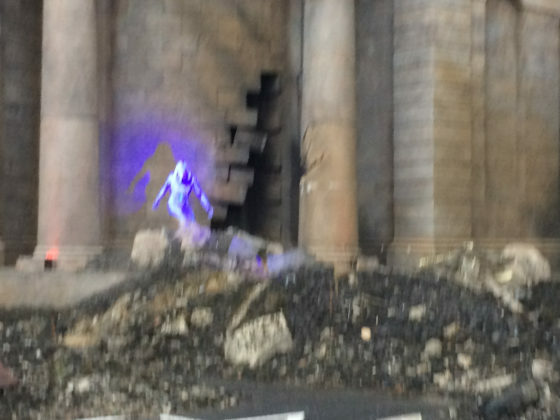 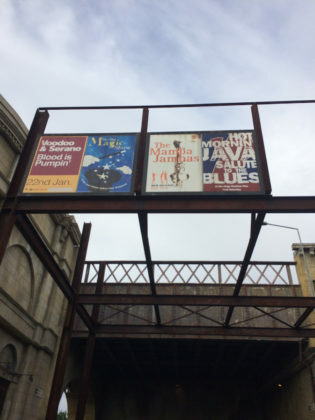 Guests would walk down into the parking structure under the hotel to pick up their bibs and then would be directed back up one of the hotel’s ballrooms. The ballroom is where guests would get their shirts and could shop or visit vendors. 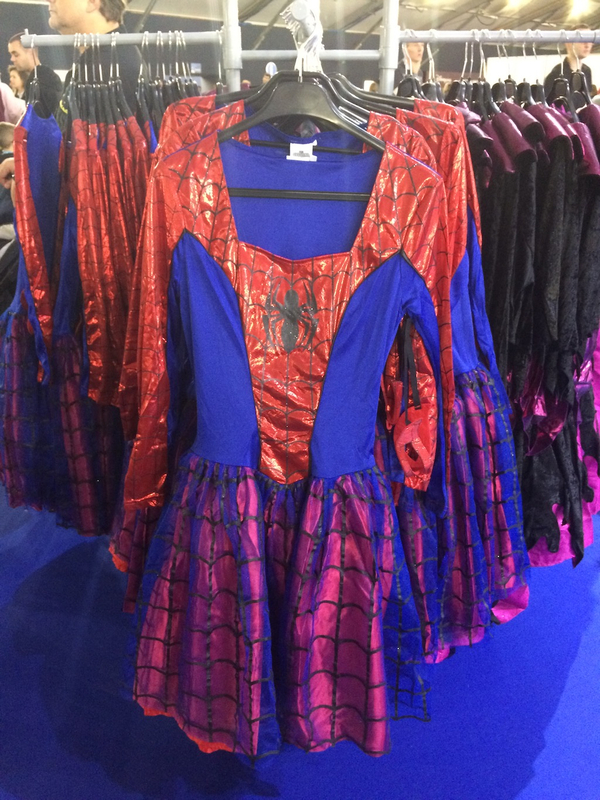 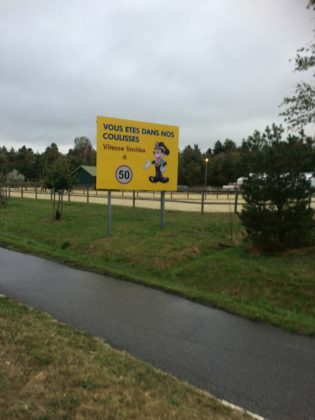 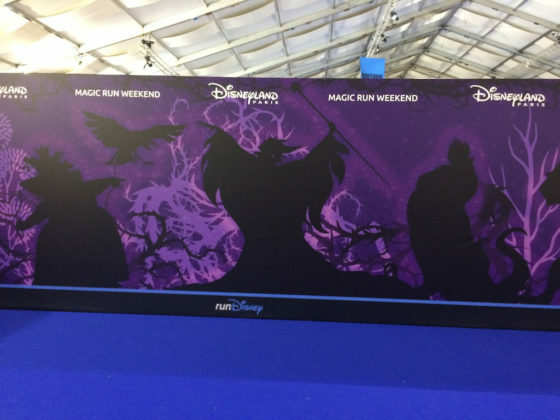 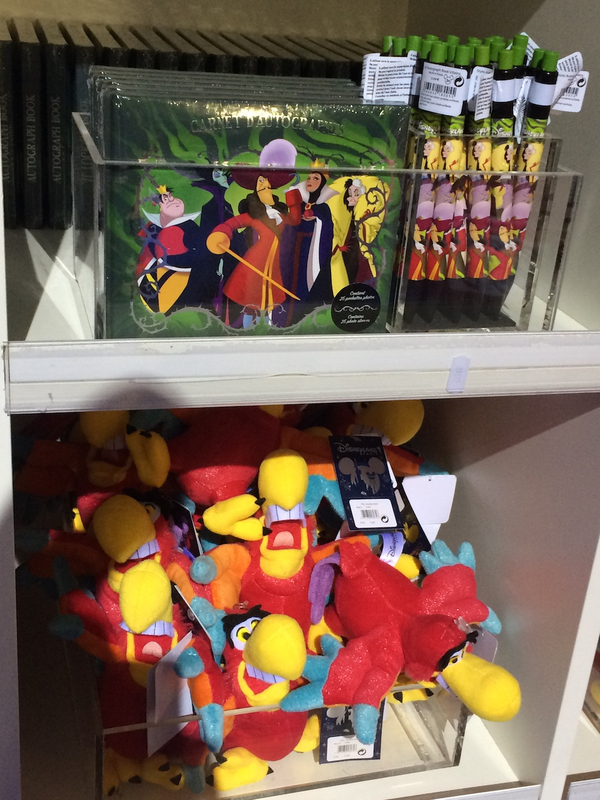 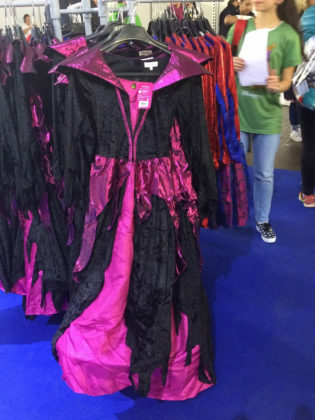 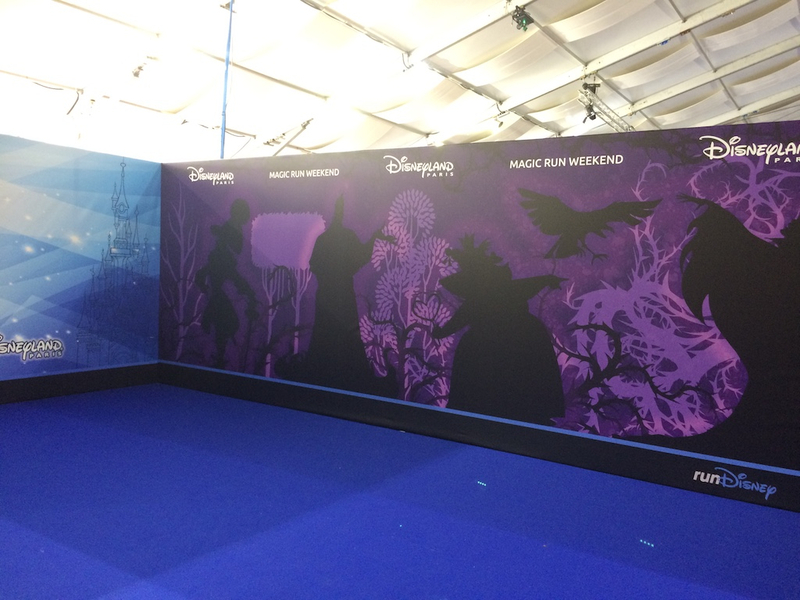 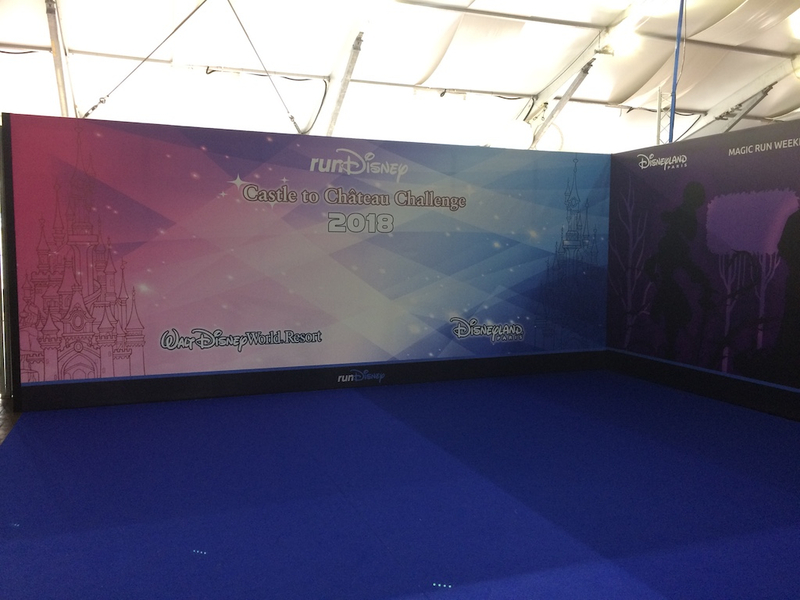 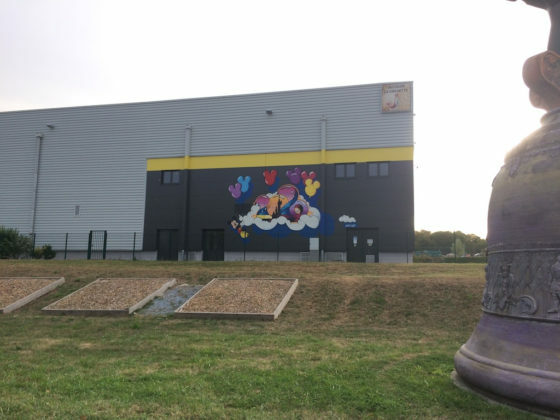 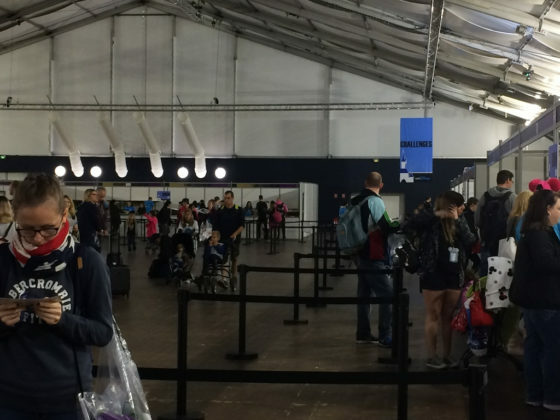 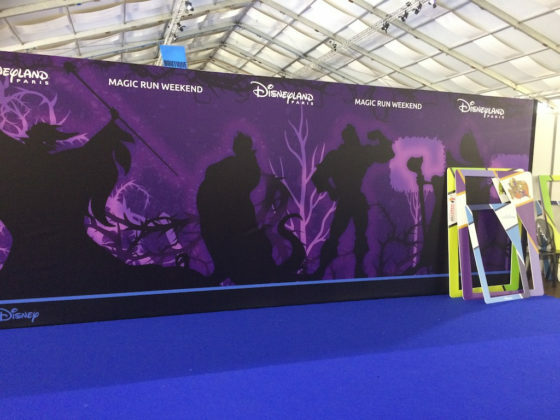 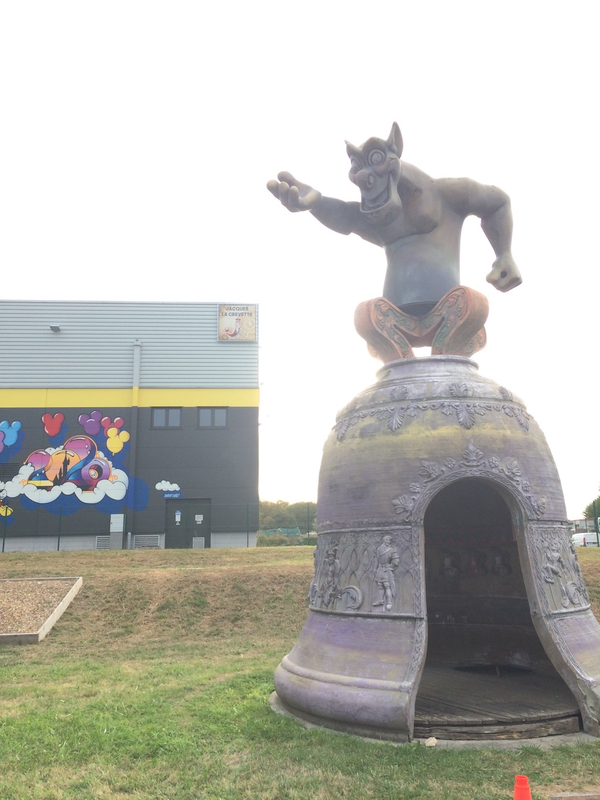 Disneyland Paris holds their Expo at their Events Arena. It’s a decent structure that looks like a giant tent with more than enough space for guests and vendors. 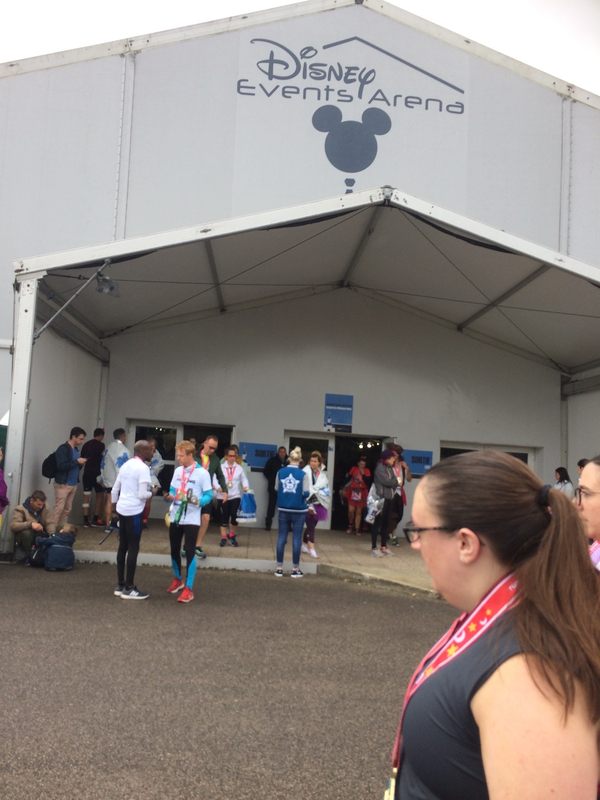 As with every runDisney event, I felt that this was well organized, however it had the fewest vendors, sponsors, and merchandise. This is the first race weekend that I attended where I didn’t have my waivers with me. 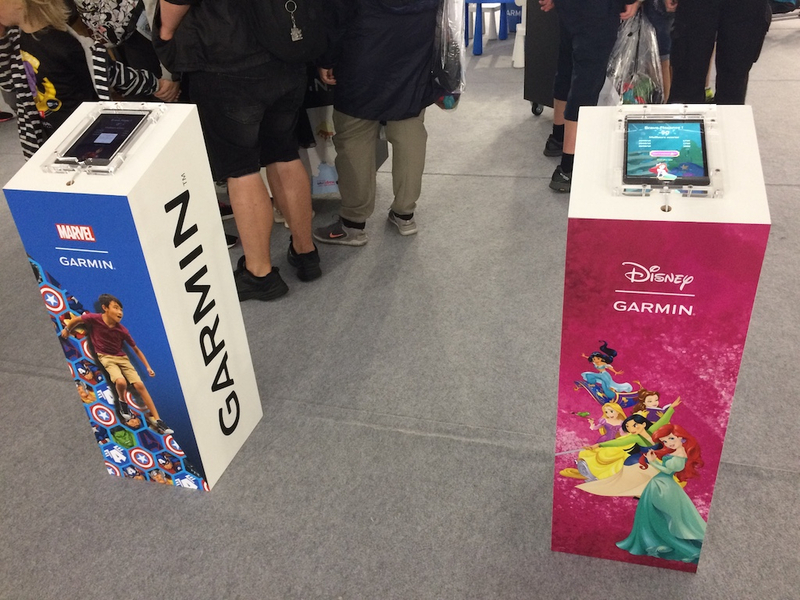 Taking into consideration travel plans and arrival times, Disney provides computers and printers at each Expo so runners can print their waivers if needed. I had to stand in line for a few minutes waiting for a computer. 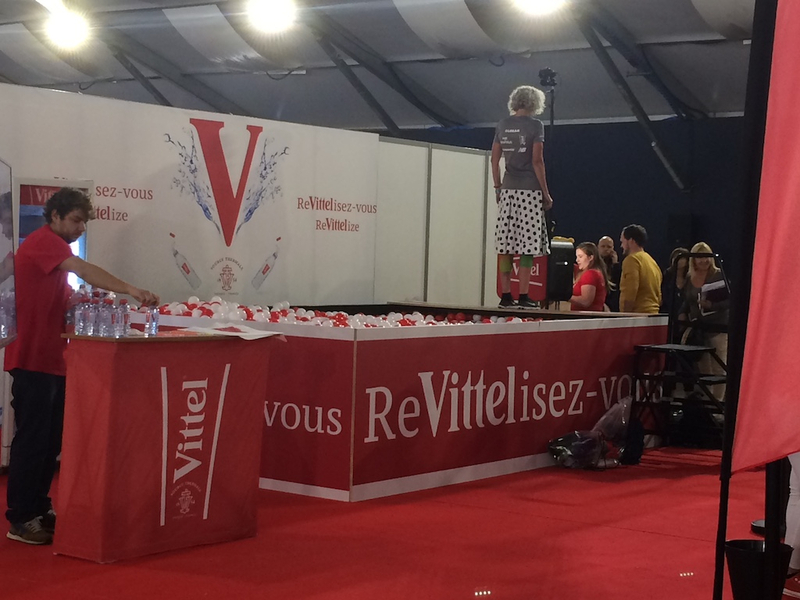 Once it was my turn, I struggled a bit as the laptops had a different keyboard setup than I’m used to (AZERTY vs QWERTY). They were older models (no two-finger scrolling on the trackpad!) 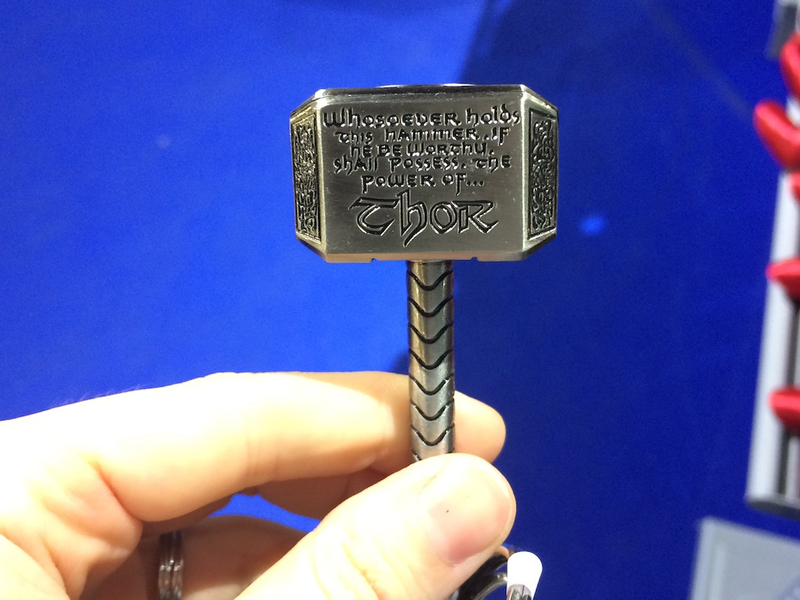 and trying to find the proper key to type the @ symbol was a little crazy. Otherwise, smooth sailing. Once I had my waiver, I proceeded into the Expo and got in line to pick up my bib and shirts. There were two volunteers at the booth and I waited all of 90 seconds before I was helped. 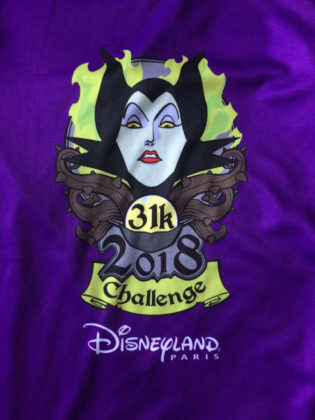 Since I was doing the 31k challenge, I had to have my picture taken with my bib. This line was about two minutes long and then I was off to explore the Expo. 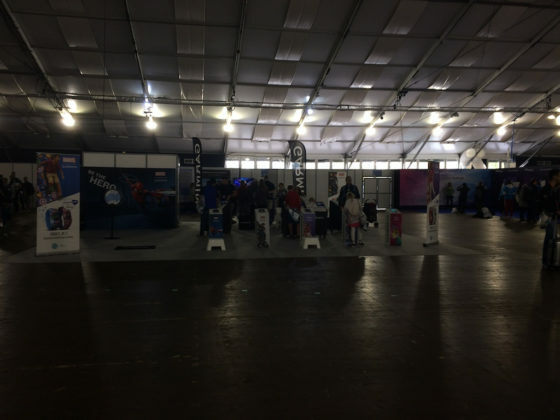 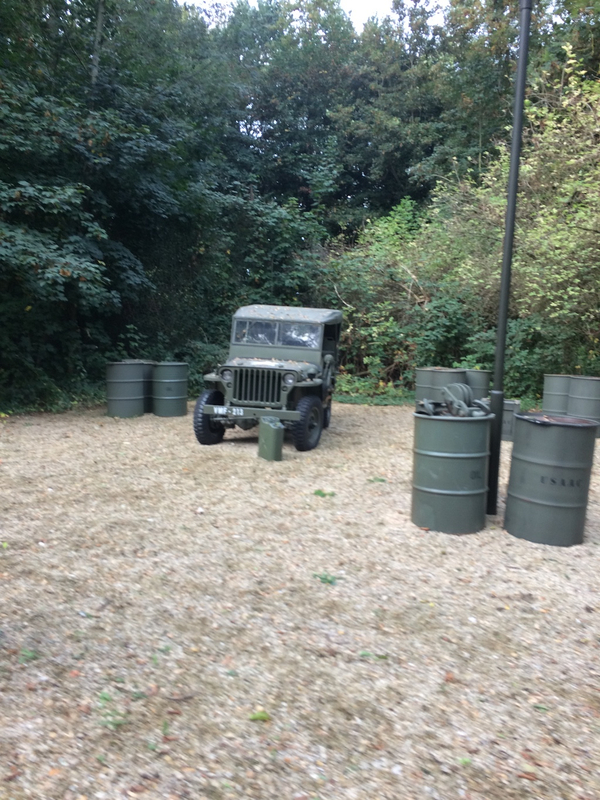 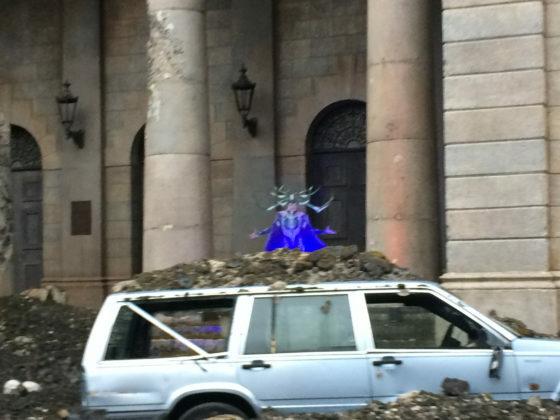 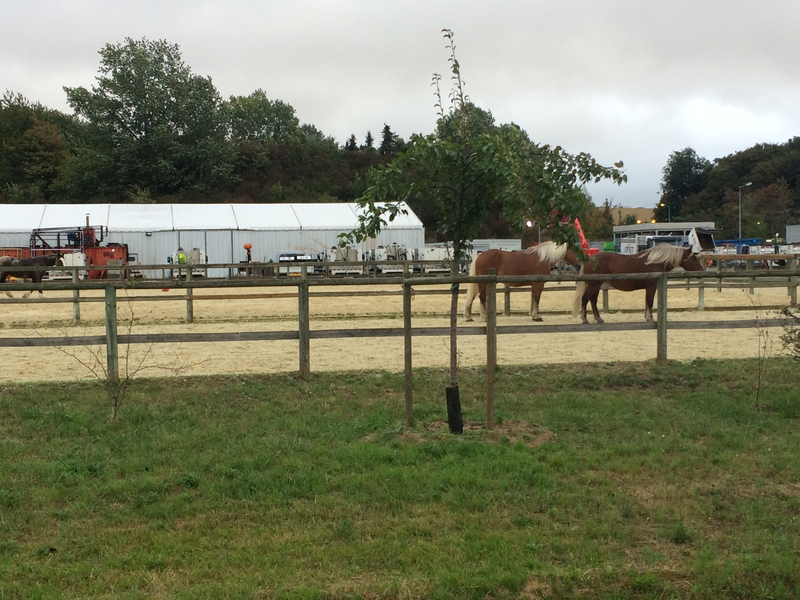 As you can see from the pictures, there was plenty of unused space in the Events Arena. 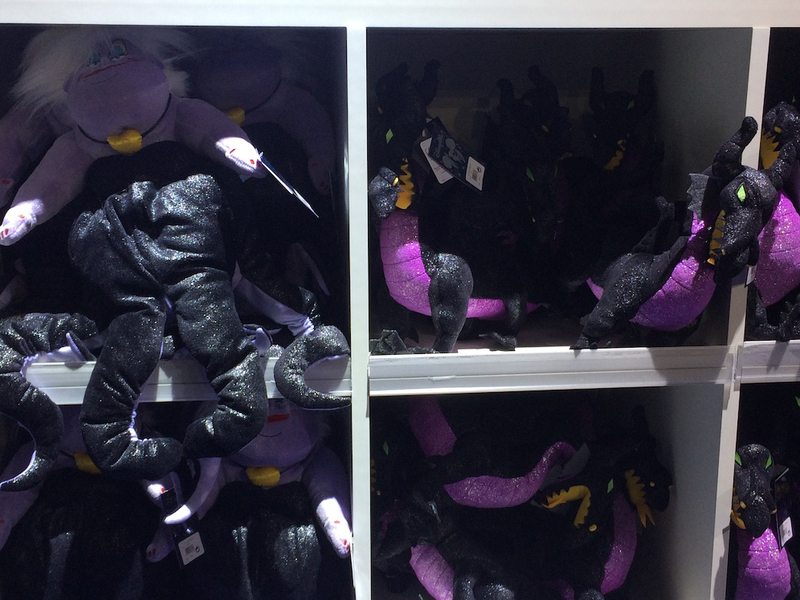 I’m not complaining, just noting that there was more room than I expected. 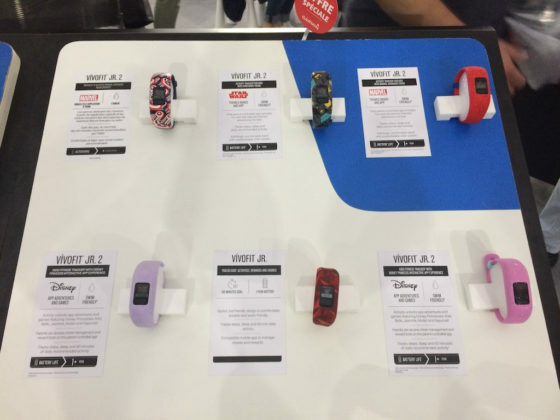 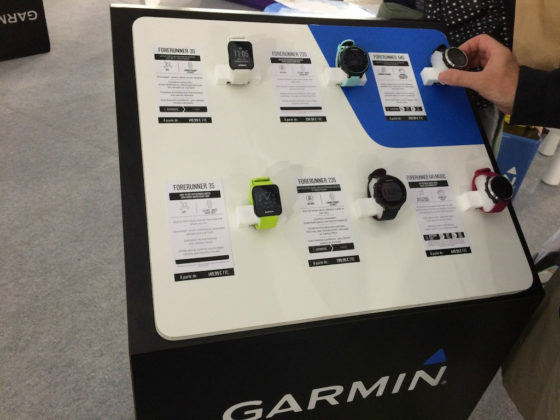 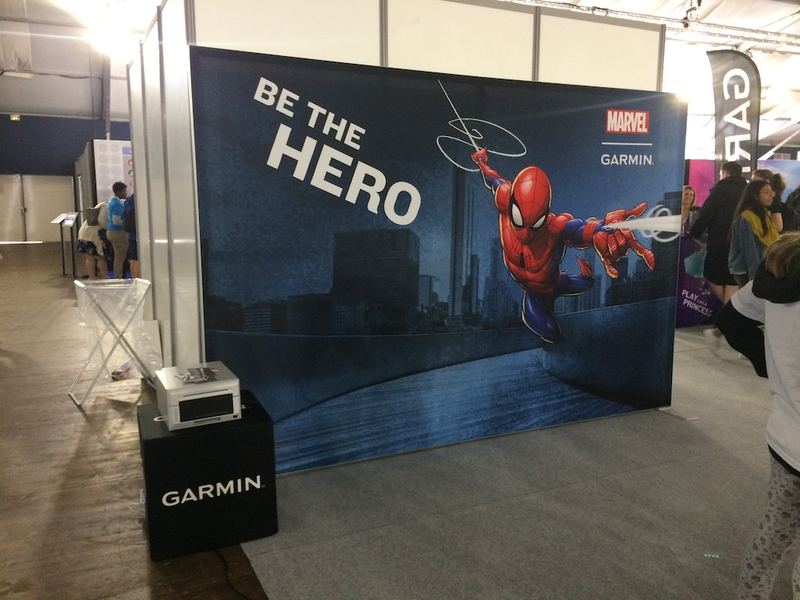 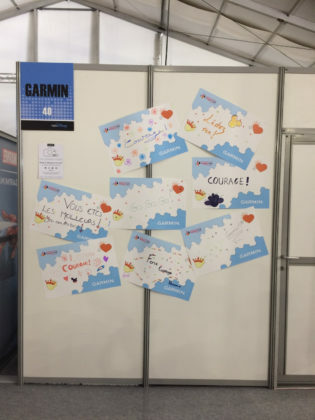 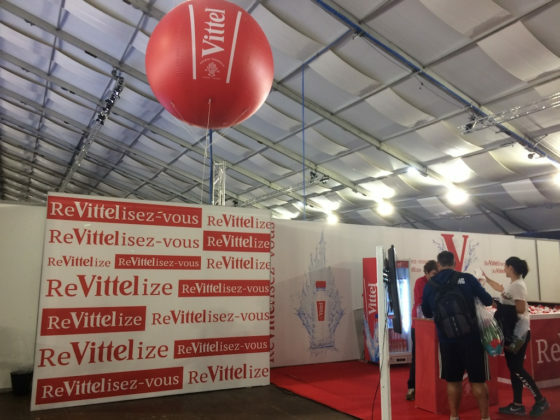 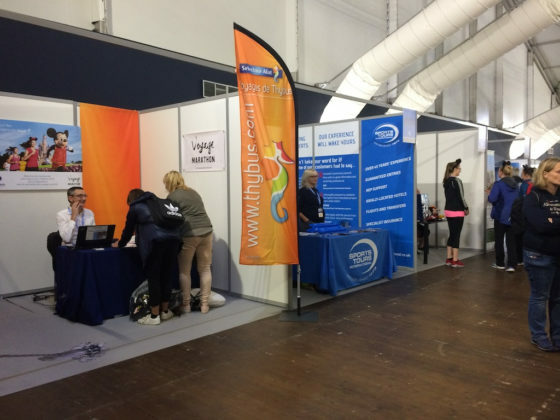 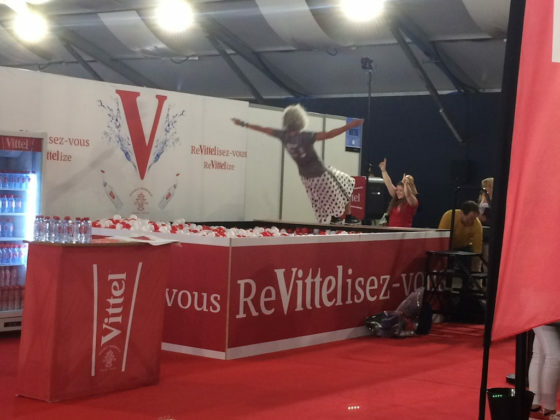 The only official sponsors to have booths at the Expo were Garmin and Vittel. 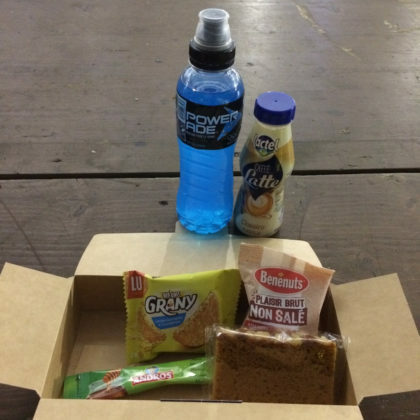 The other sponsors provided food and beverages during and post race. 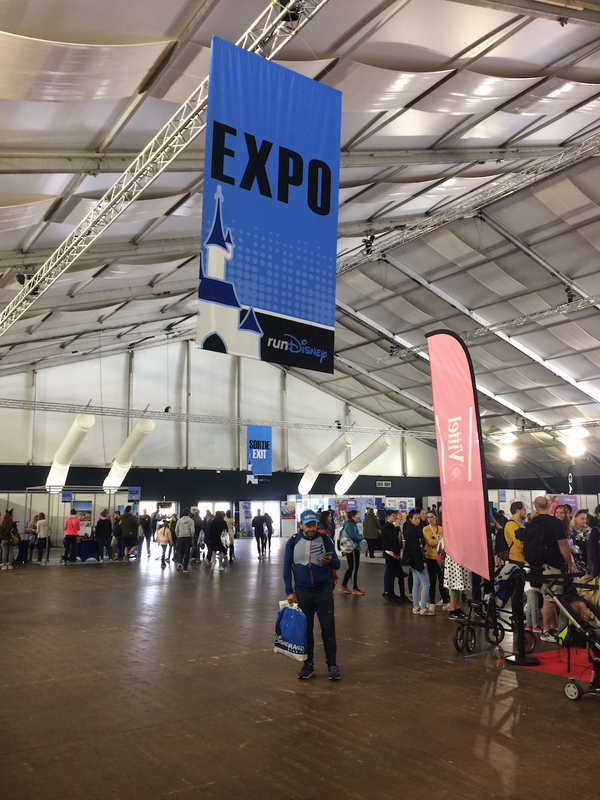 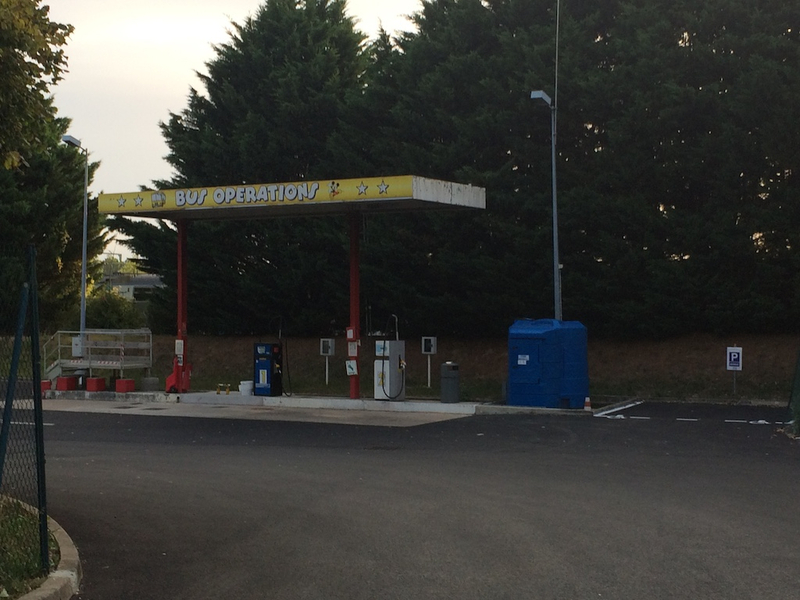 Compared to the shops at the domestic Expos, this one felt very small, however they did have a decent selection of items available. 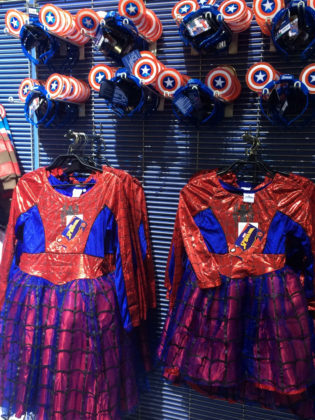 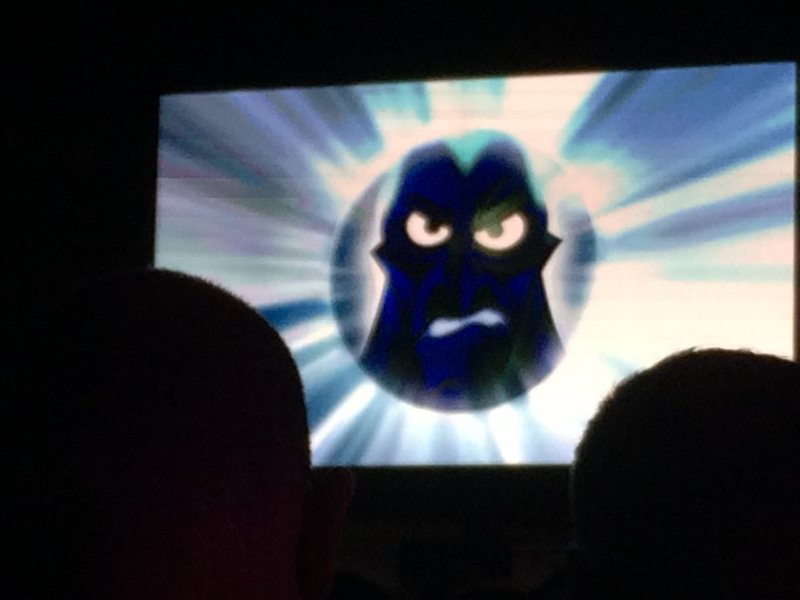 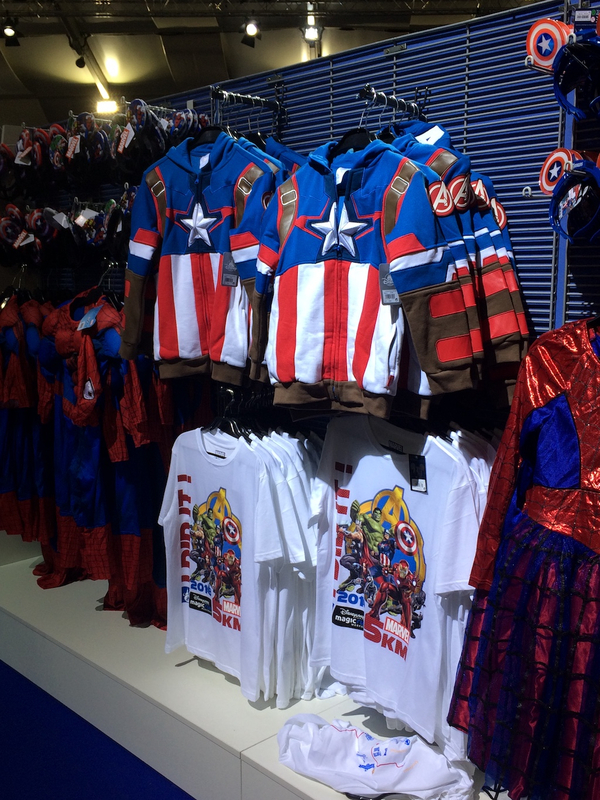 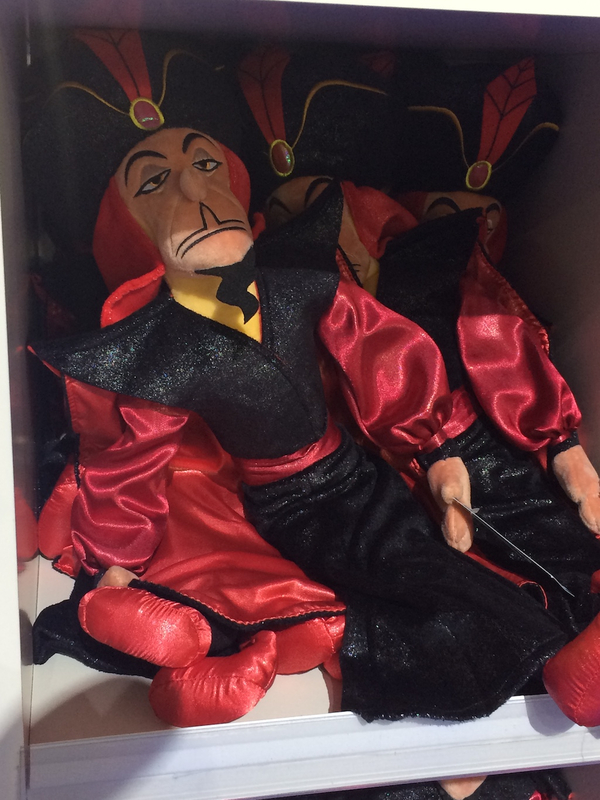 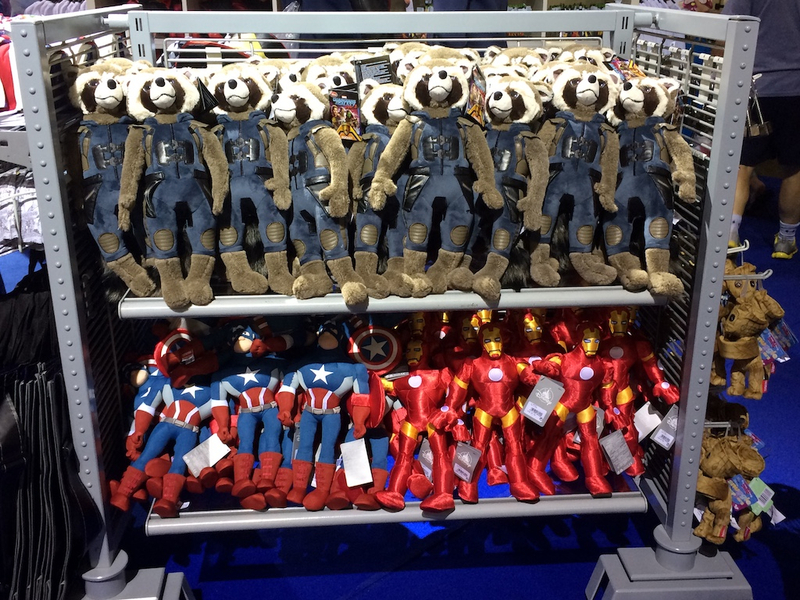 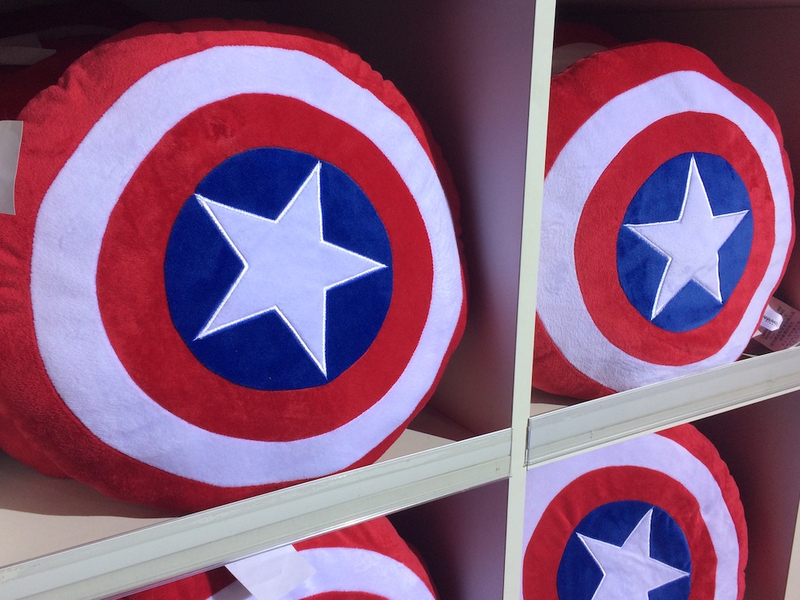 The themes for this year were based on villains and heroes and there were plenty of plushes, shirts, and costumes to reflect that. 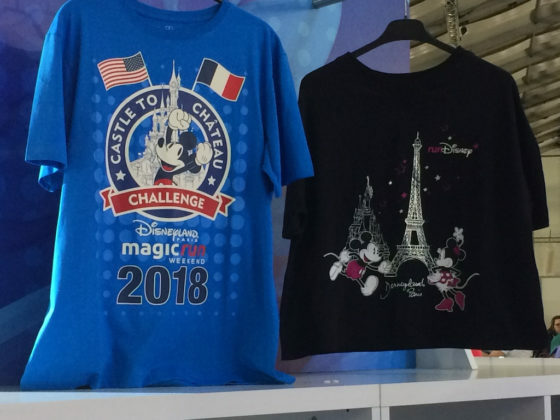 Personally, I prefer the long sleeved tech shirts that I received at the Disneyland races, but considering the weather and time of year, the short sleeve shirts are perfect. 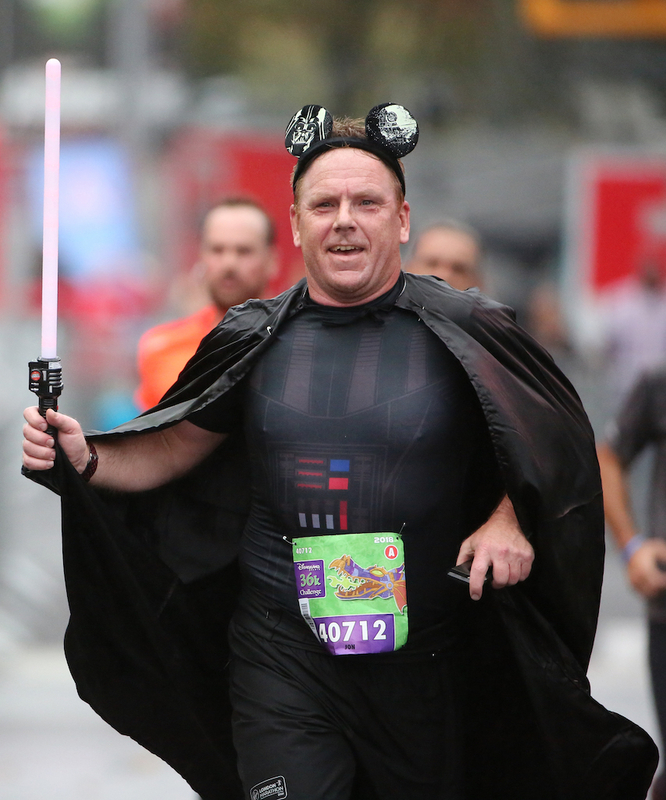 They aren’t mesh, but they’re lighter and more breathable. 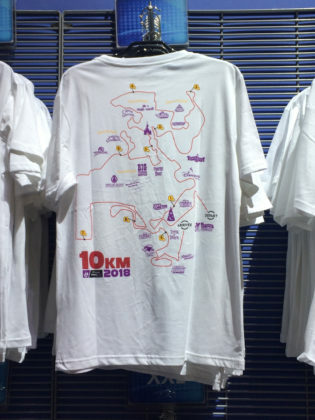 I really like the simple designs and the bright colors. 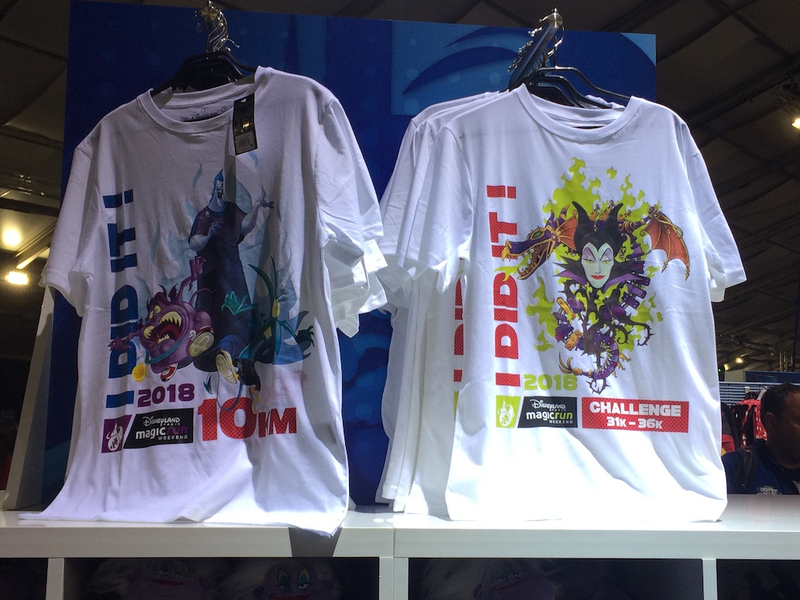 These will be a great addition to my collection of training shirts. 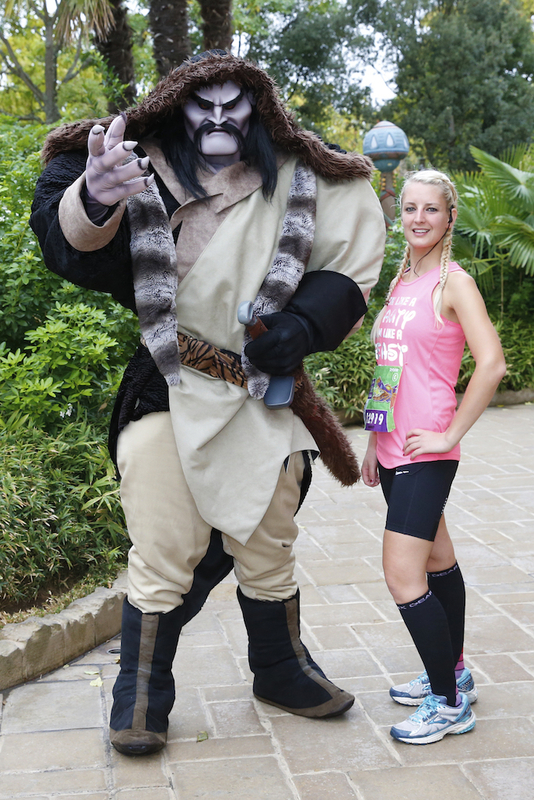 It was a little bit chilly as the day got started with temperatures in the high 50s. Plus with the sun not yet up, every bit of wind felt cold. 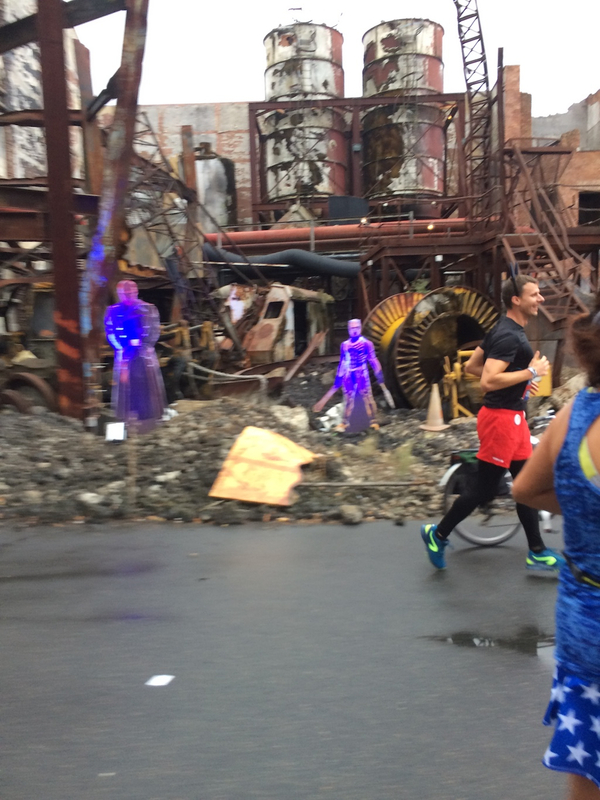 I was placed in the last corral for this race which meant it’d be a while before I’d get to hit the course. Fortunately, I decided not to check my light jacket and instead brought a small drawstring backpack with me. 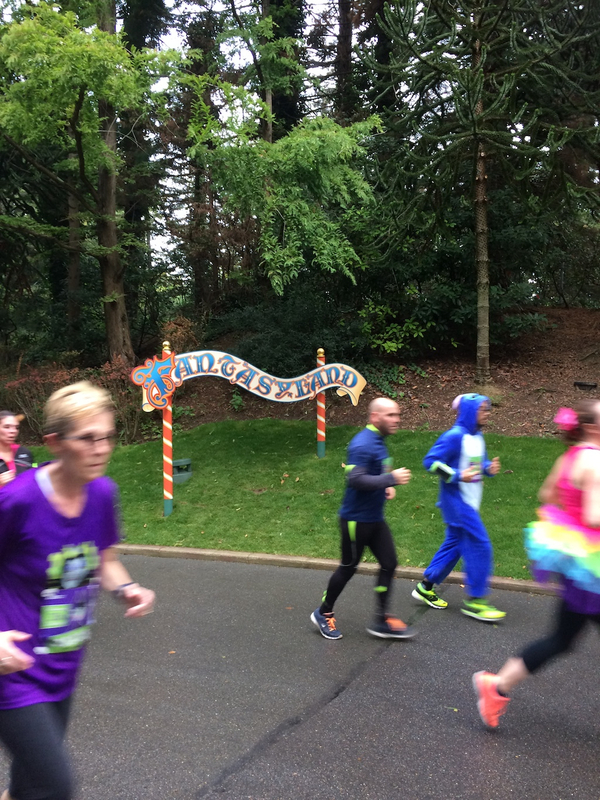 This particular 10k wasn’t going to be timed, so I could relax a little with my pacing. 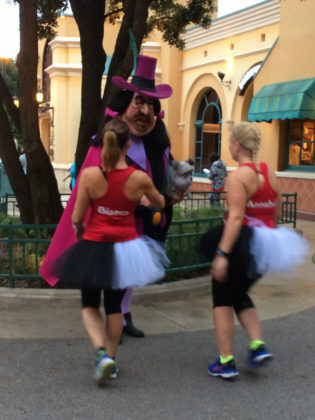 To get the morning started, a runDisney Cast Member took to the stage to get us warmed up and then introduced the Disney characters of the day. 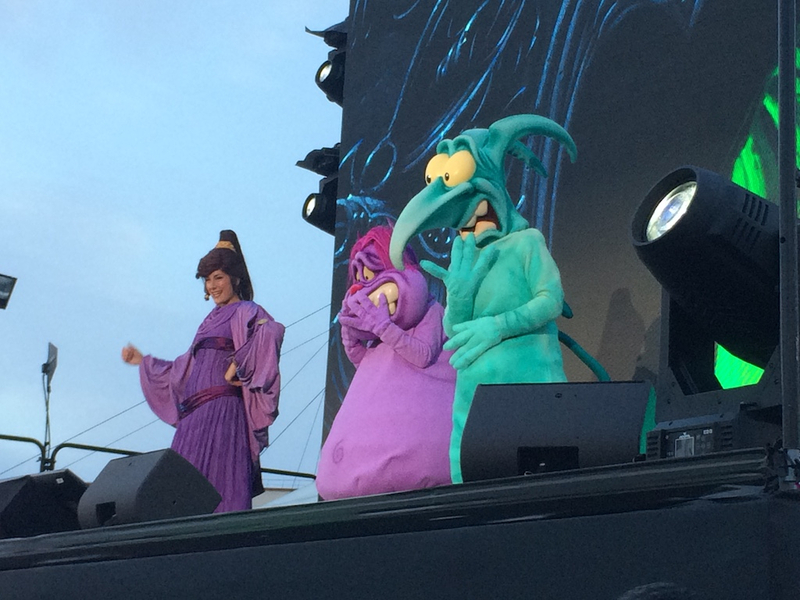 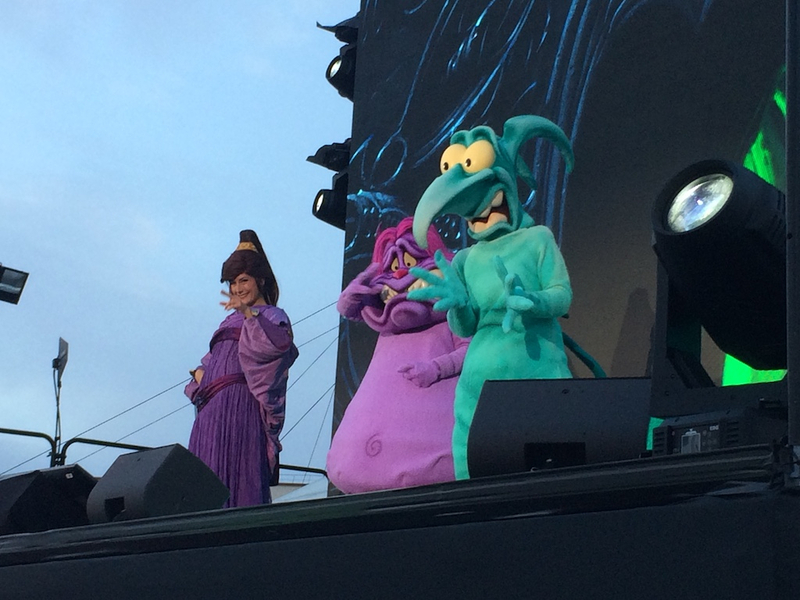 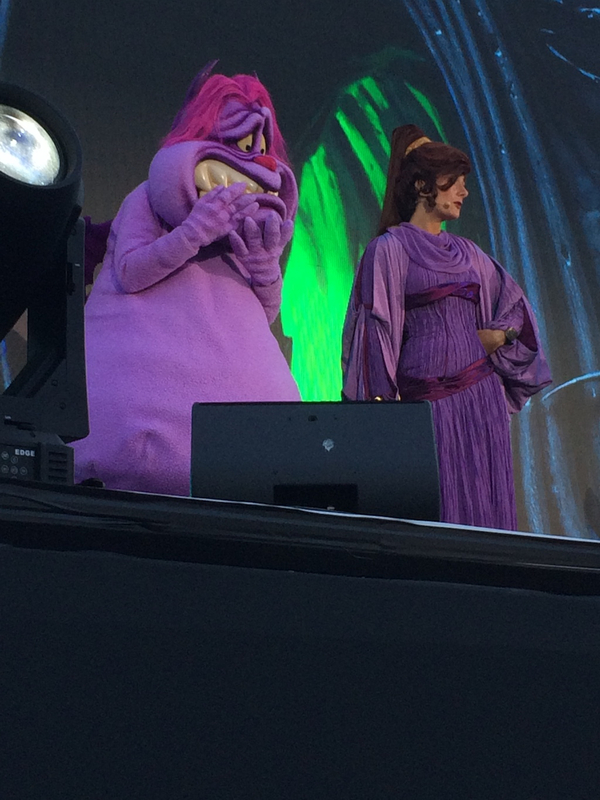 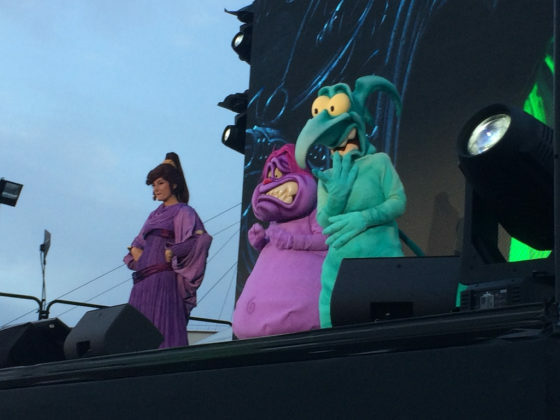 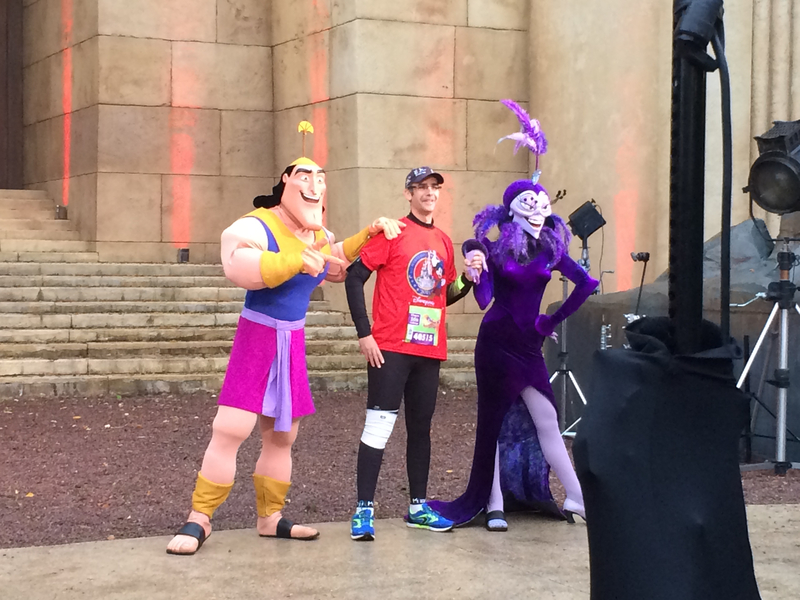 Megara, Pain, and Panic from Hercules stepped on stage as the first group headed to the start line. Unlike the Florida and California races where each corral is released at one time, France’s race brought runners out in waves. Every two minutes or so, the next group of people would hit the course. 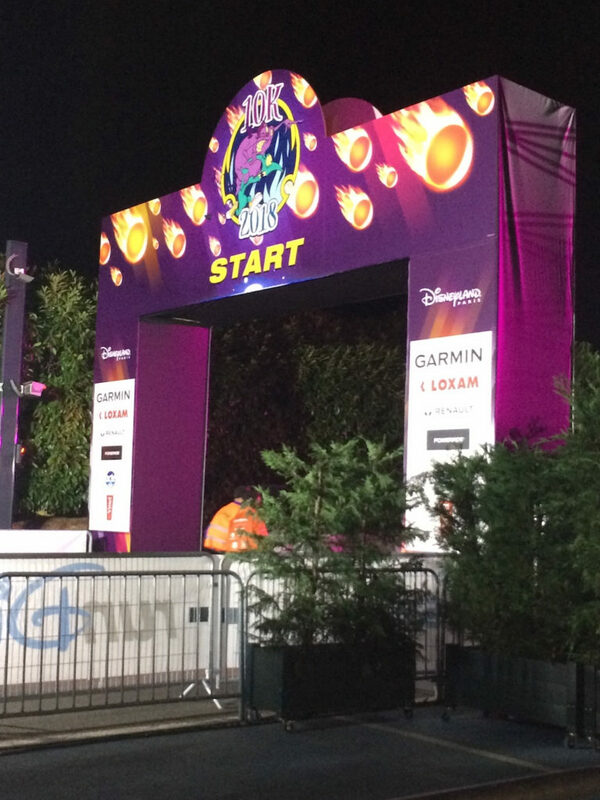 In the domestic races, there are about five to seven minutes between each corral start time. 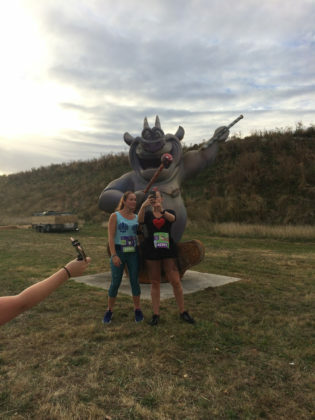 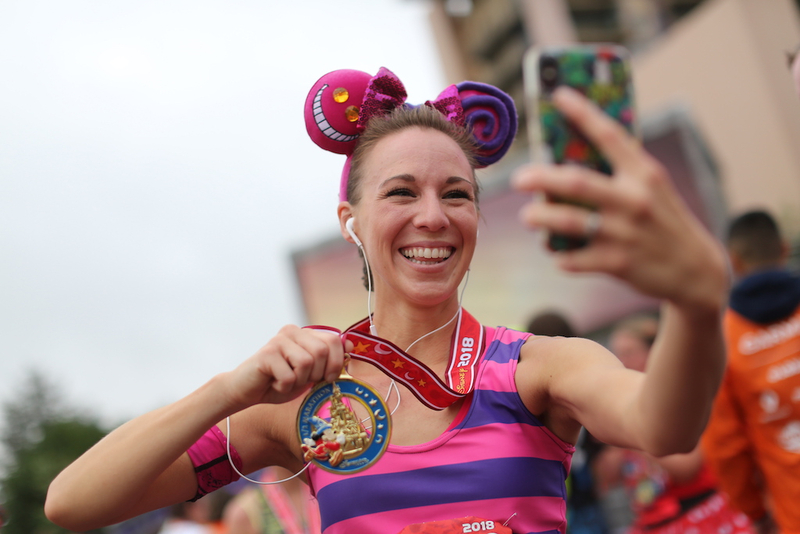 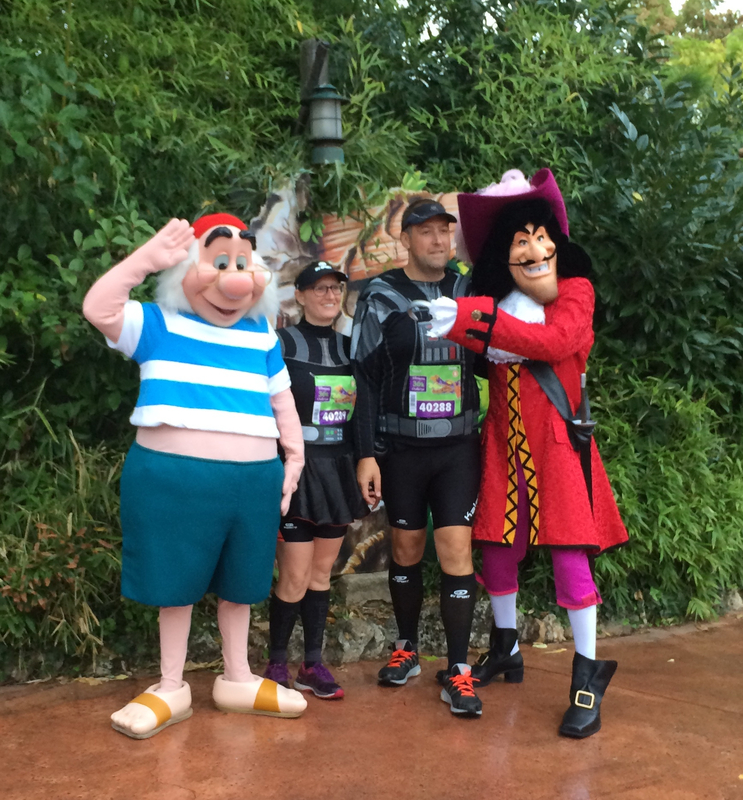 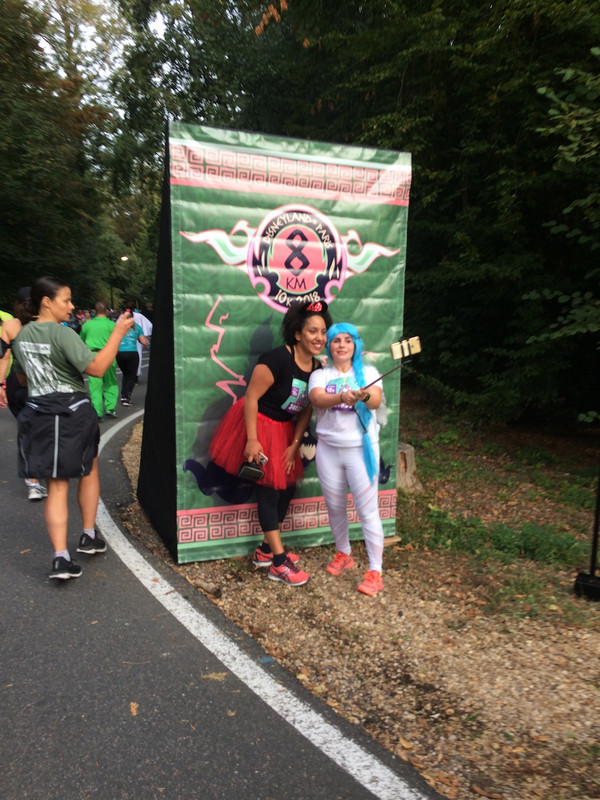 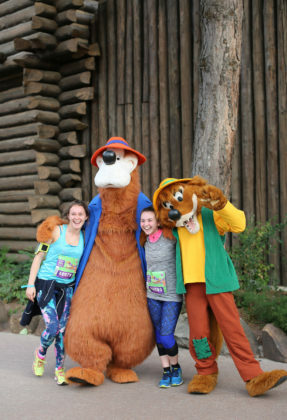 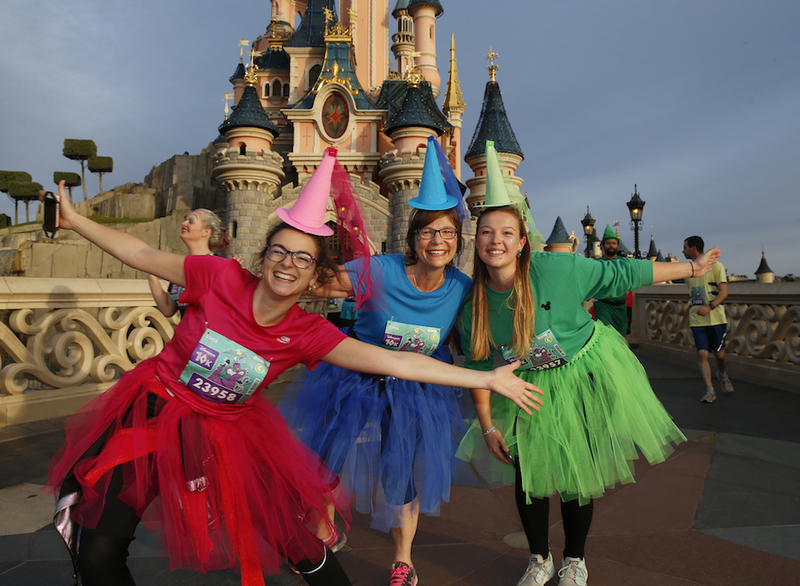 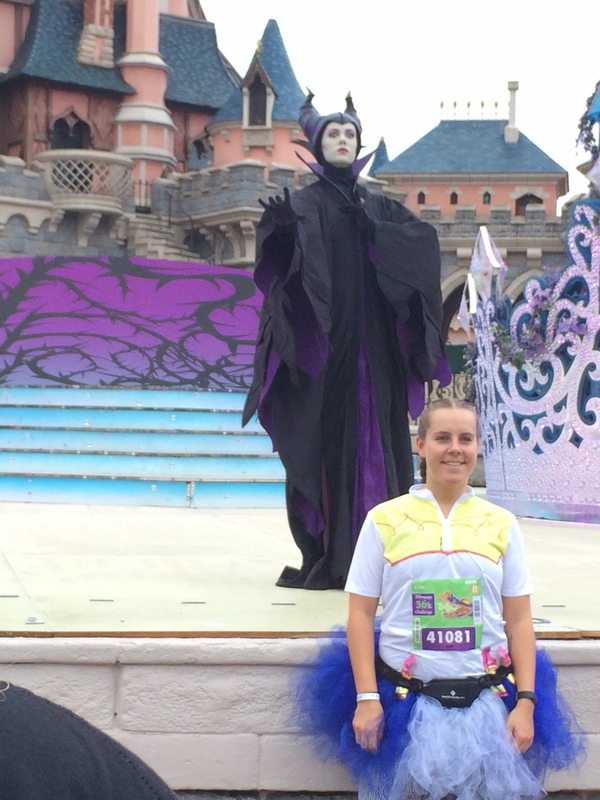 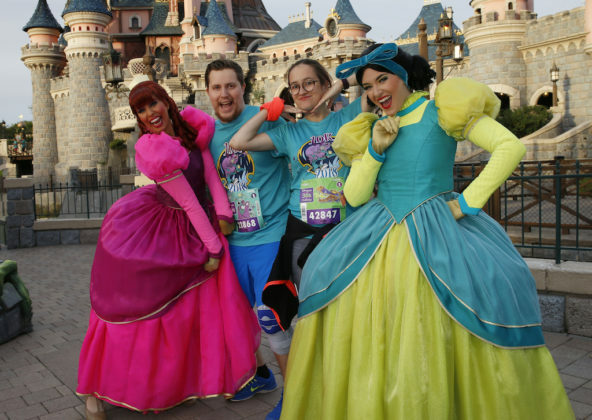 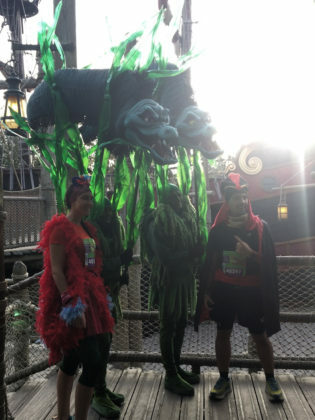 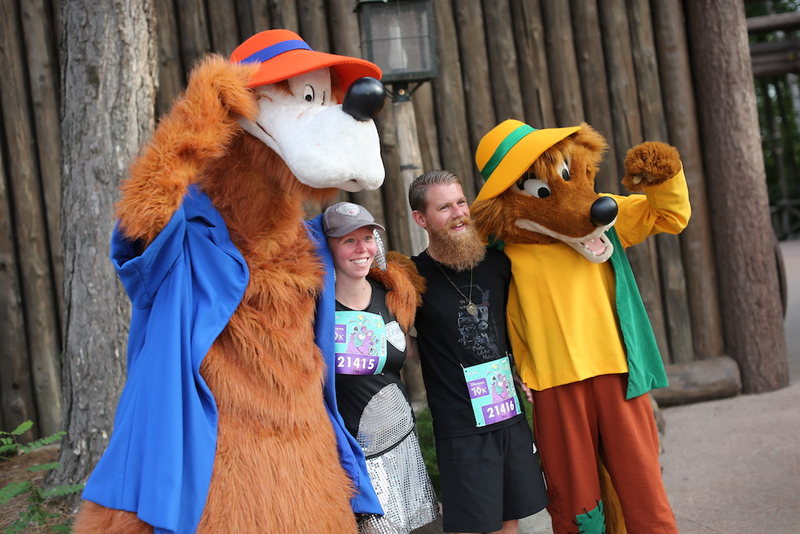 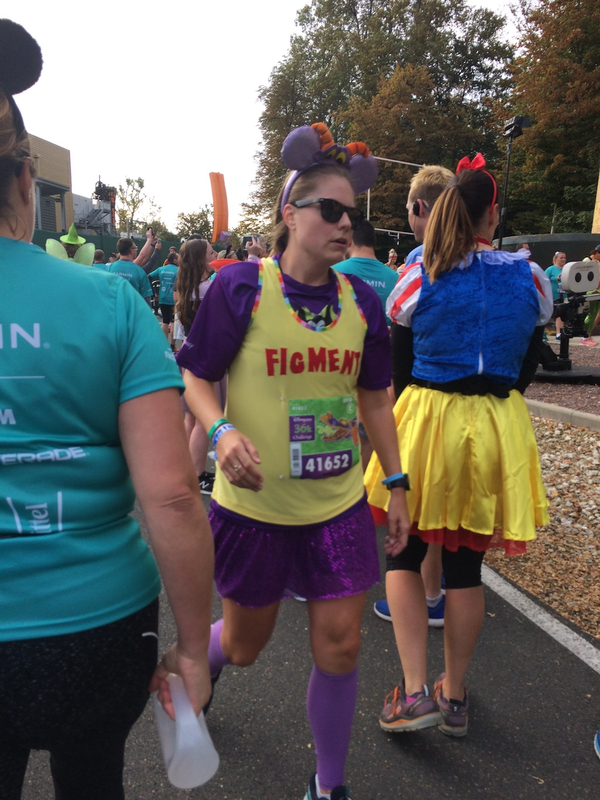 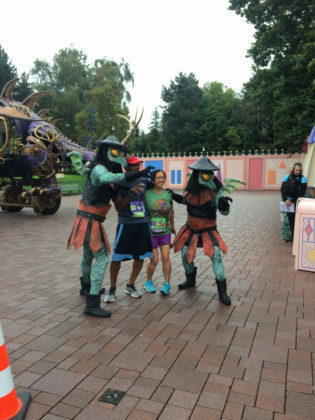 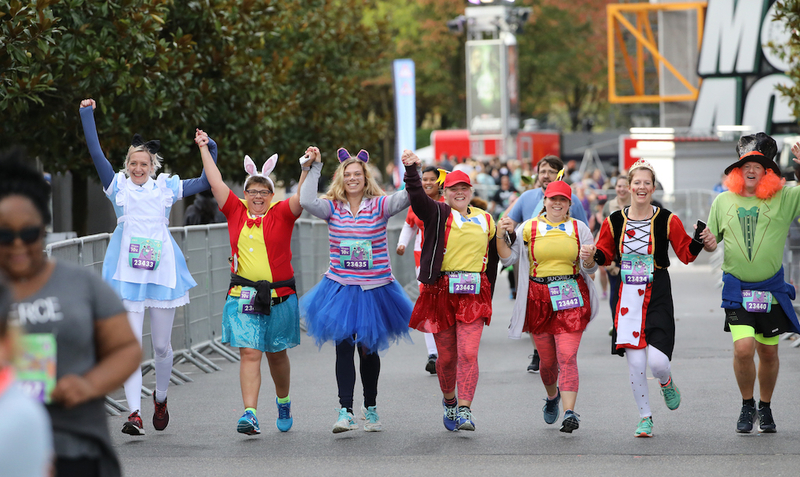 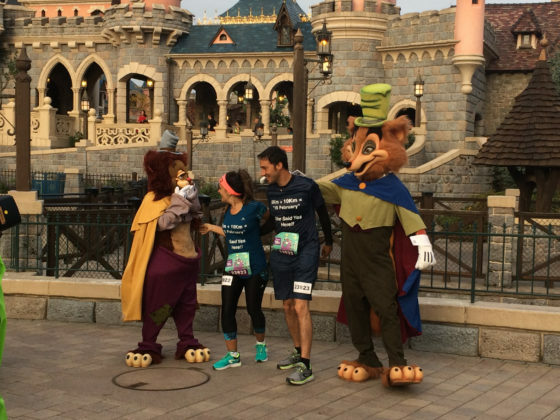 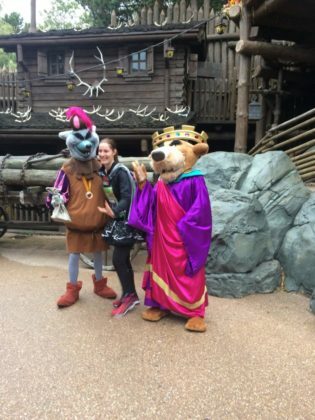 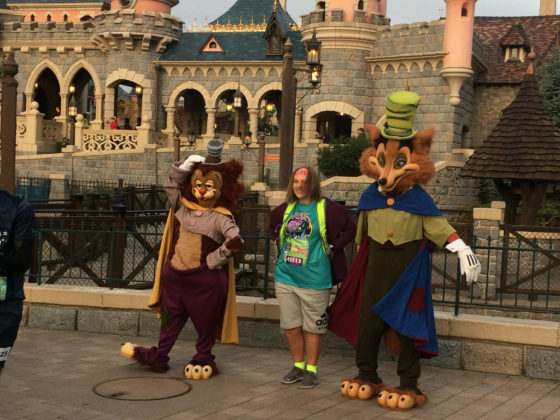 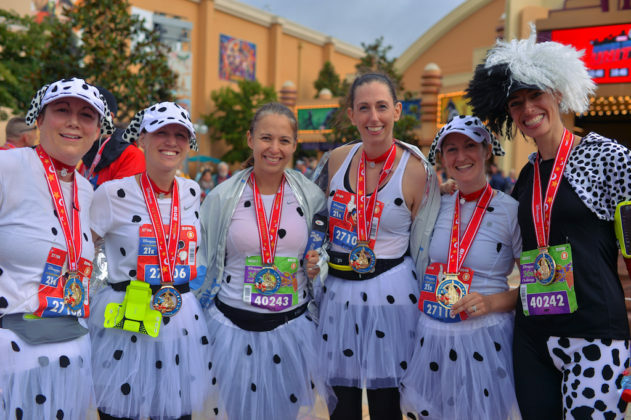 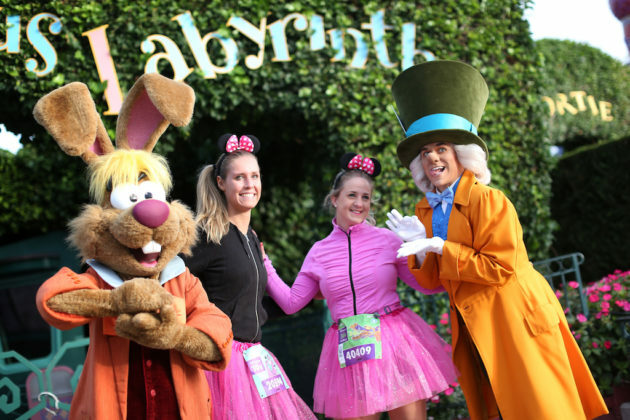 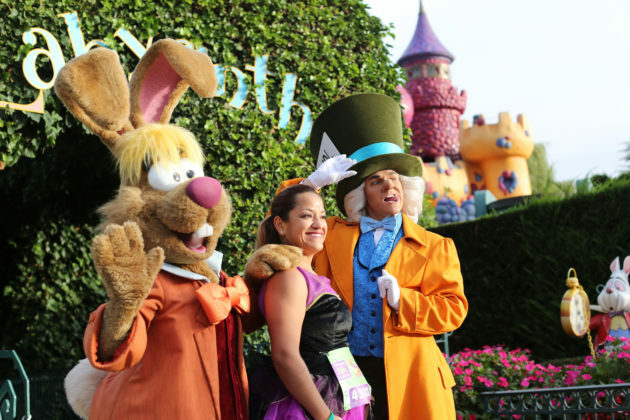 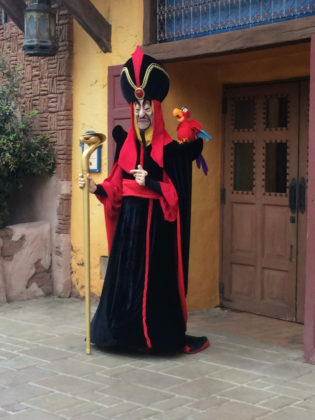 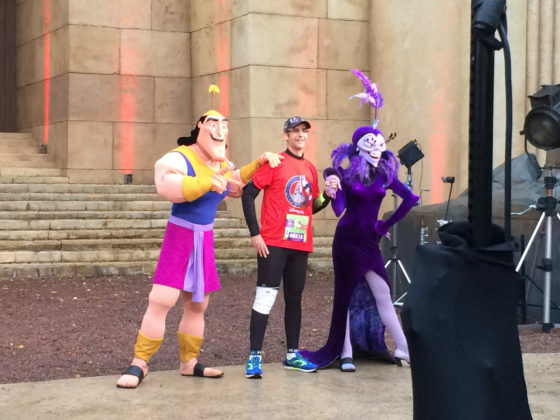 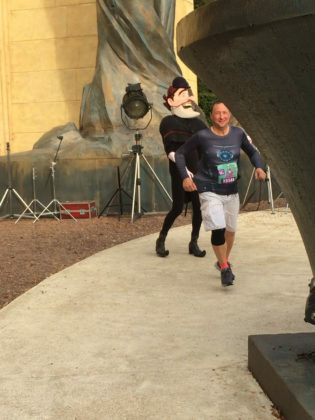 Throughout the course, there were several opportunities for runners to take pictures with Disney characters. As I’m always concerned with my race time, I didn’t stop for any pictures with the characters, but I did get to take a few. 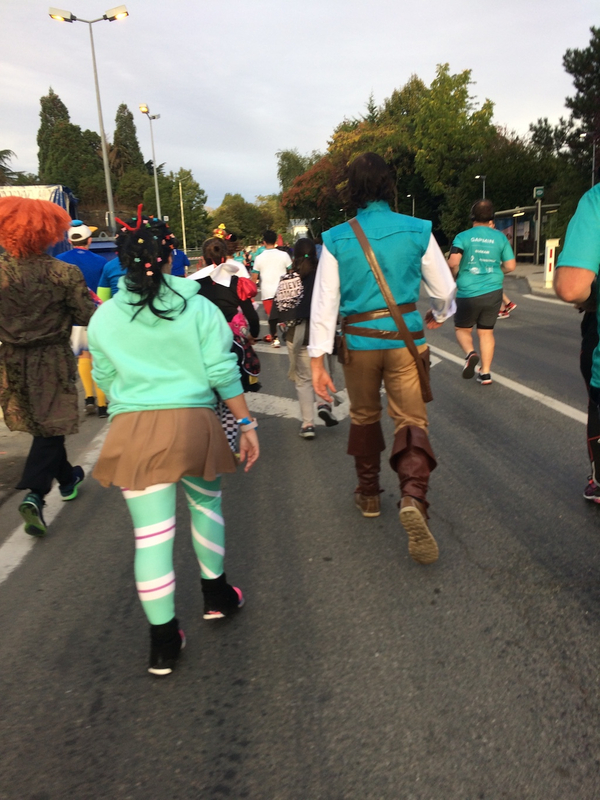 This race was all about the sidekicks, and I was impressed with their selection. 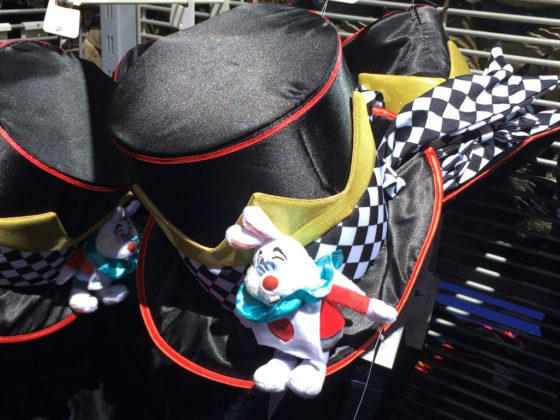 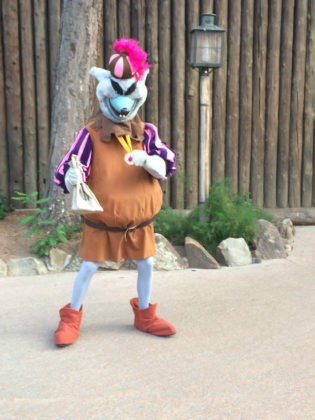 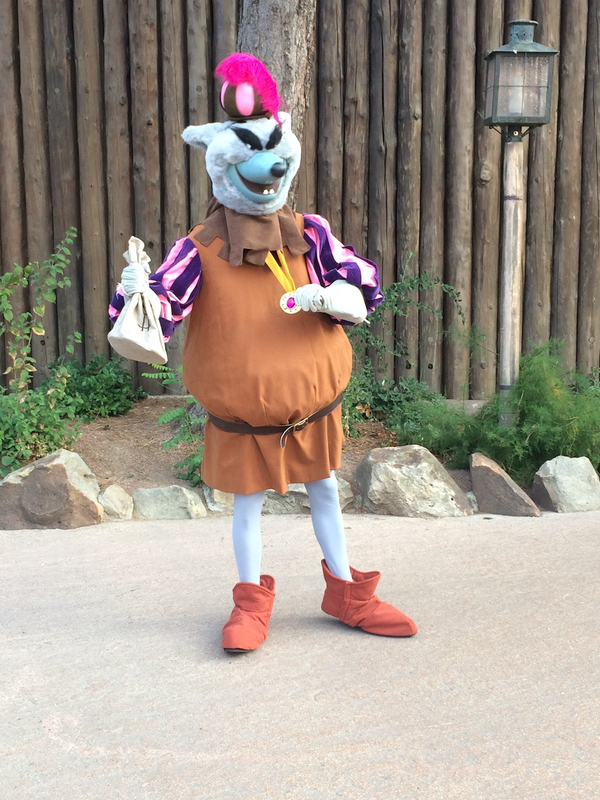 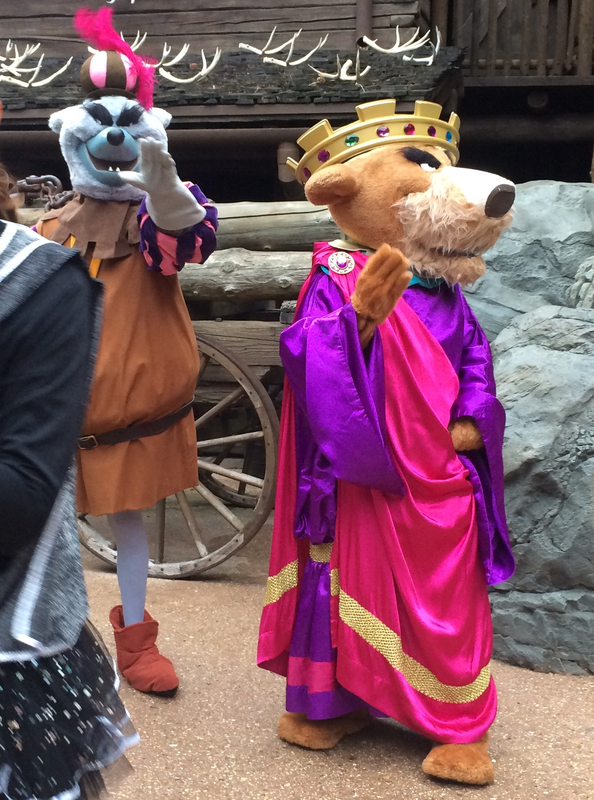 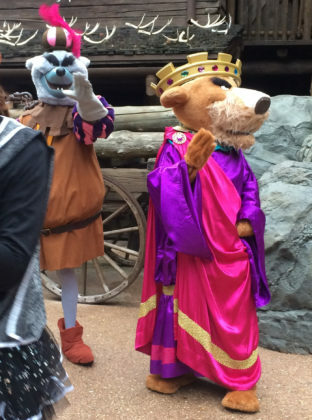 Some of the characters swapped out, and so I didn’t see Hades, Br’er Fox, Br’er Bear, March Hare, or Mad Hatter. 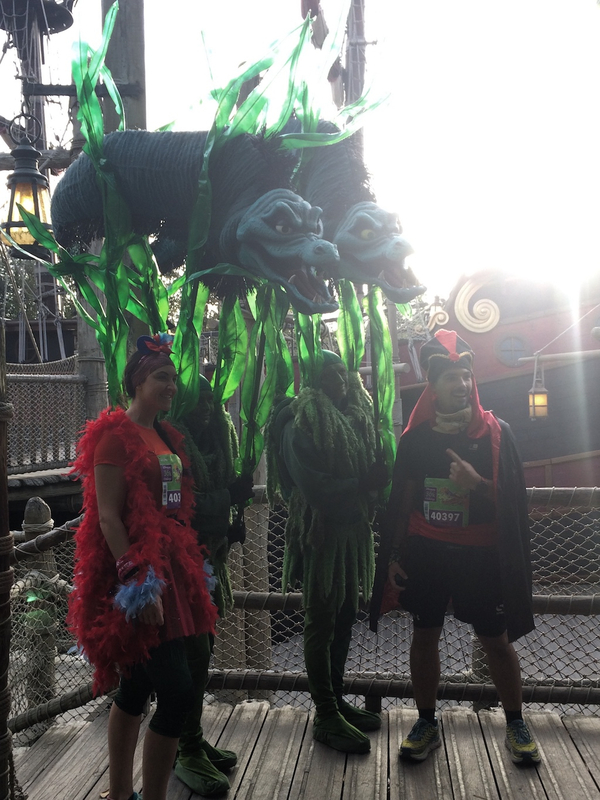 One of the best parts of racing at Disney is the chance to see backstage. 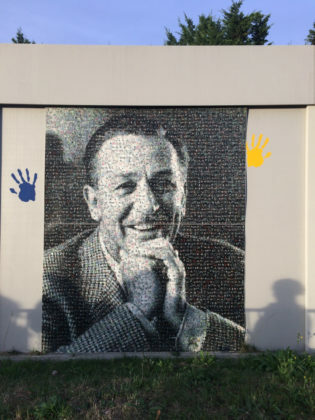 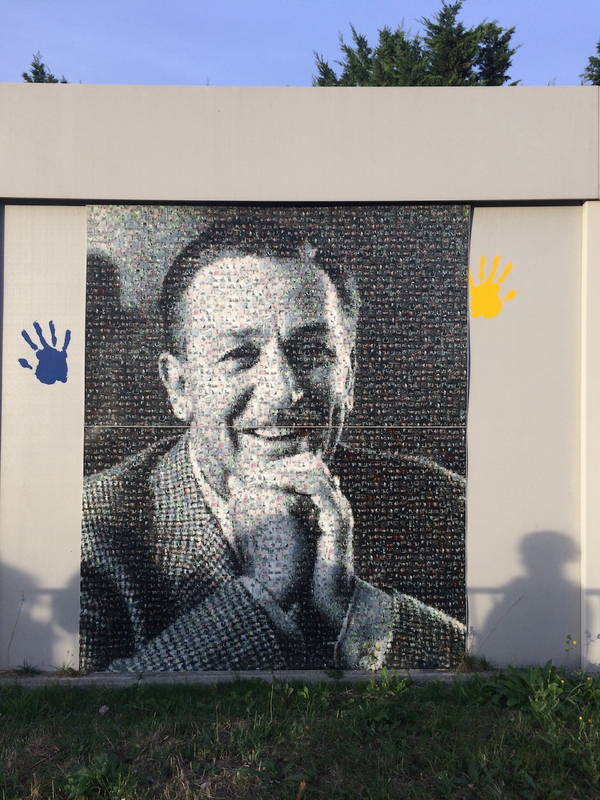 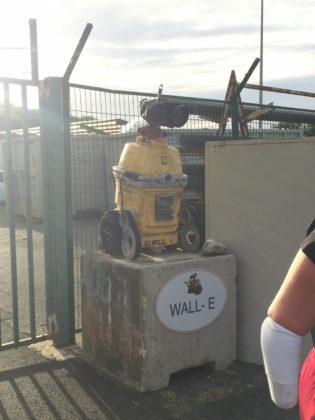 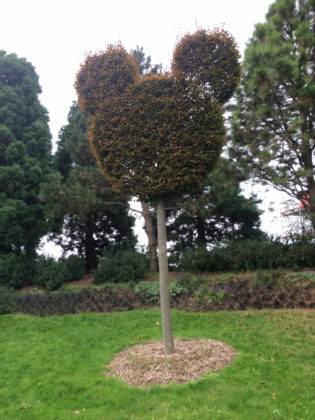 We all know that magic happens at Disney, but it’s not often that we get to see where it happens. 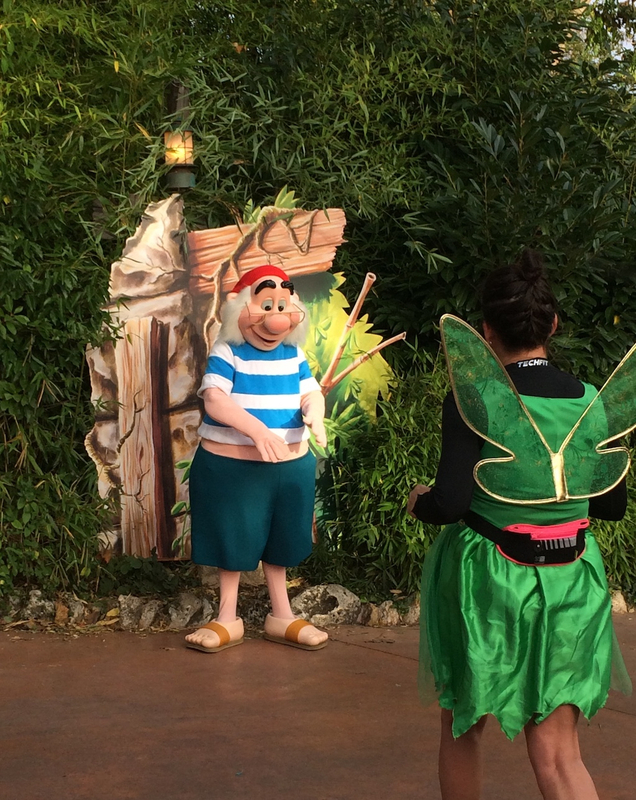 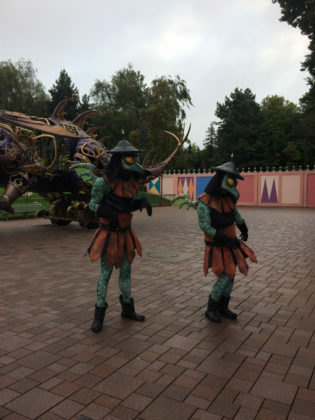 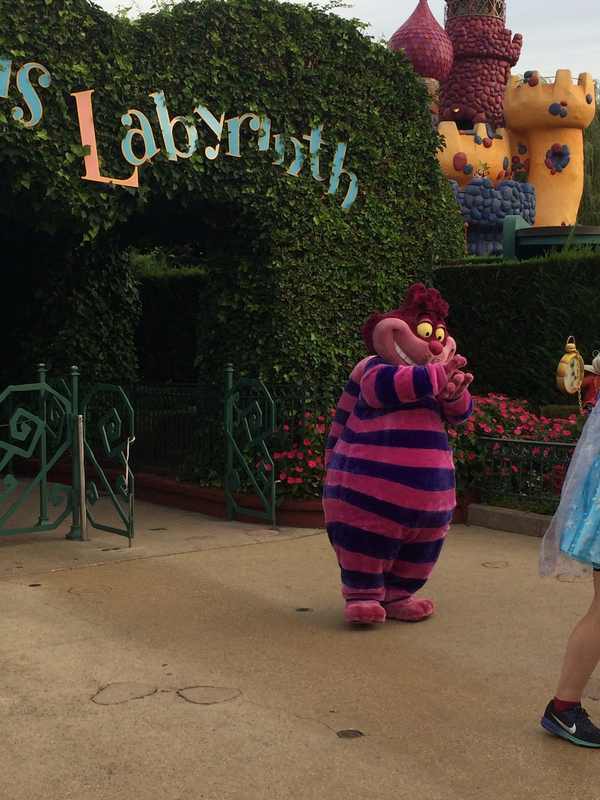 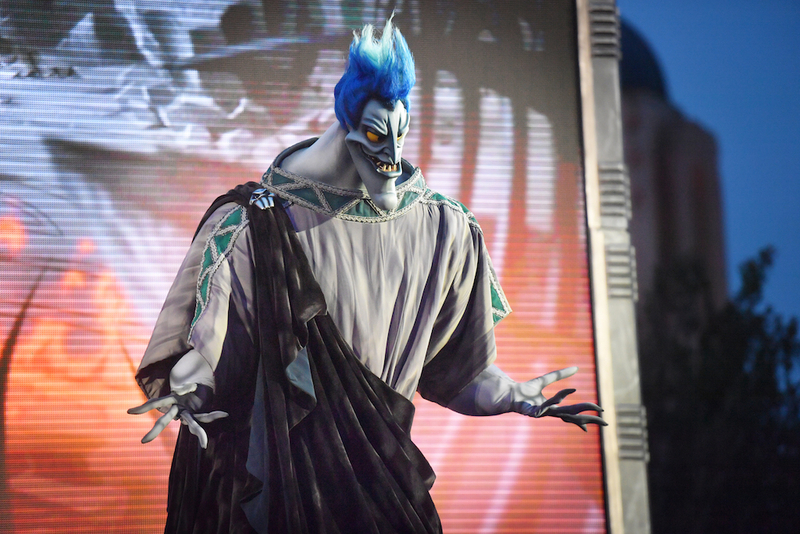 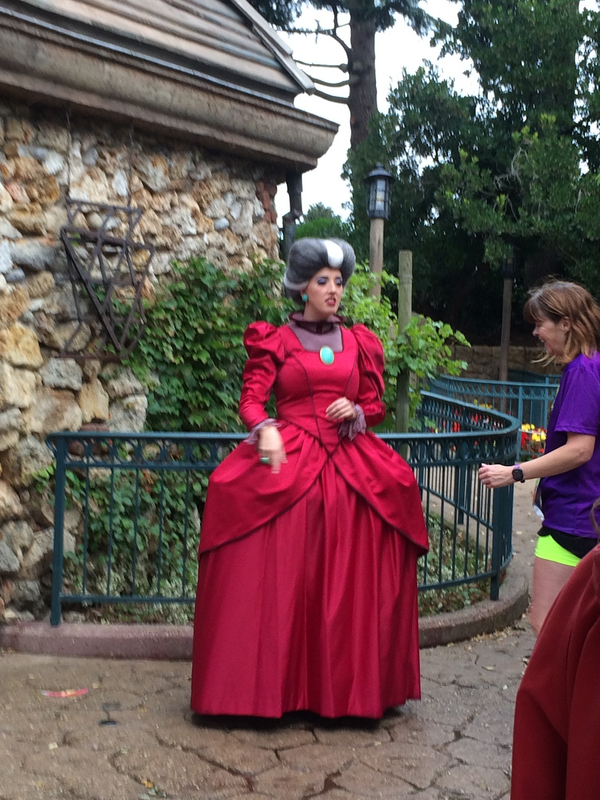 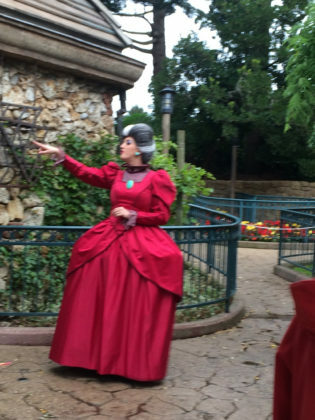 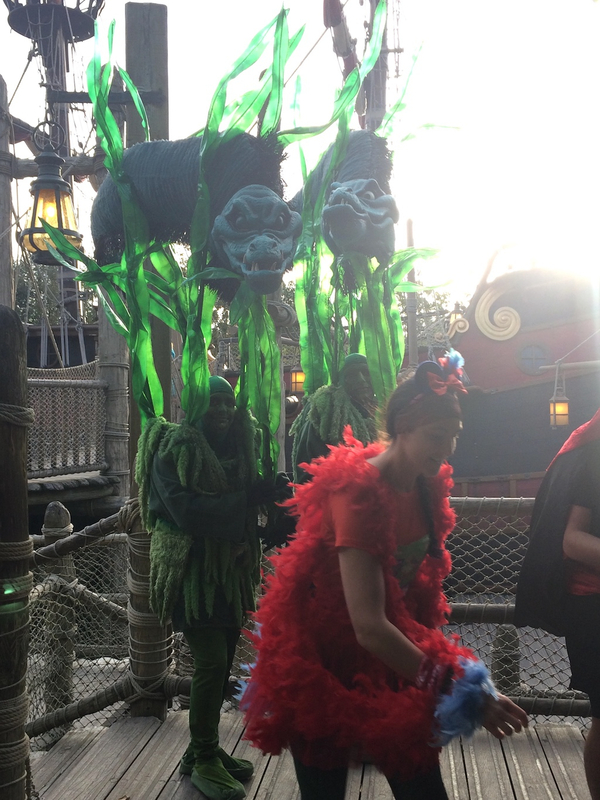 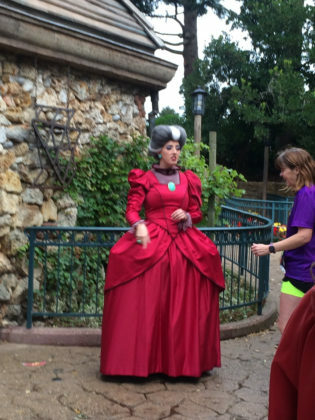 Turning fantasy into reality is not an easy job, yet Cast Members do it for guests on a daily basis. 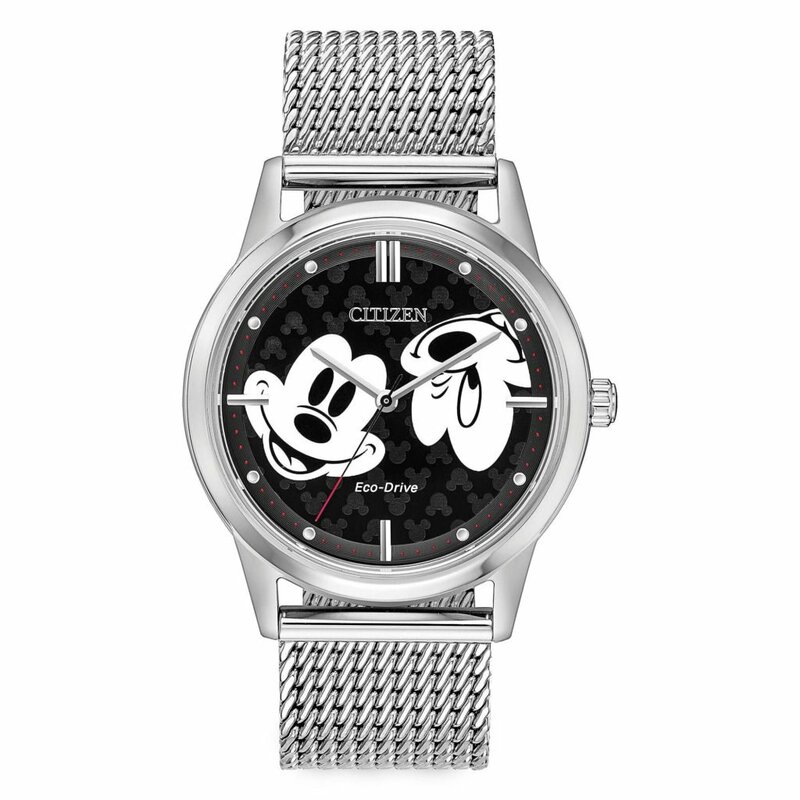 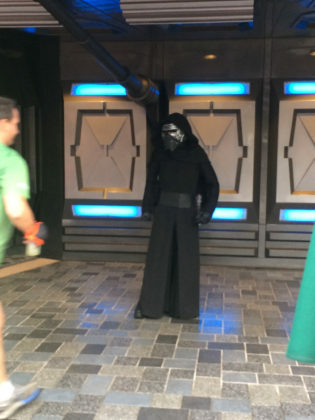 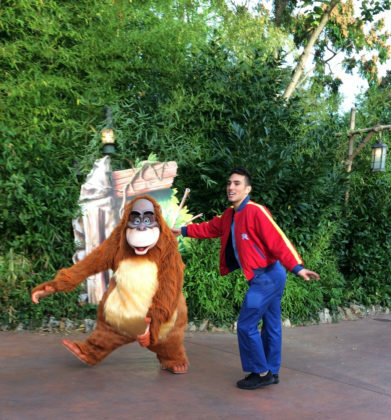 While it might not be as glamorous as being “on stage,” Disney makes sure that Cast Members get to have a little fun too. 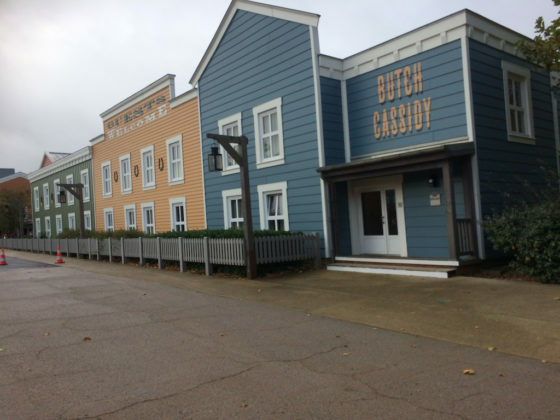 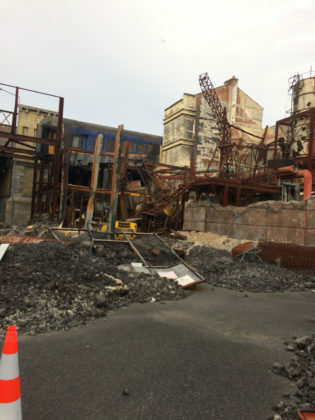 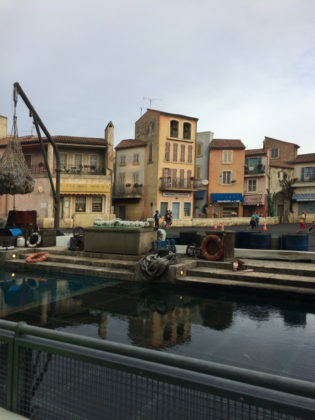 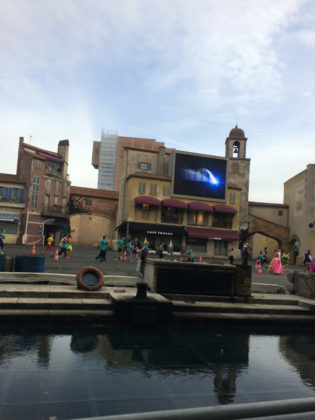 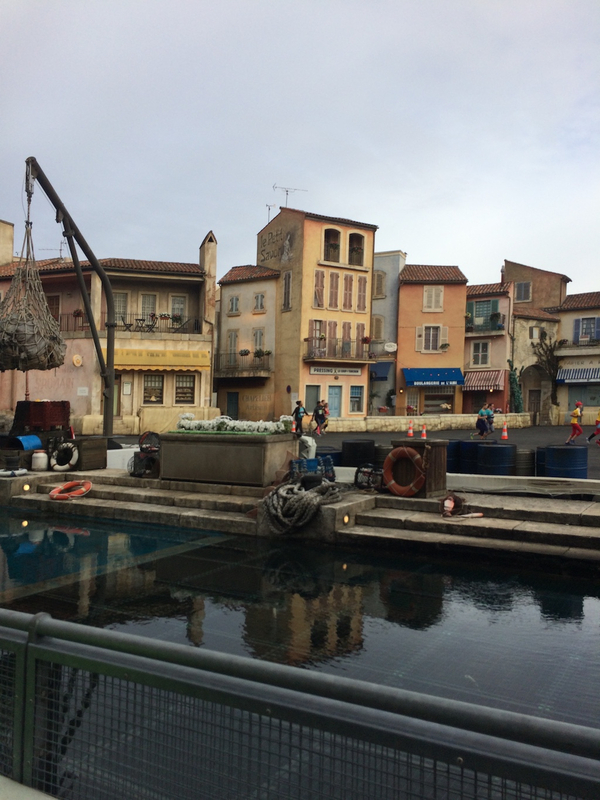 As for the race, running through the Backlot Tour, and Lights Motors Action! 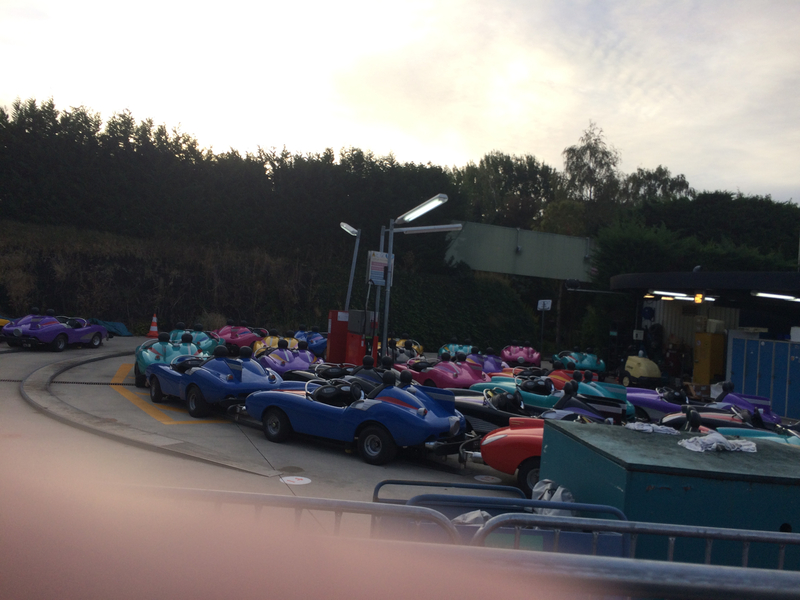 was a blast. I finished the 10k race in approximately 1:23:00. After I crossed the finish line I picked up my medal and then proceeded to get my post-race snacks. 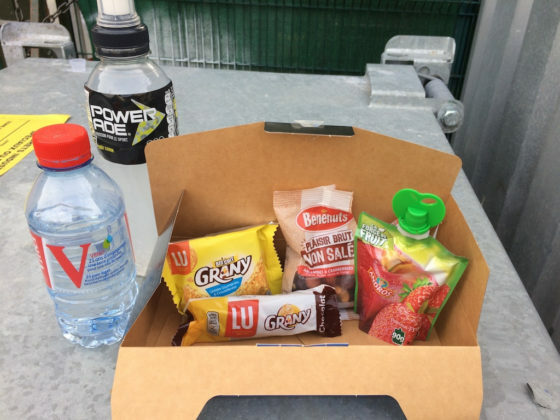 As with every other race I’ve done, there was bottled water, Powerade, bananas, and a snack box. This particular box contained mixed nuts and dried fruit, an energy bar, strawberry applesauce, and breakfast biscuits. 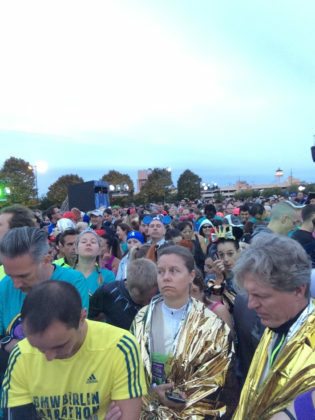 Runners could also pick up foil blankets, but I neglected to get one since I had a jacket with me. 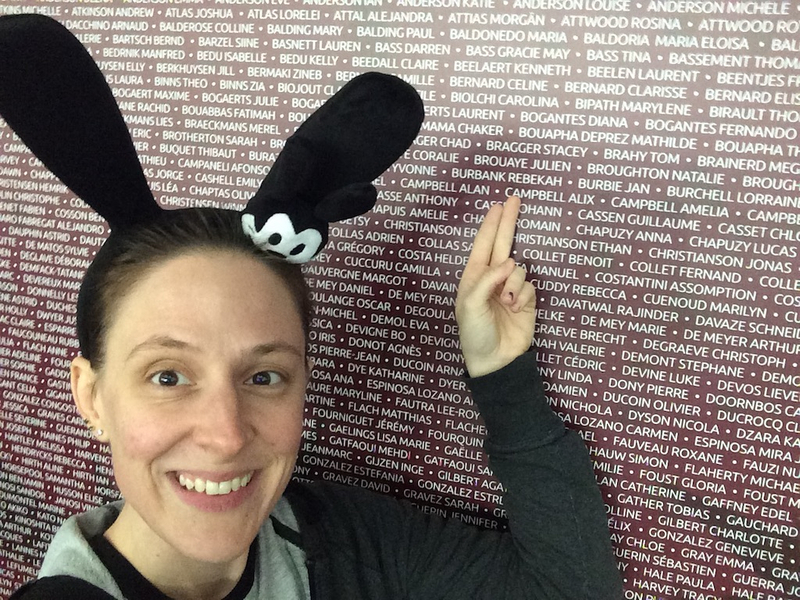 I didn’t need to go back to the Expo, but I ended up going anyway because I wanted another picture by the name wall. This morning it wasn’t as cold, but it was drizzling rain for about two hours. 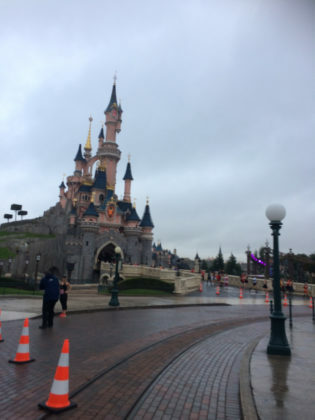 That along with some gusty wind made for in interesting day. I brought my light jacket with me and tied it around my waist for the race. 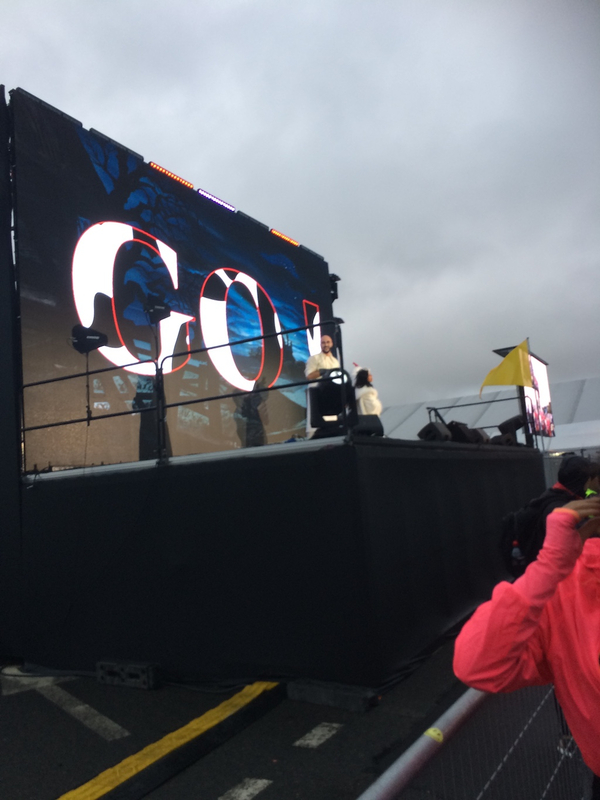 Once again I was in the last corral and a little closer to the front although not by much. 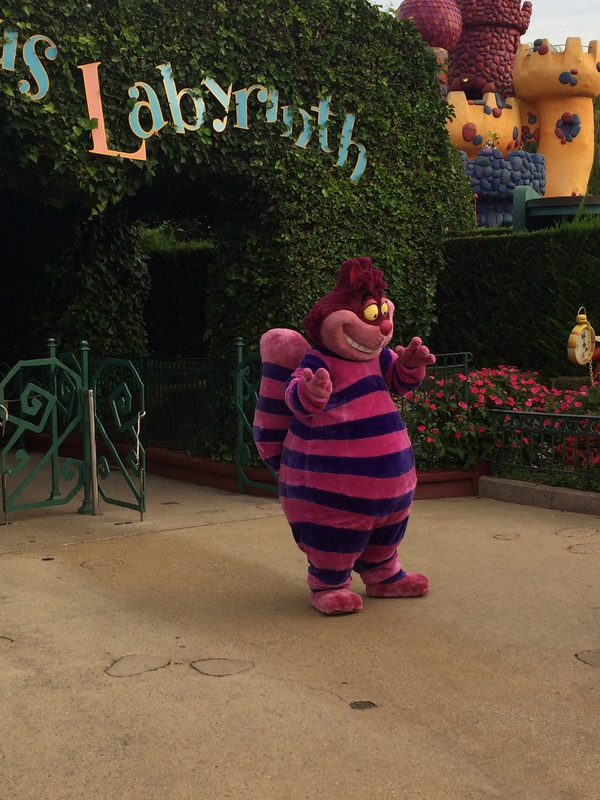 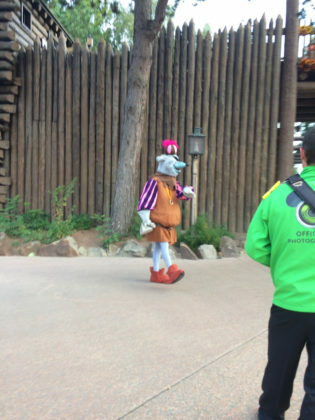 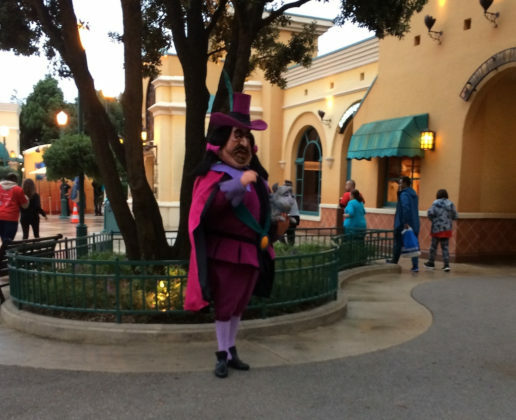 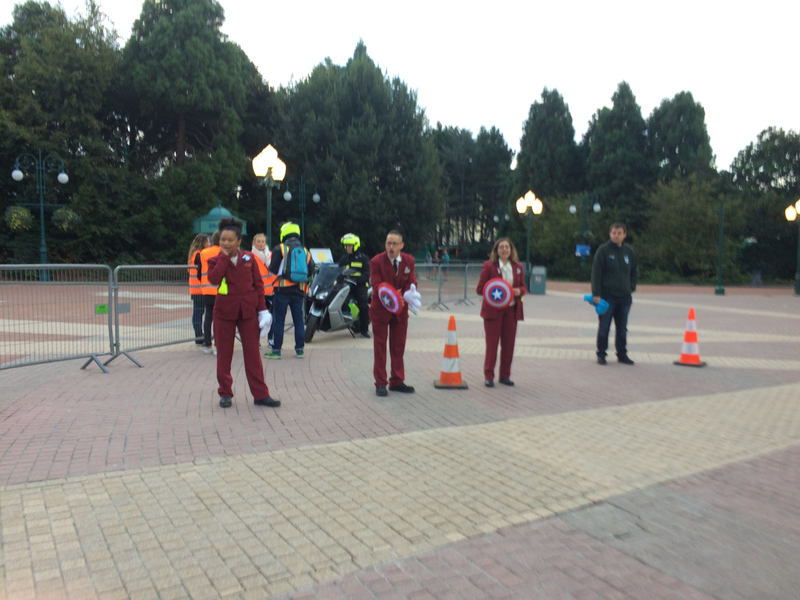 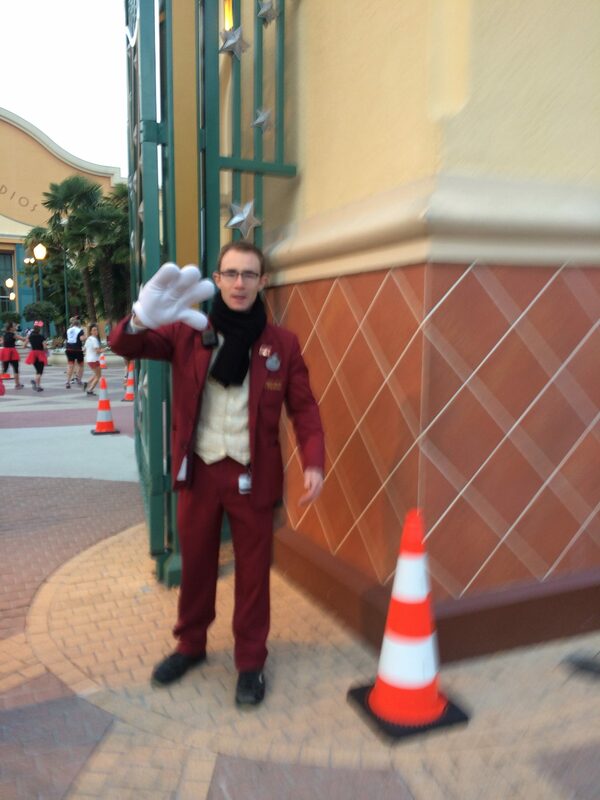 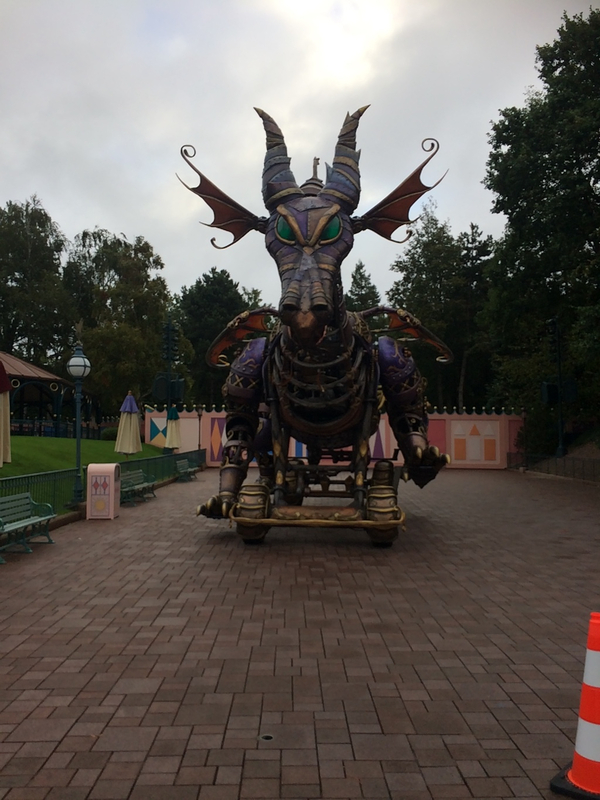 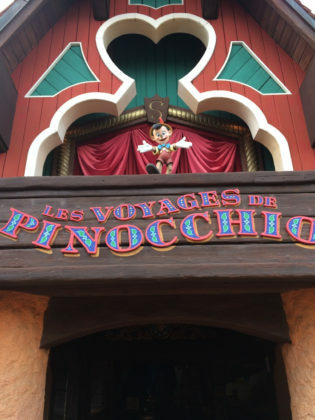 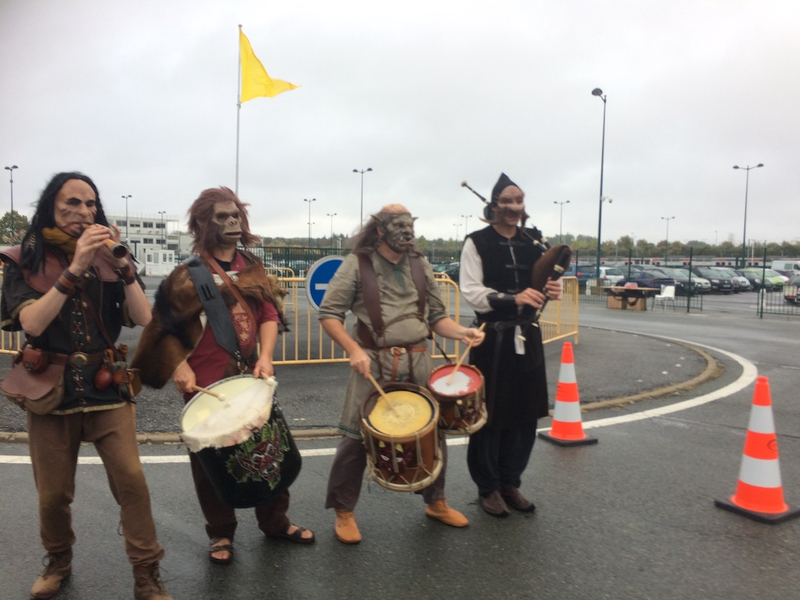 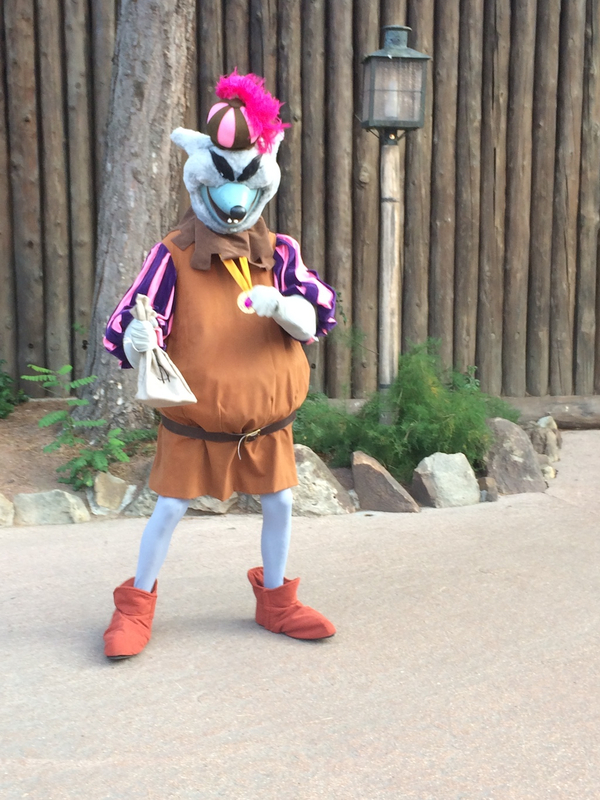 A Cast Member greeted us again as well as Disneyland Paris Vice President. 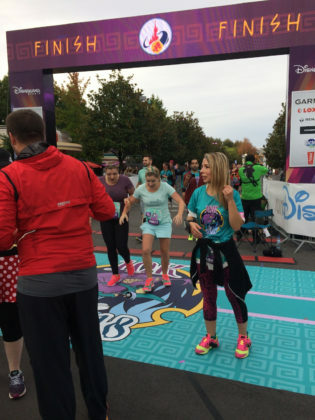 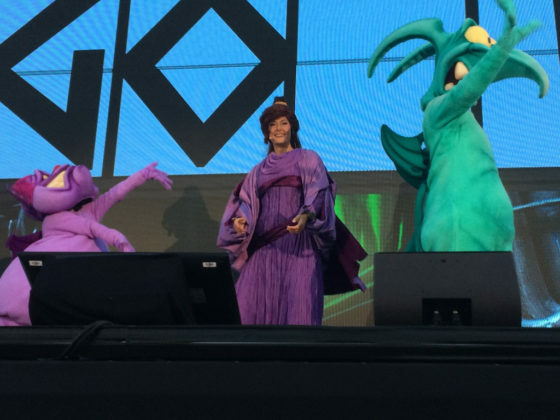 A runner in the first corral was celebrating his 10th wedding anniversary and runDisney arranged for his wife to come out on stage. He joined her for a brief moment before the race started. 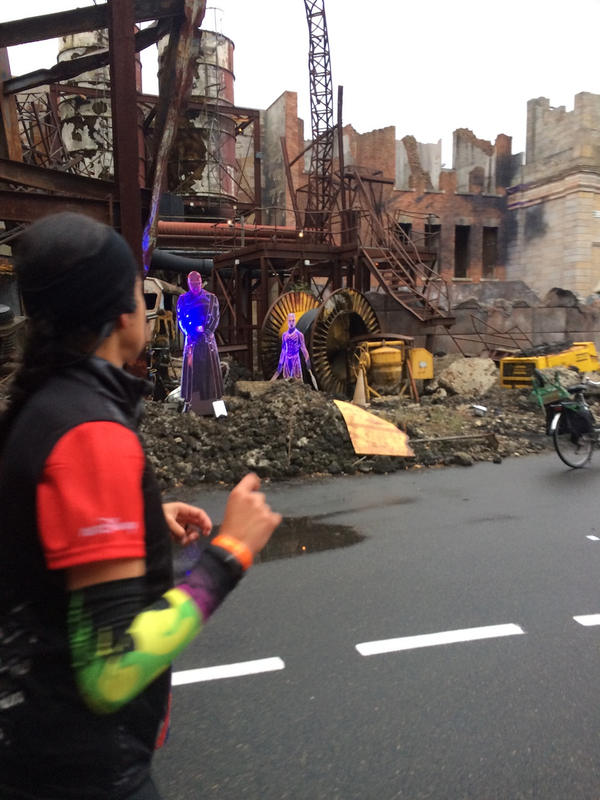 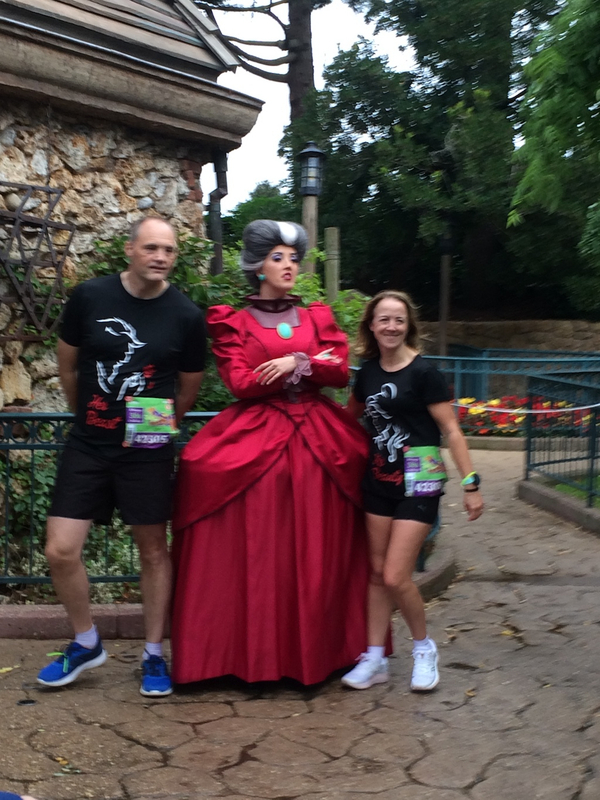 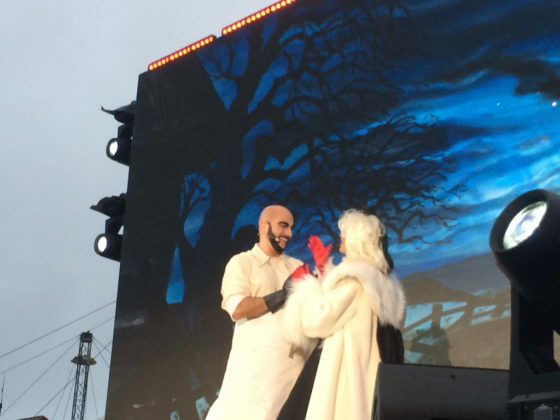 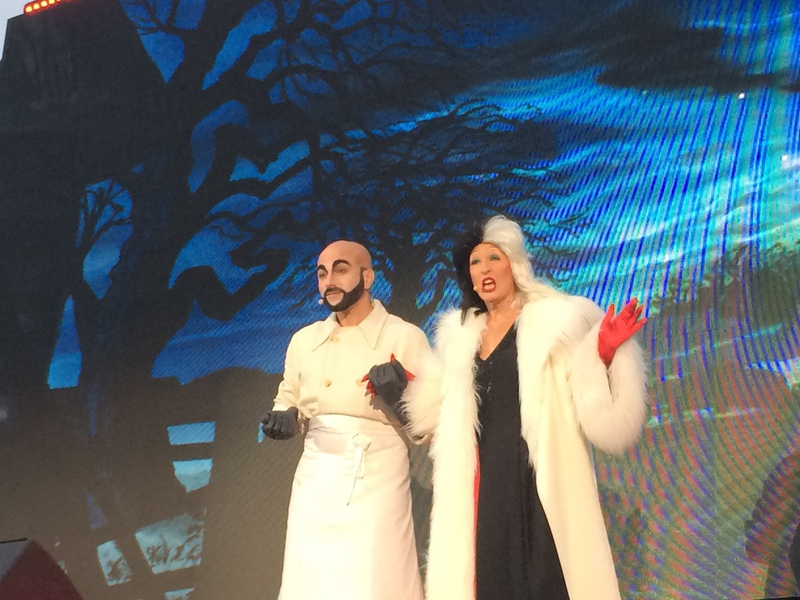 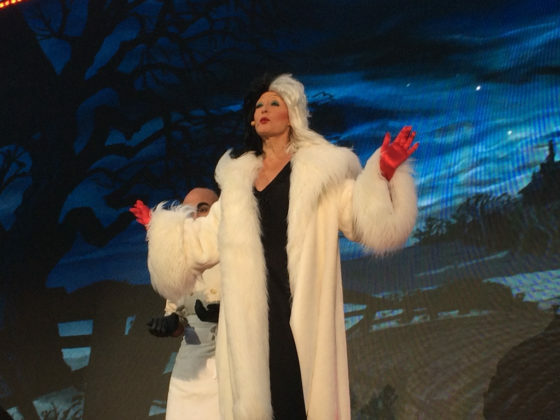 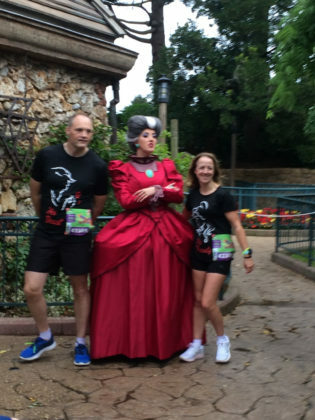 Then Cruella de Vil and a doctor friend came came on stage and decided they wanted to conduct “experiments” by sending all of us out for a run. 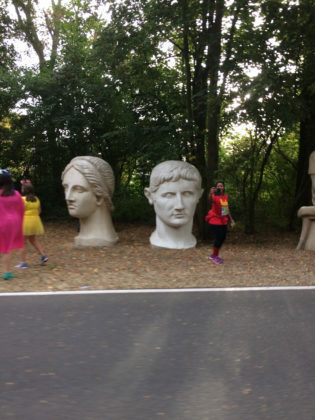 They laughed among themselves saying we’d never be seen from again. 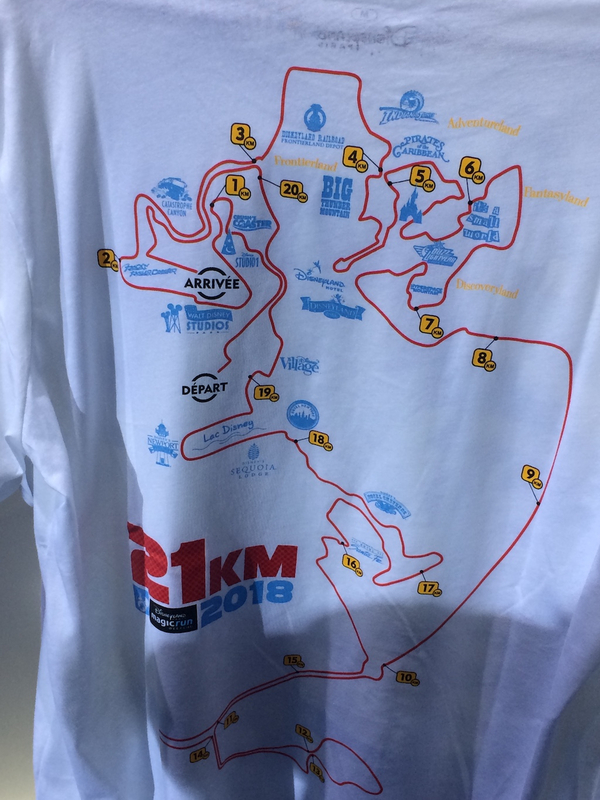 This was one heck of a course and one of the best I’ve run. Had there been no rain, and a little less humidity, I would have said it was the best ever. 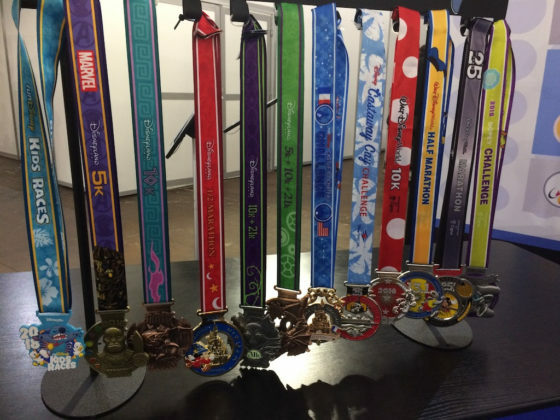 Upon crossing the finish line, each runner received their half marathon medal. 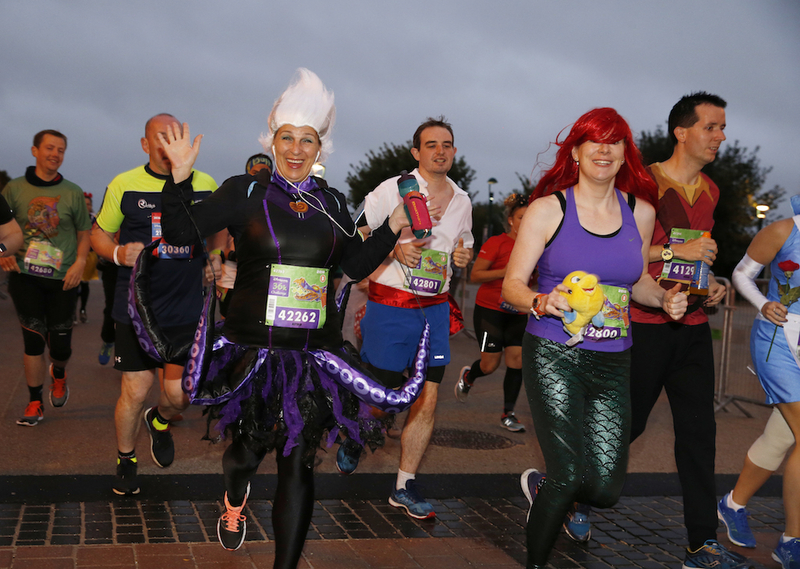 Once again there was water, Powerade, Lactel (Coffee/milk beverage), bananas, snack boxes and the foil blankets. 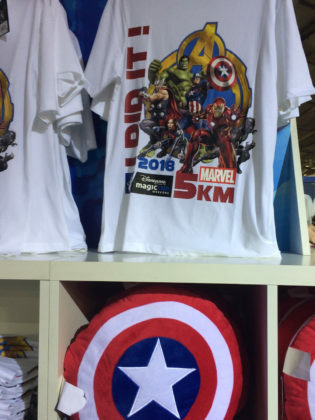 This time I grabbed a blanket! Unlike the California races, in order to get their Challenge medals, runners had to return to the Expo. 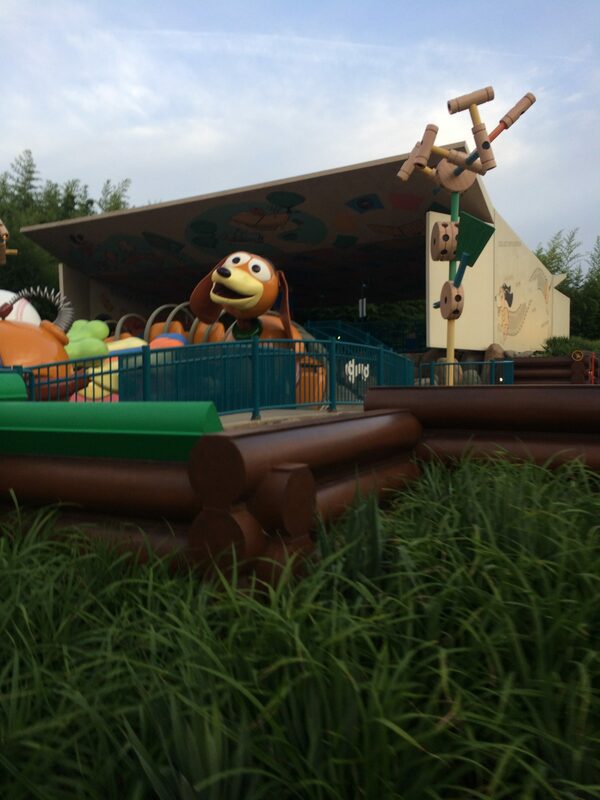 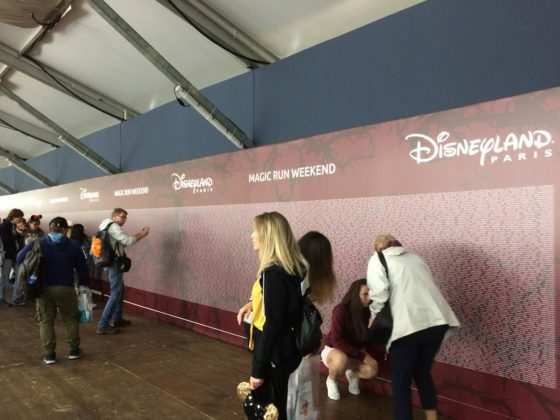 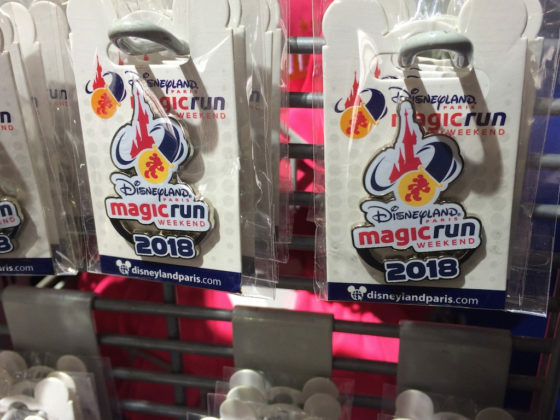 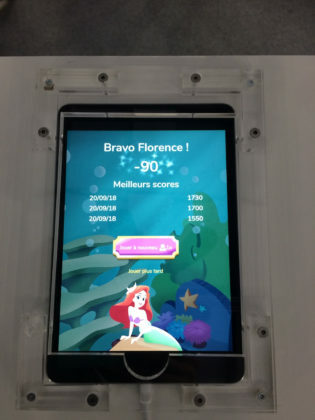 Being that the finish line was in the Park, the bonus medal pick up would take up too much space and keep a section of the Park closed to guests for a longer period of time. 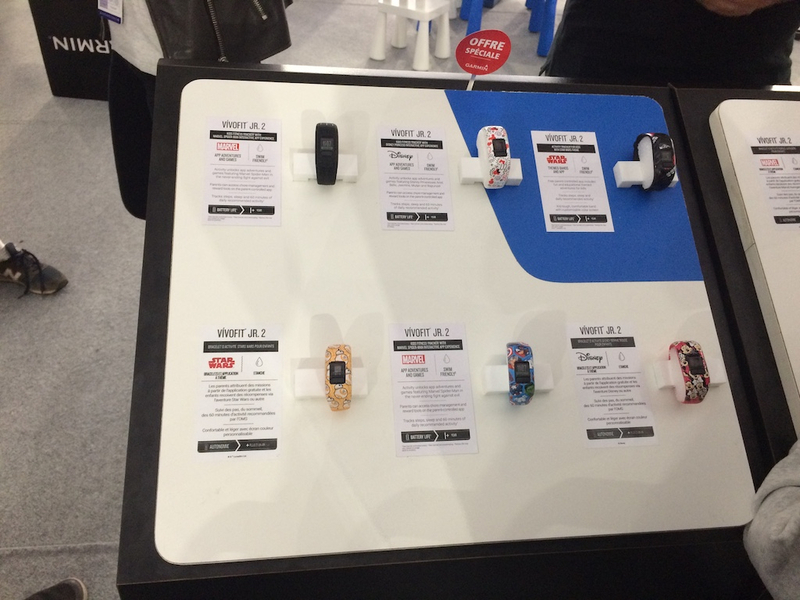 It also seemed really smart, because it ensures that participants keep walking/moving after the race. 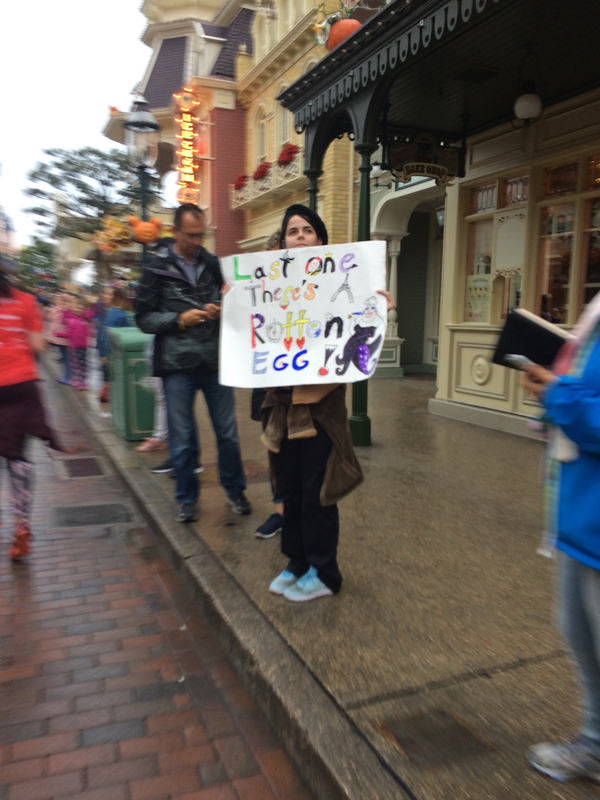 But there was a part of me that didn’t appreciate this extra step. 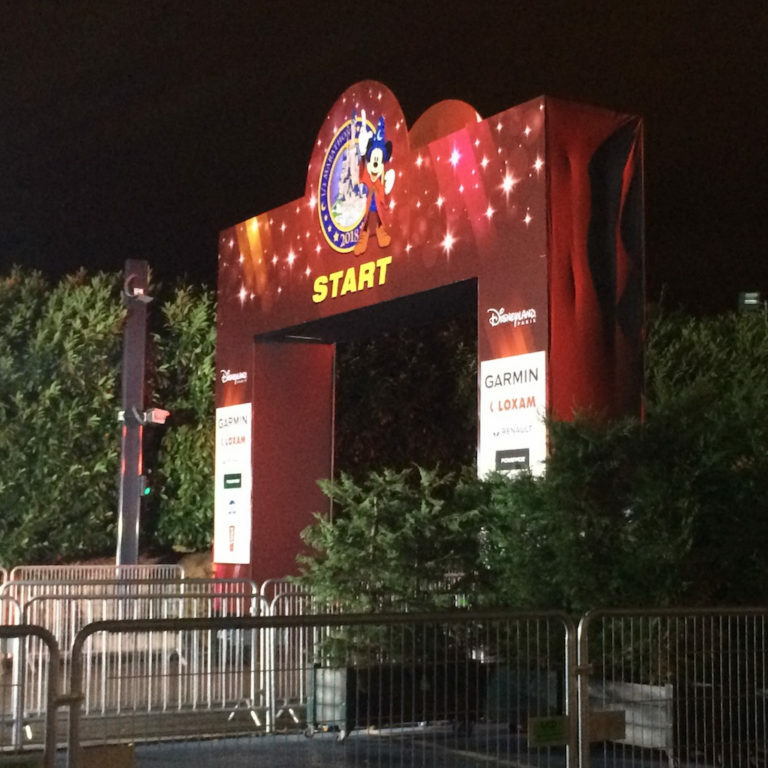 What I liked most about this race weekend was that we were able to cover a lot of ground just on Disney property. 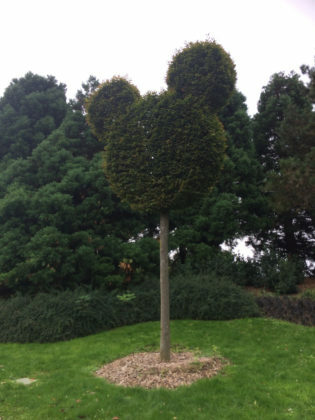 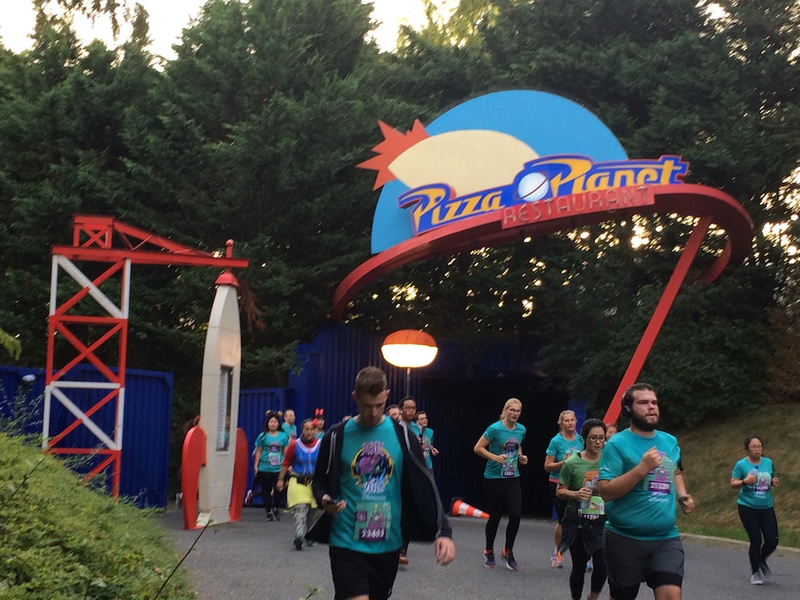 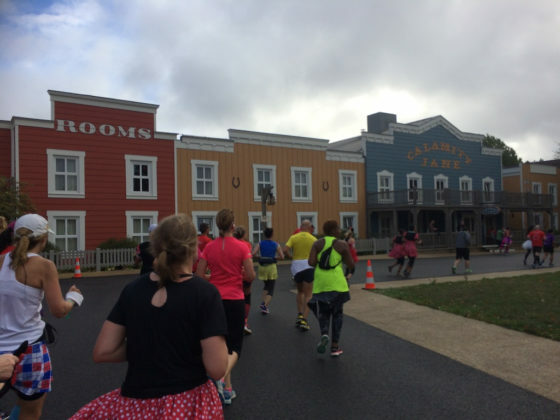 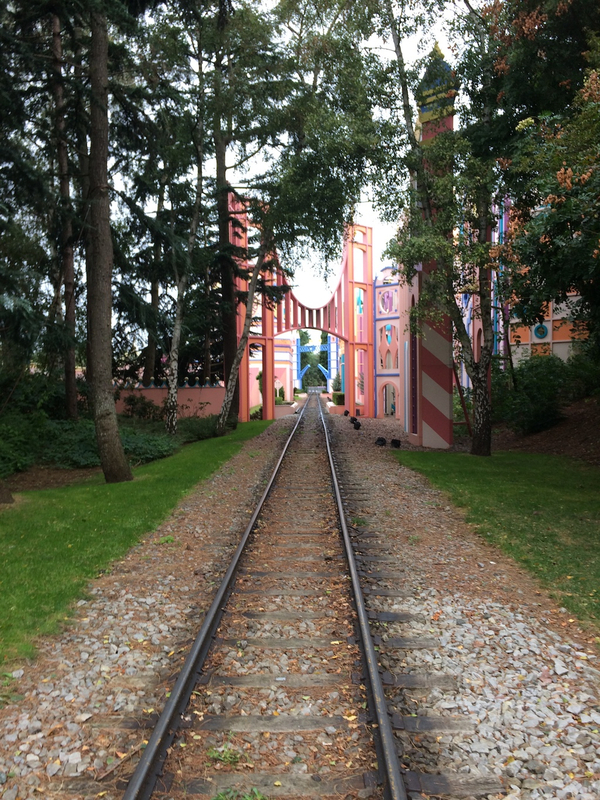 In fact, the entire 10k took place between the two parks and ended in Walt Disney Studios Park. 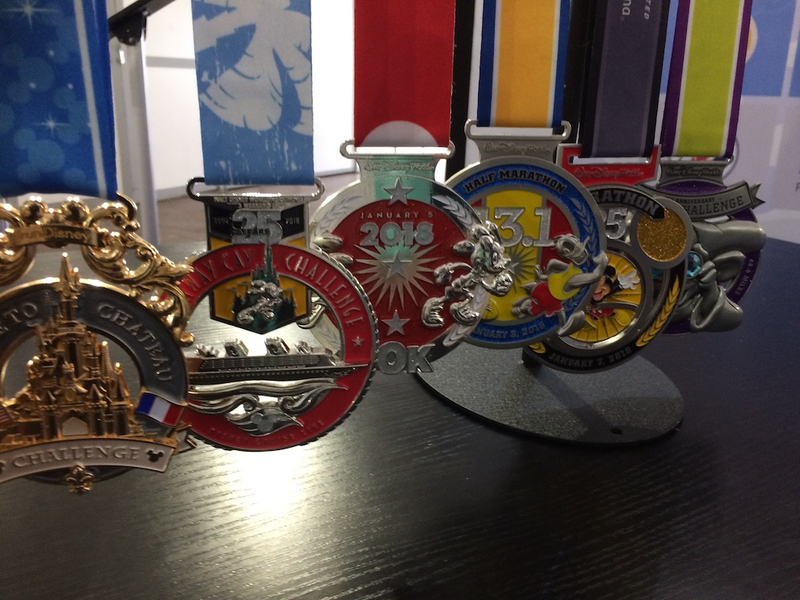 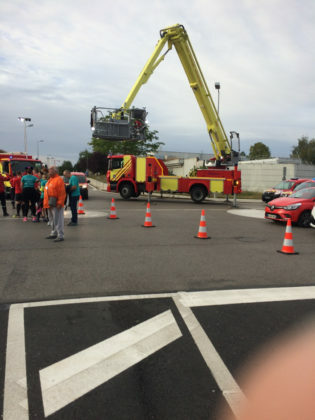 That in and of itself was amazing and running through Val d’Europe for the half marathon was a great experience too. The race was marked in kilometers instead of miles which meant signs popped more frequently, but they also gave my non metric brain a false sense that I’d completed more of the race early on. 10k already? 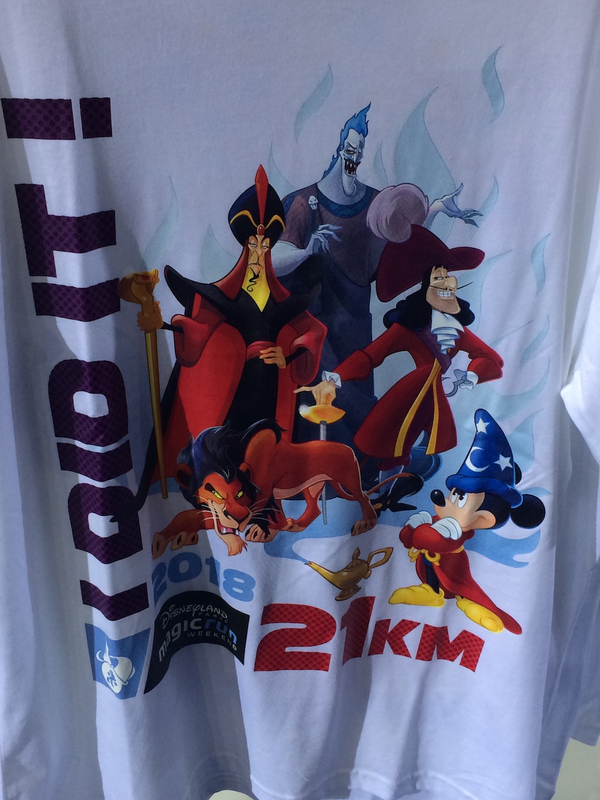 Nice just 3 miles to go…wait a minute that doesn’t sound right! 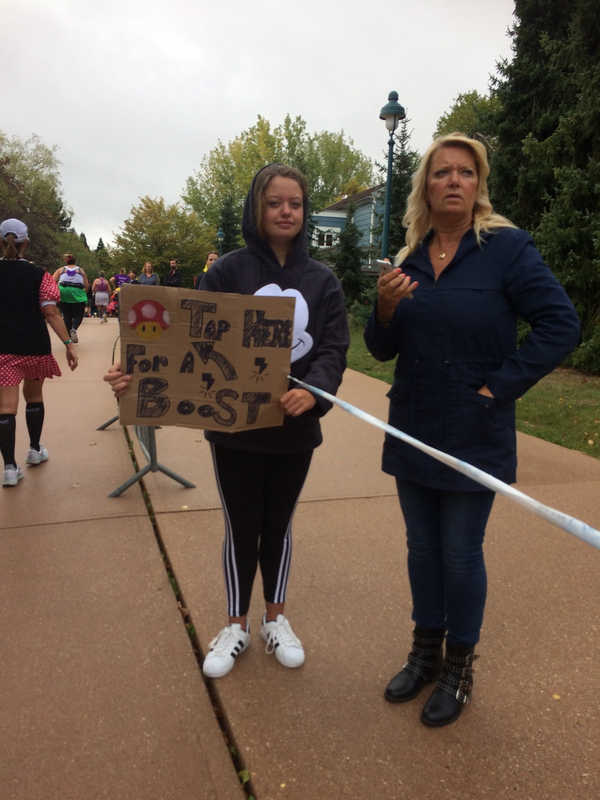 They did have markers out at 3, 6, 9, and 12 miles to help us imperial systems users track the distance. 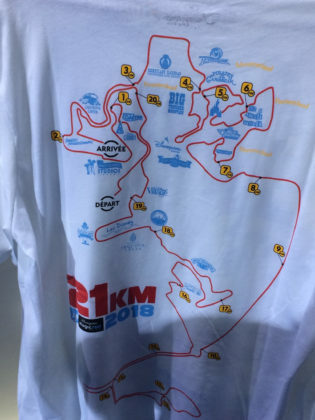 Also, it felt like this race had more water stops than the others and they handed out energy bars at three stops instead of just one. 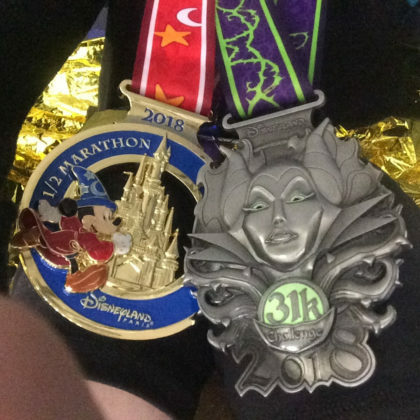 Another key difference was runners only needed proof of time for under two hours. 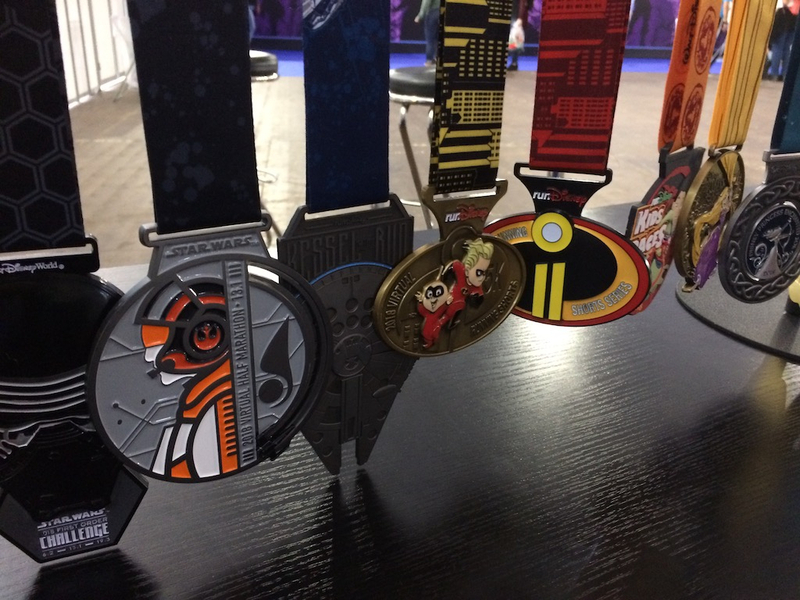 To me, this felt like the most serious of the runDisney races. In California, even for the 10k, you had to run on the streets of Anaheim. For their half marathons, runners would cover about 9 miles within the city, which meant fewer exciting sights. 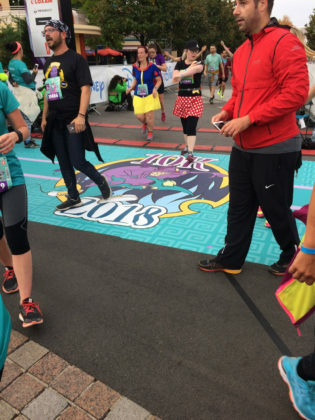 However California gets one point in their favor because nothing beats running through Angels Stadium. Utilizing as much of the stadium parking lots and field as possible took up more than a mile and it was so much fun you didn’t realize all the distance you’d covered. 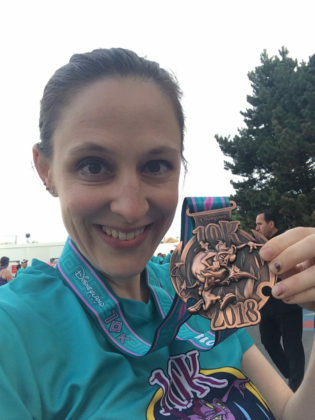 California also had incredible running weather: sunny, cool, and dry. 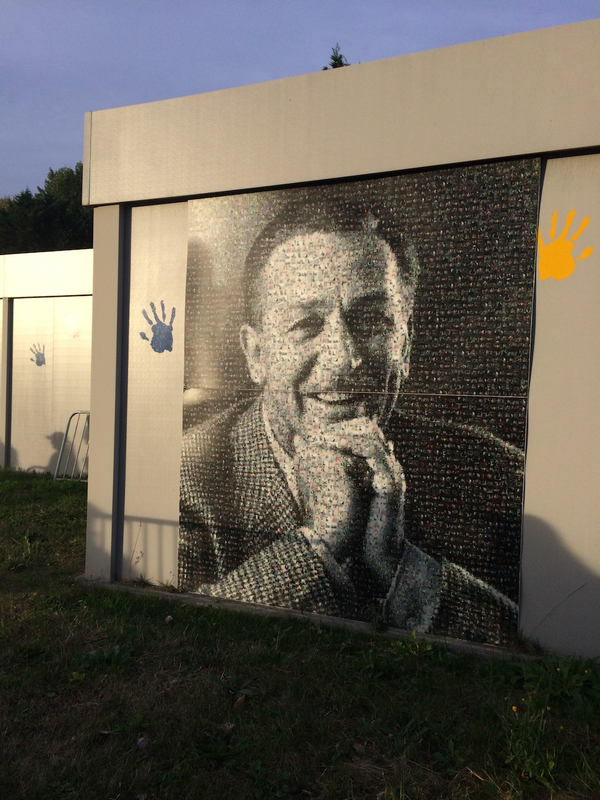 With four parks and a sports complex to use, guests never set foot off Walt Disney World property. 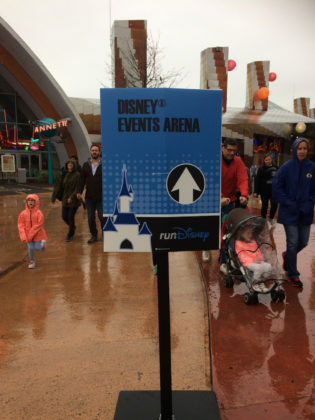 However, their half marathon requires street running to get between parks and you don’t realize just how far apart everything actually is until you’re running that distance. 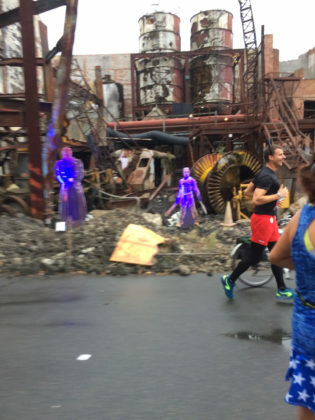 Plus, it’s humid, even when it’s not hot there’s just something heavy about the air. The only races I’ve done at WDW were at night, giving them the award for “cool factor” but those days are now over. 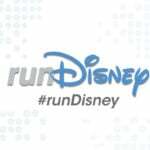 I love runDisney and as long as they are hosting races, I’ll be participating. While they are more laid back than some city marathons, they aren’t easy. 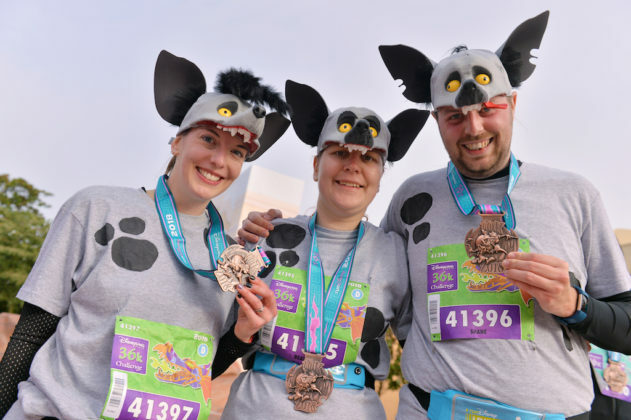 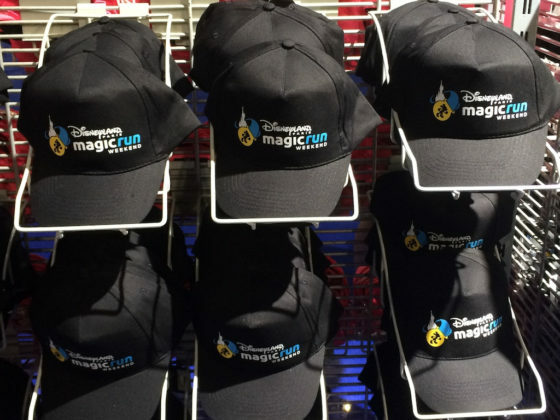 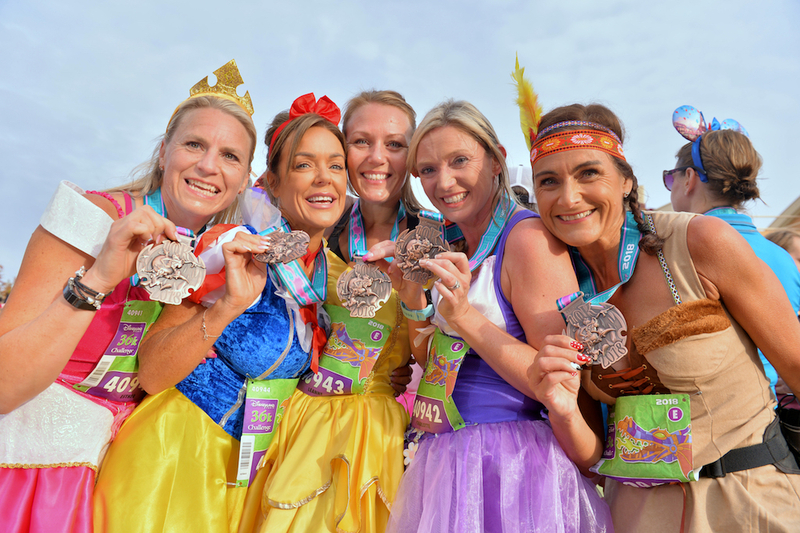 What runDisney has going for them is simply magic. Their slogan is “every mile is magic” and it’s completely true. 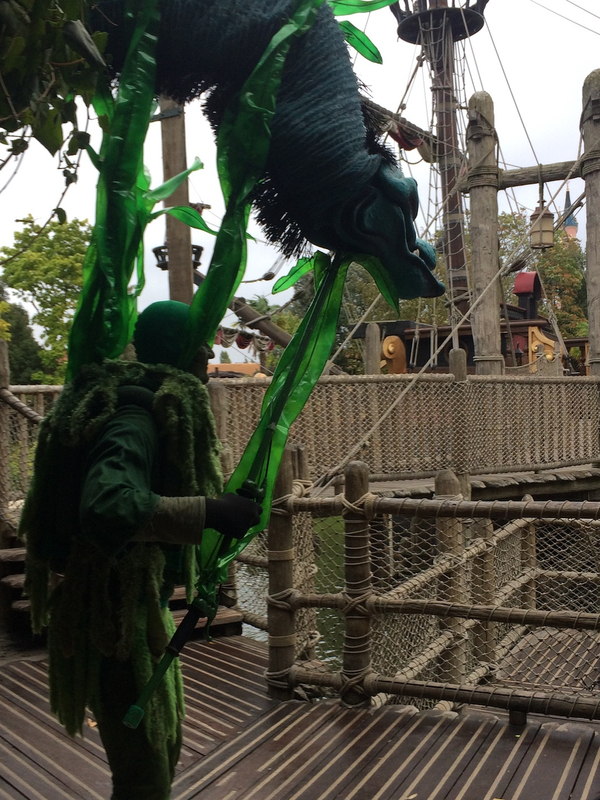 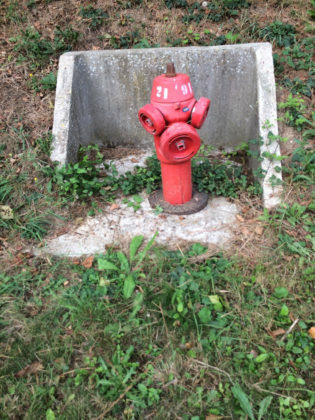 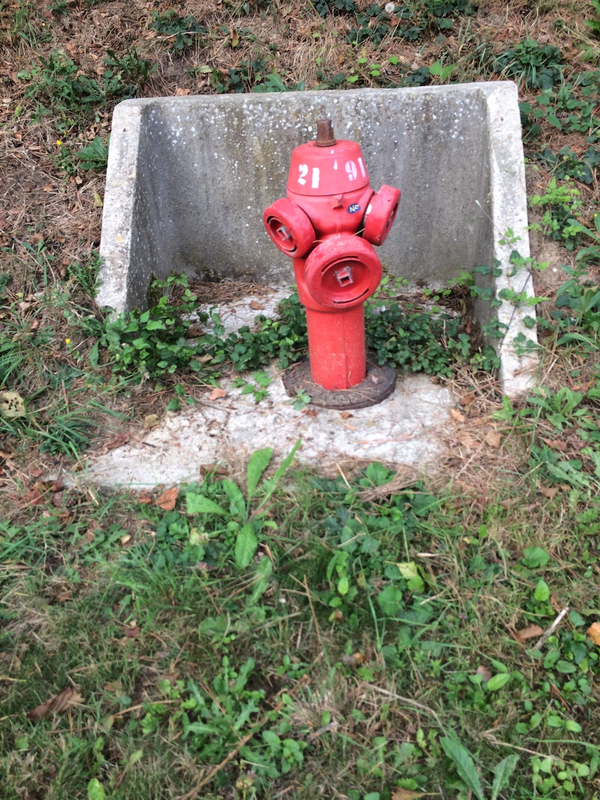 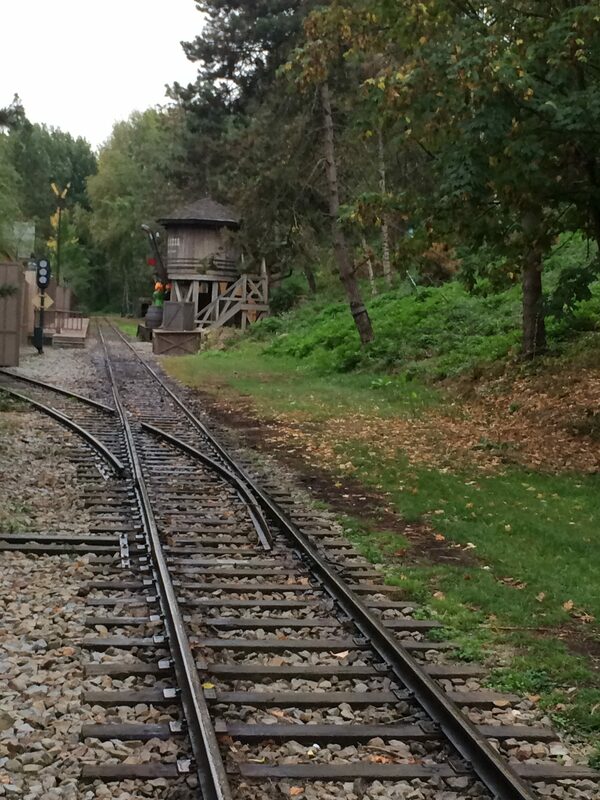 An exciting surprise is waiting around every turn and I’ll keep running until I’ve seen everything.